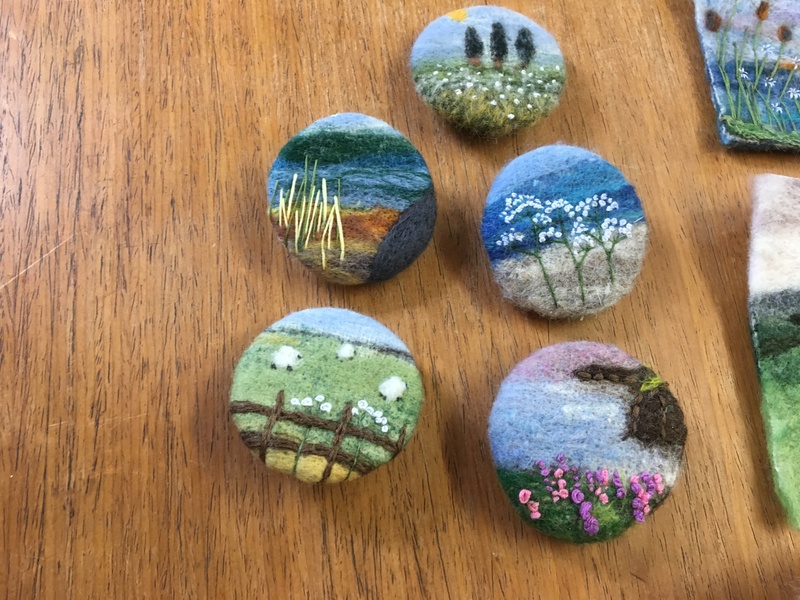 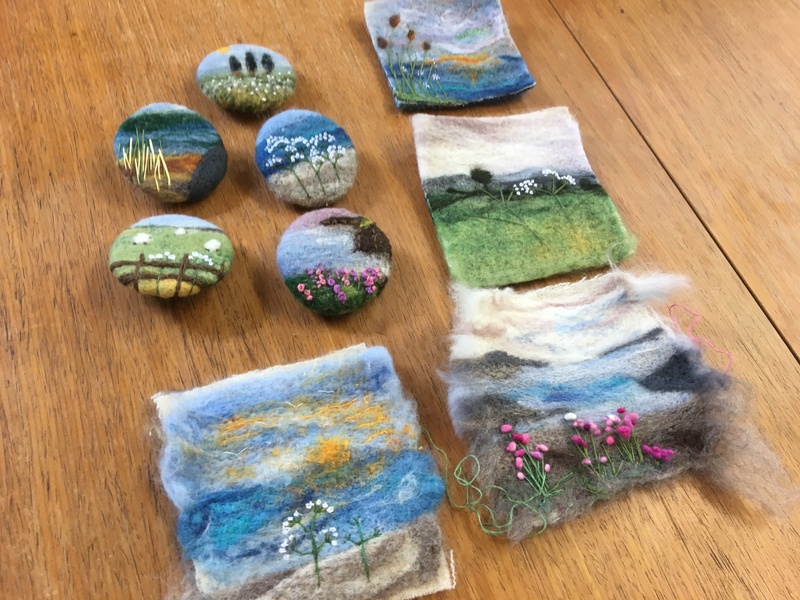 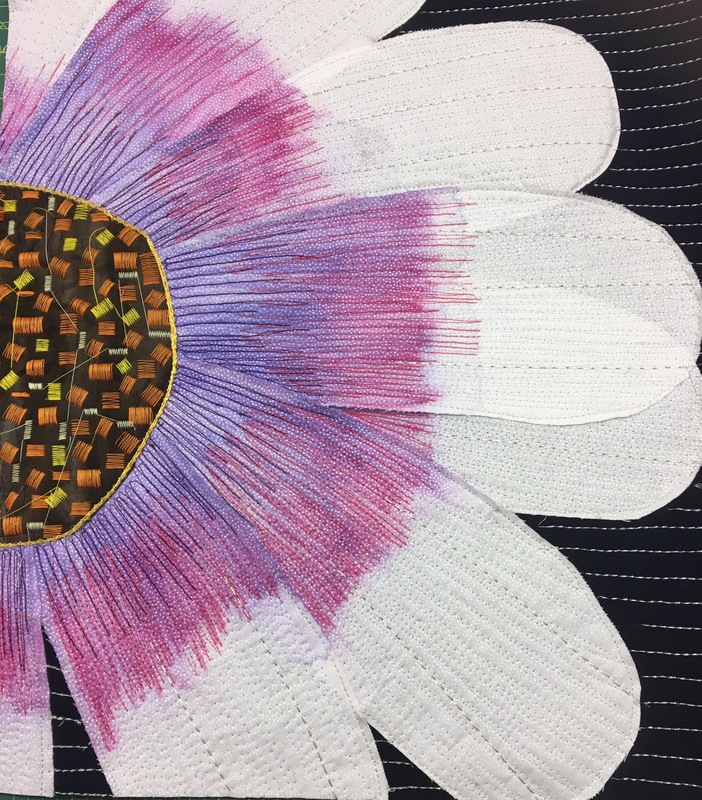 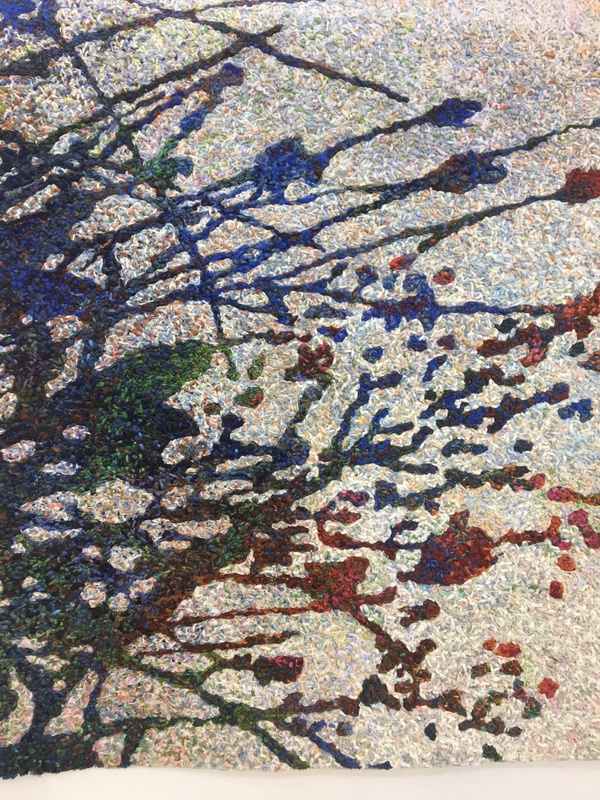 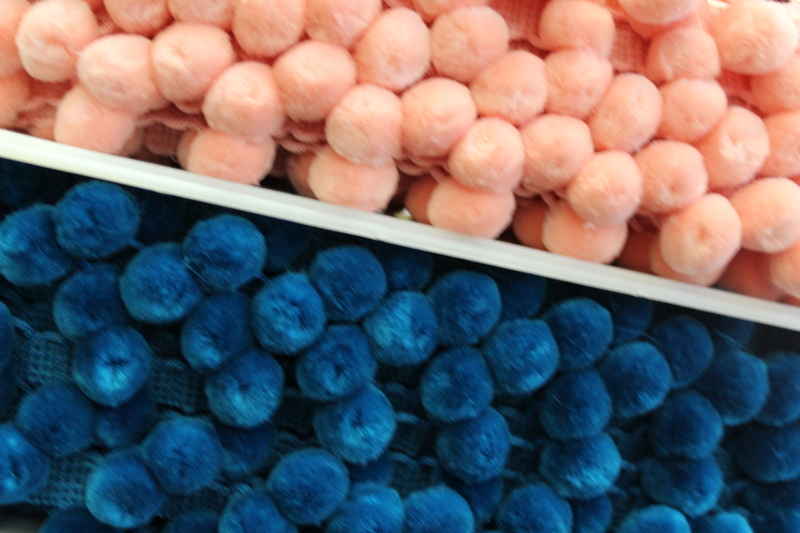 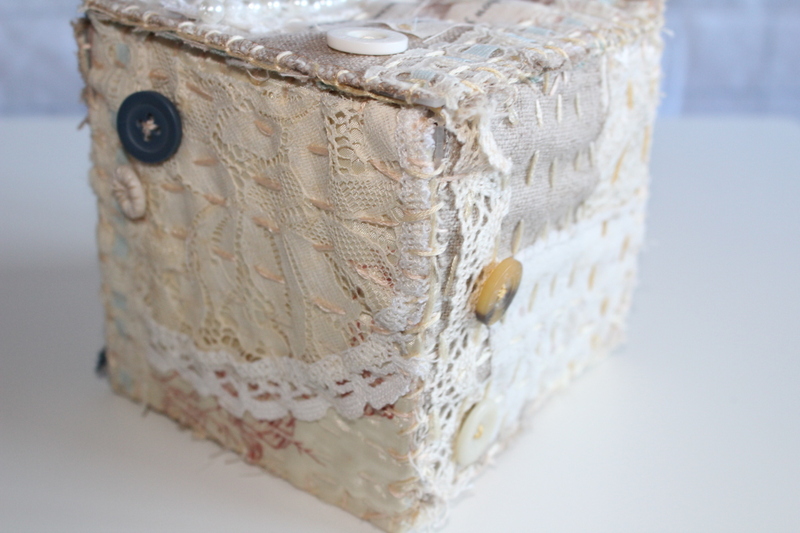 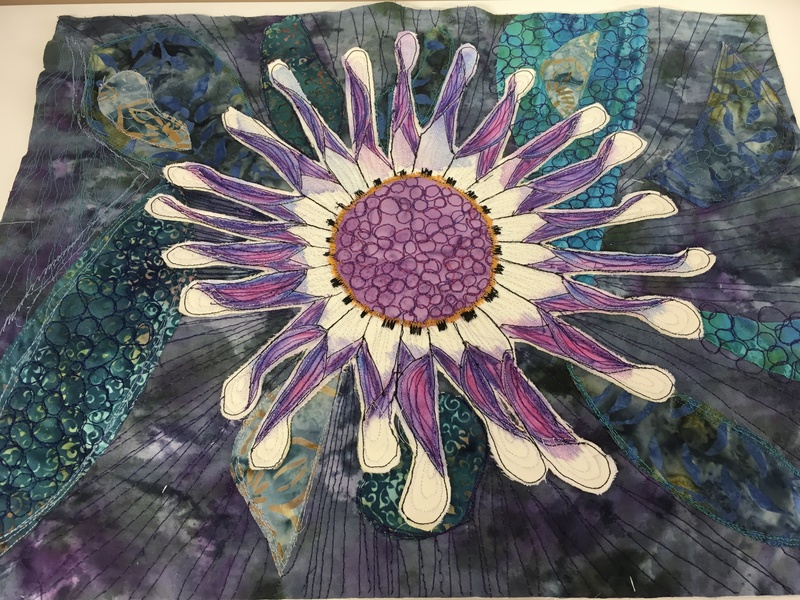 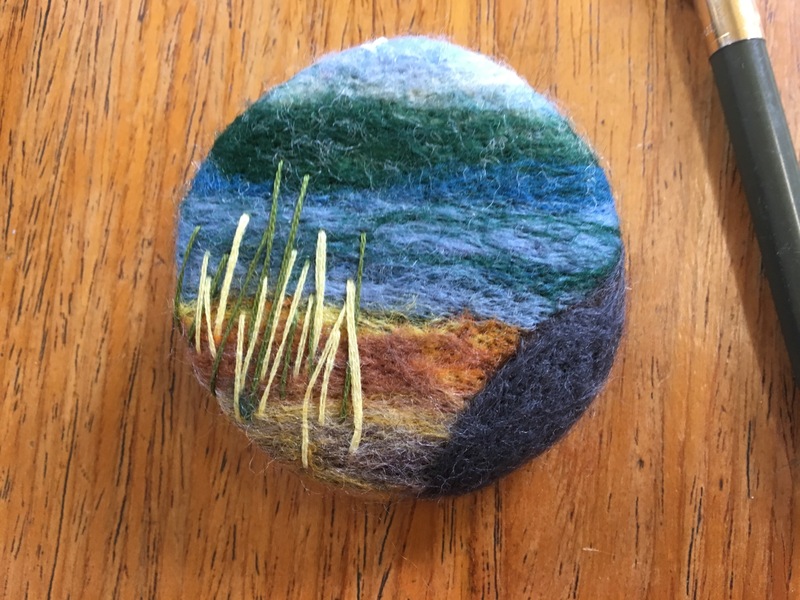 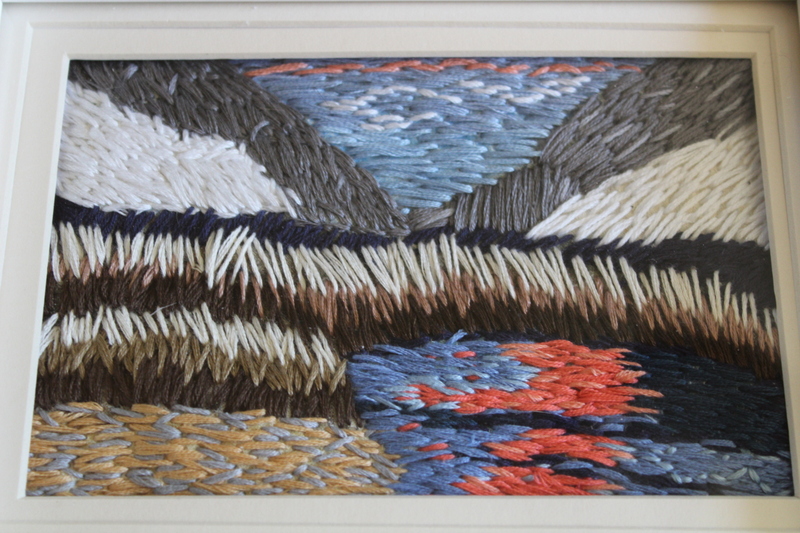 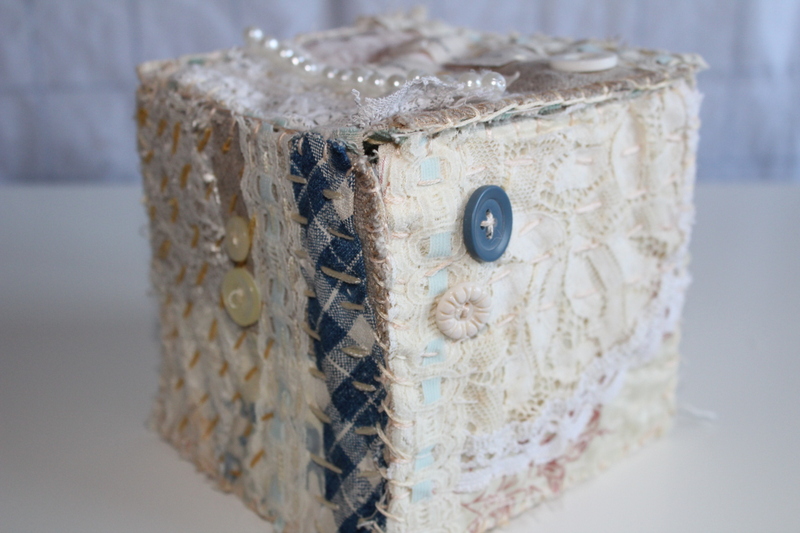 textile artist – The haberdashery Blog. 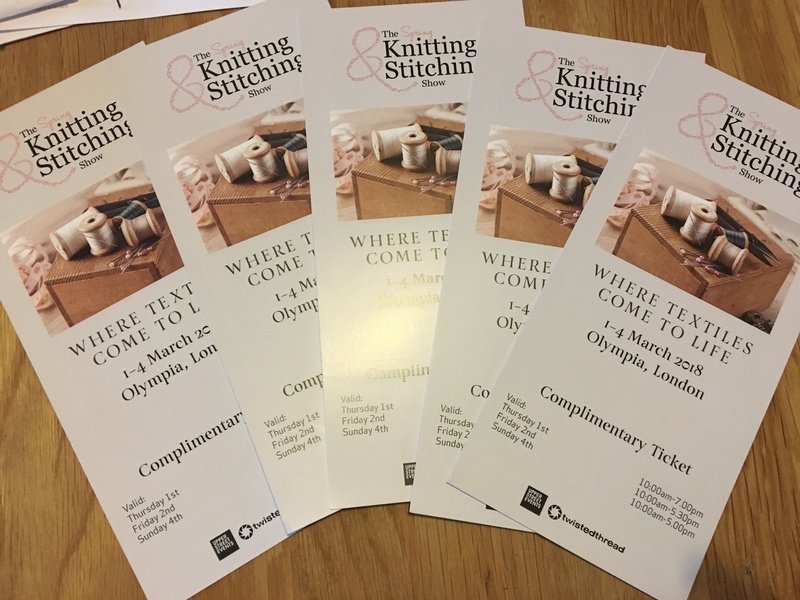 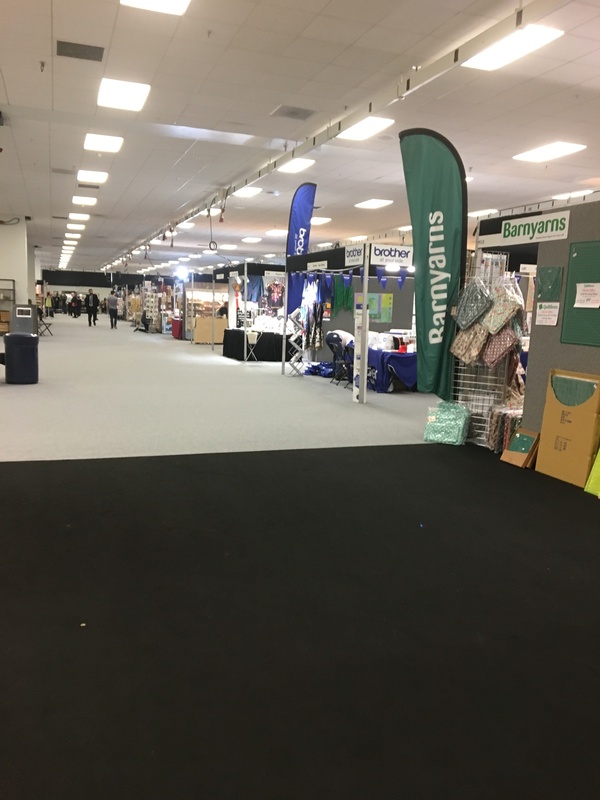 I’m now back from the Spring Knitting and Stitching Show at Olympia Stadium. 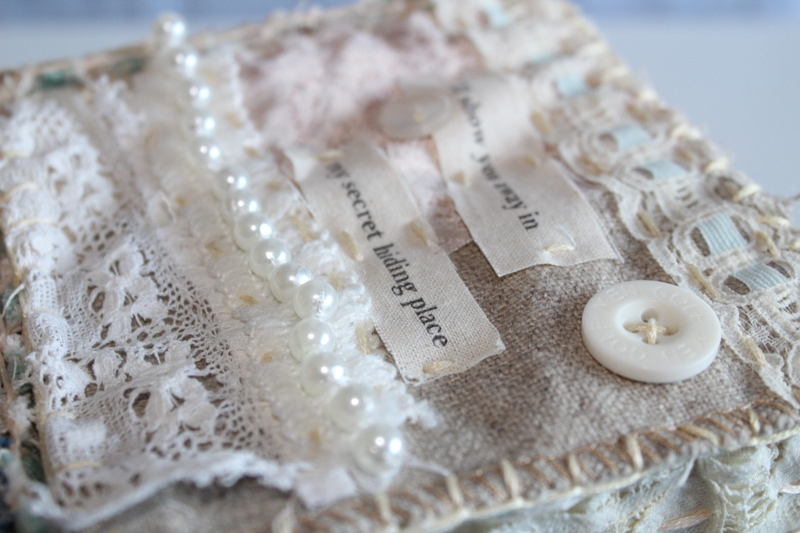 I had three lovely days teaching there, I met some fantastic people and it was so lovely to see familiar faces too. 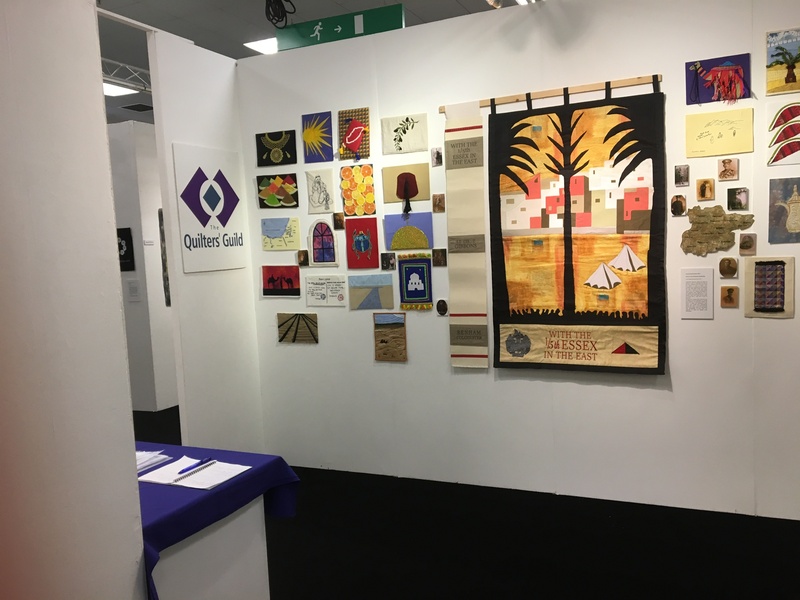 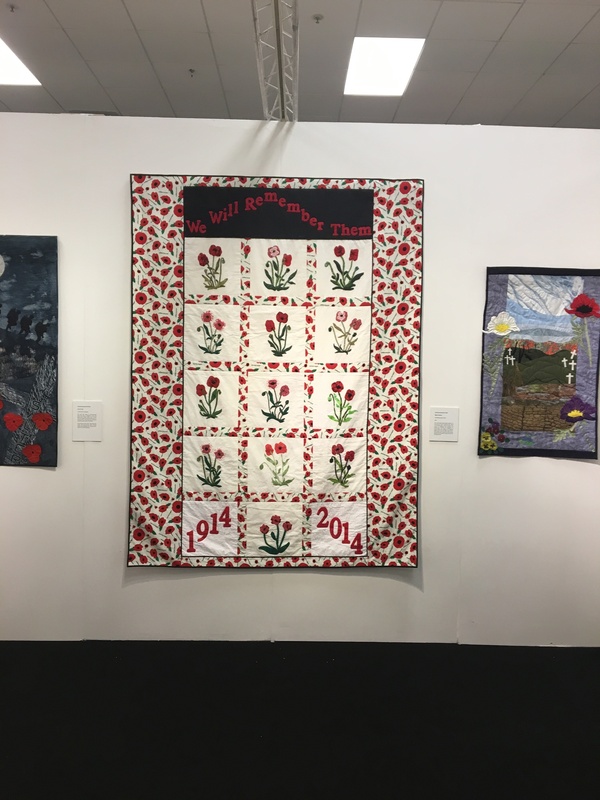 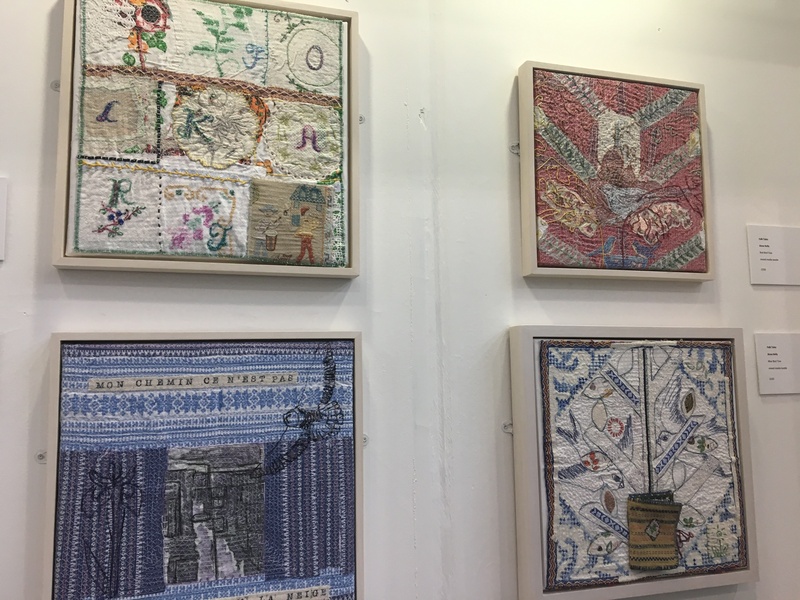 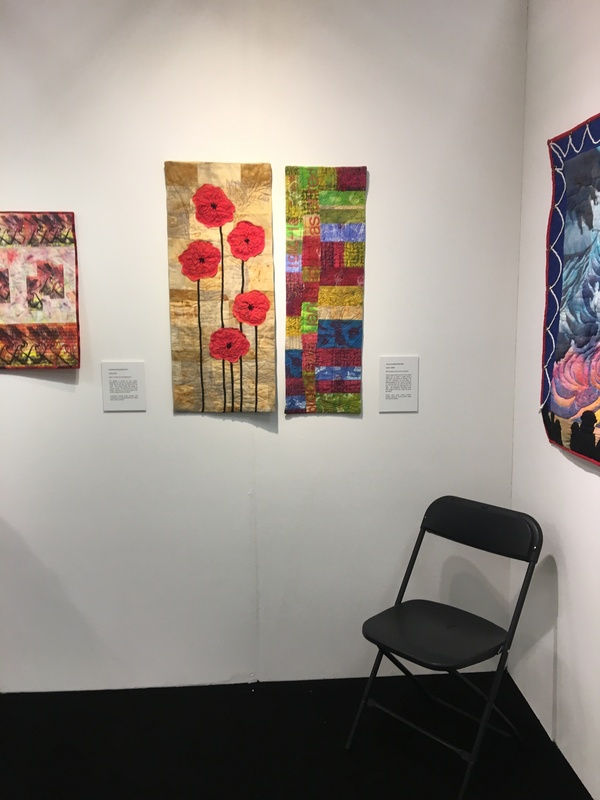 I also helped out on the Quilters Guild stand for a while and got to meet Region 1 members…..
here’s the a few of my favourites…. 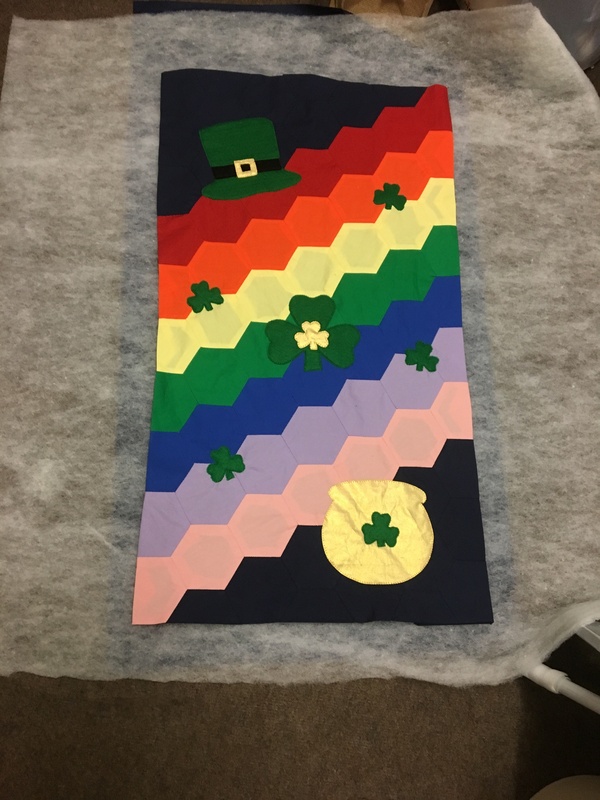 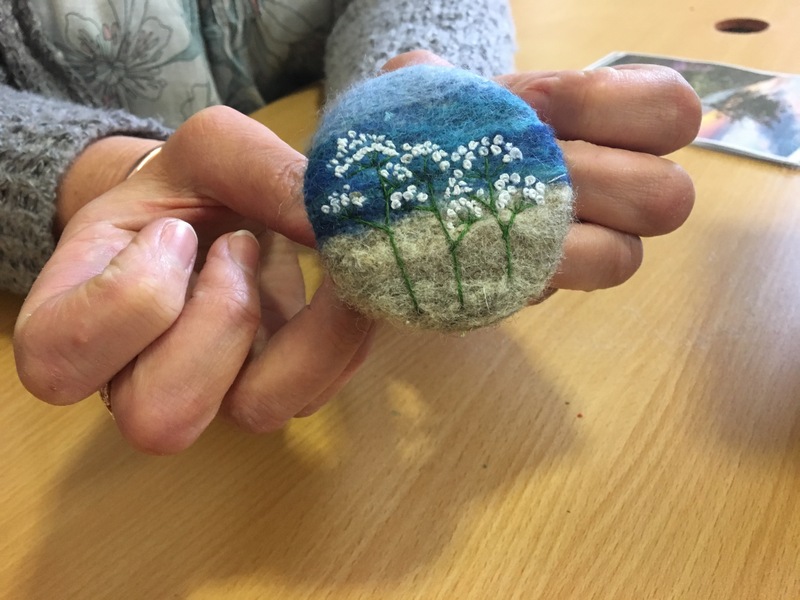 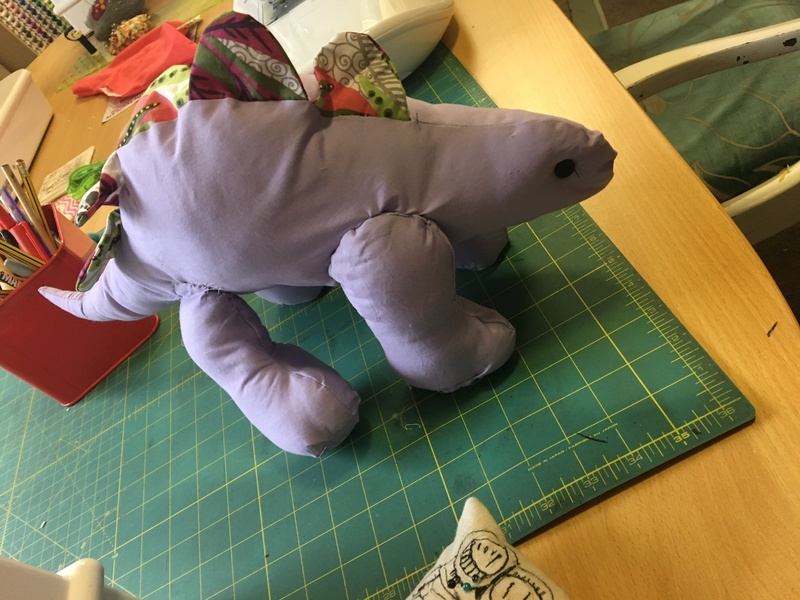 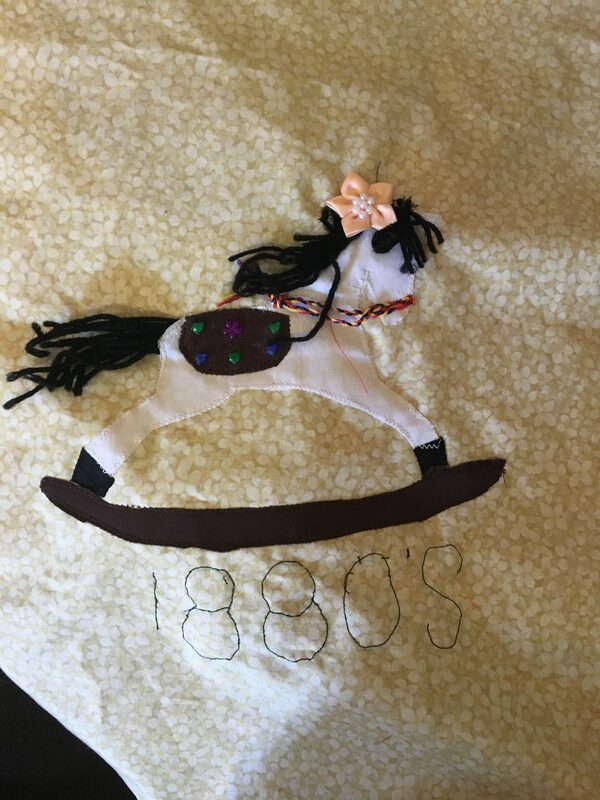 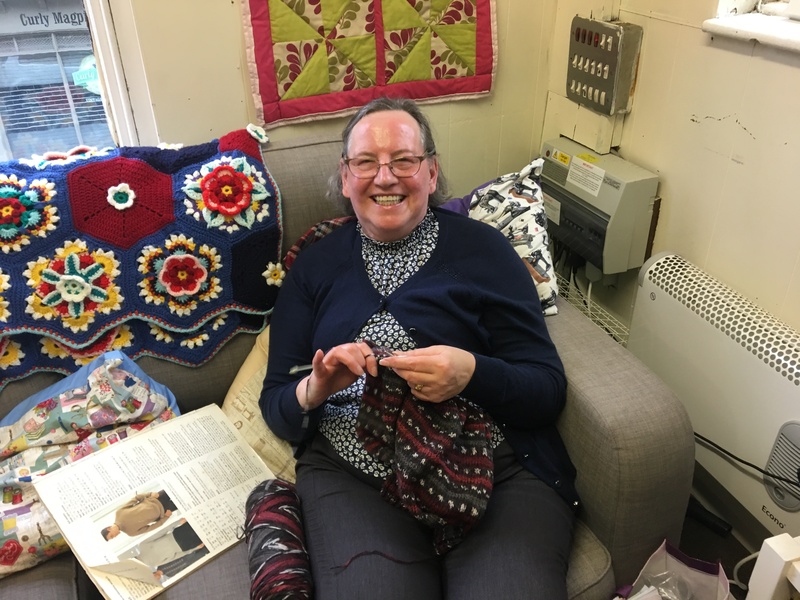 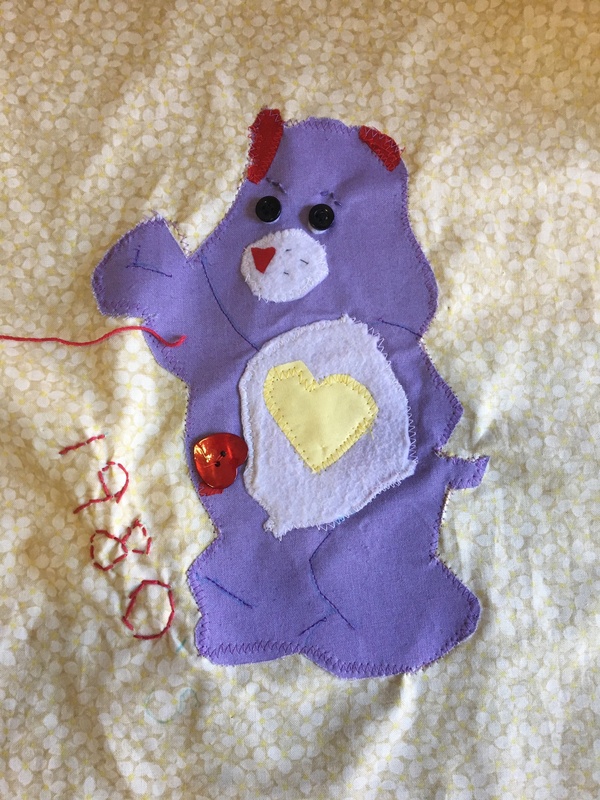 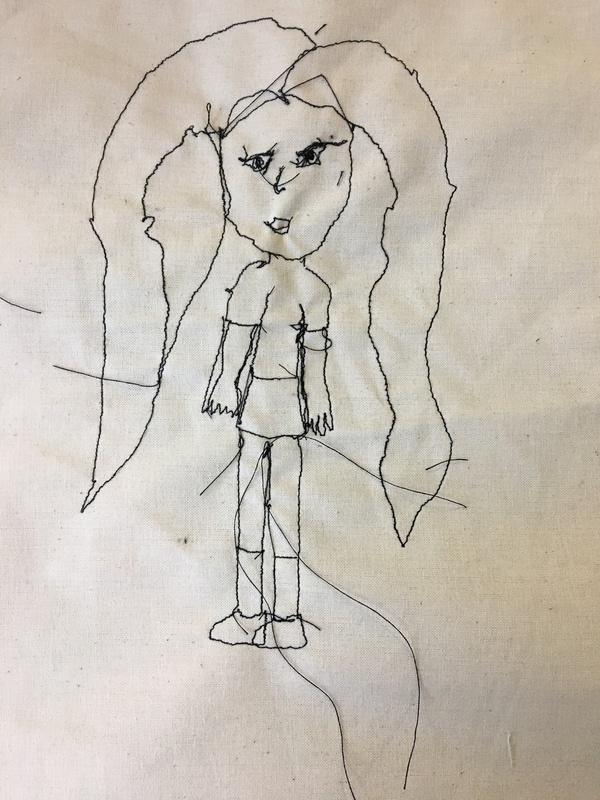 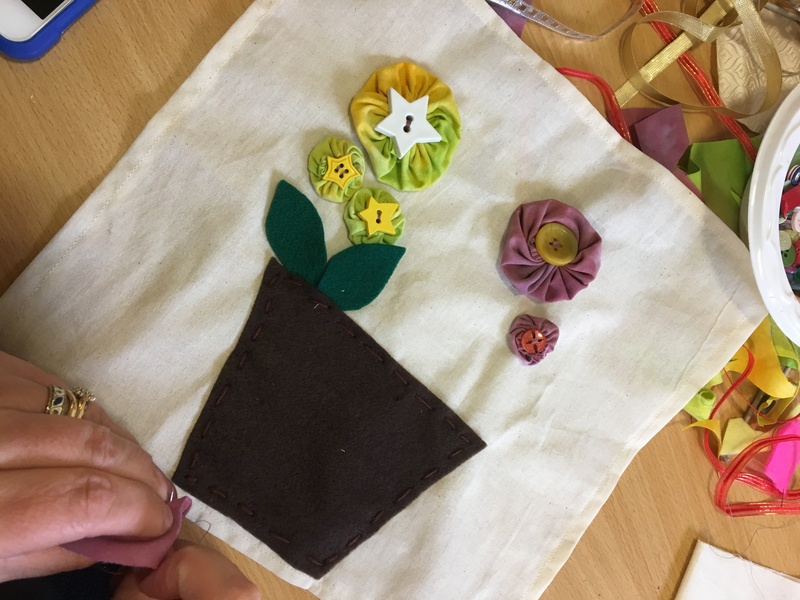 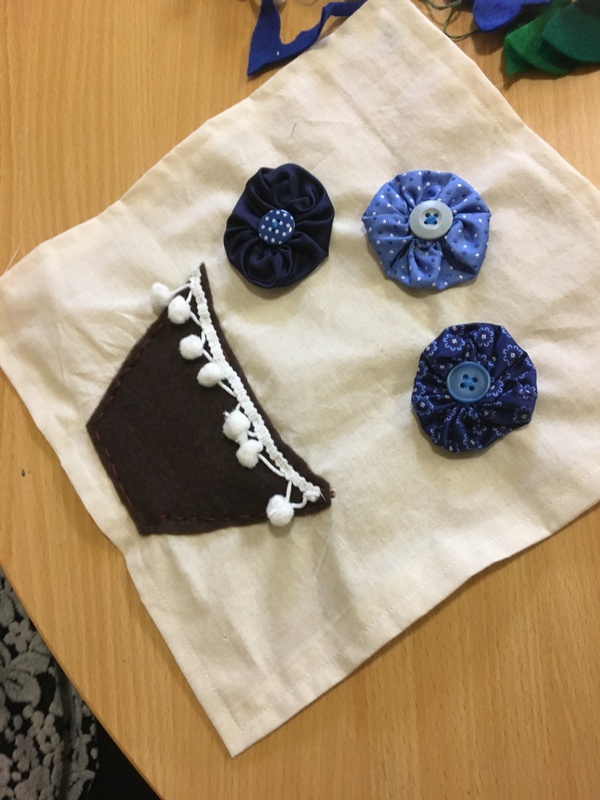 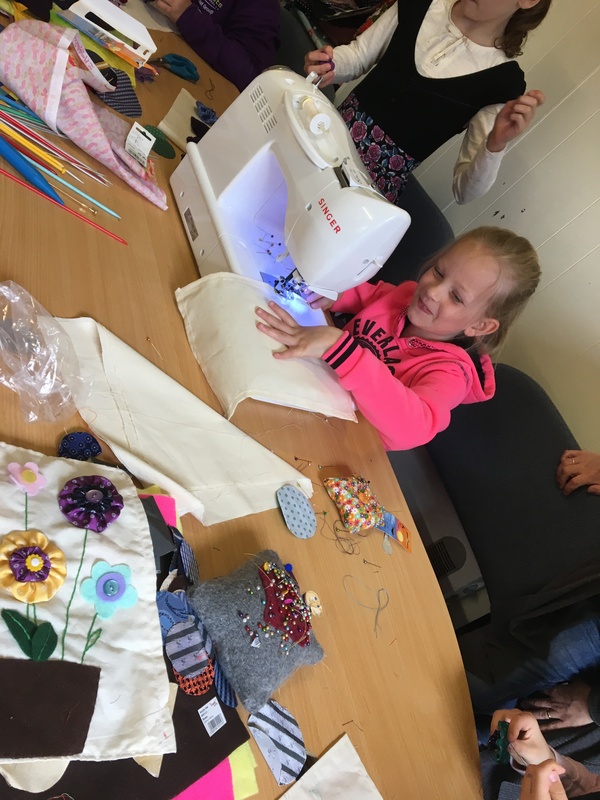 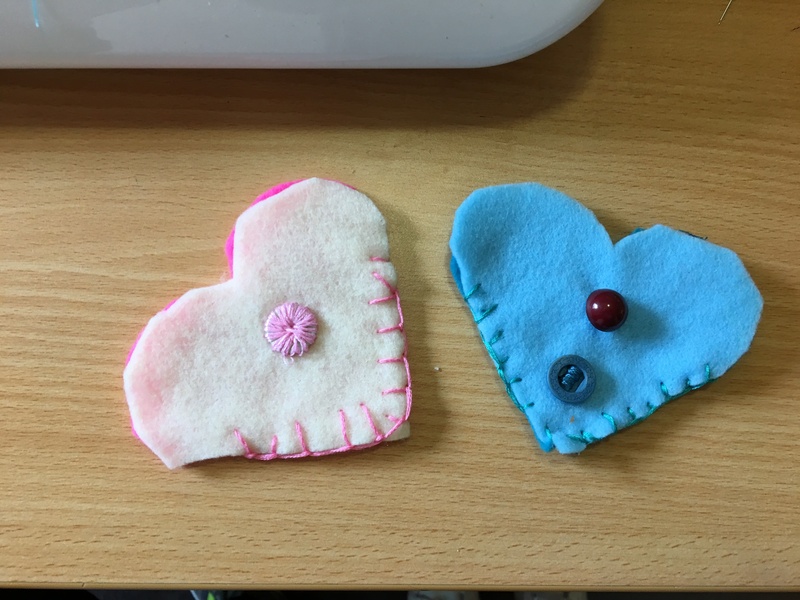 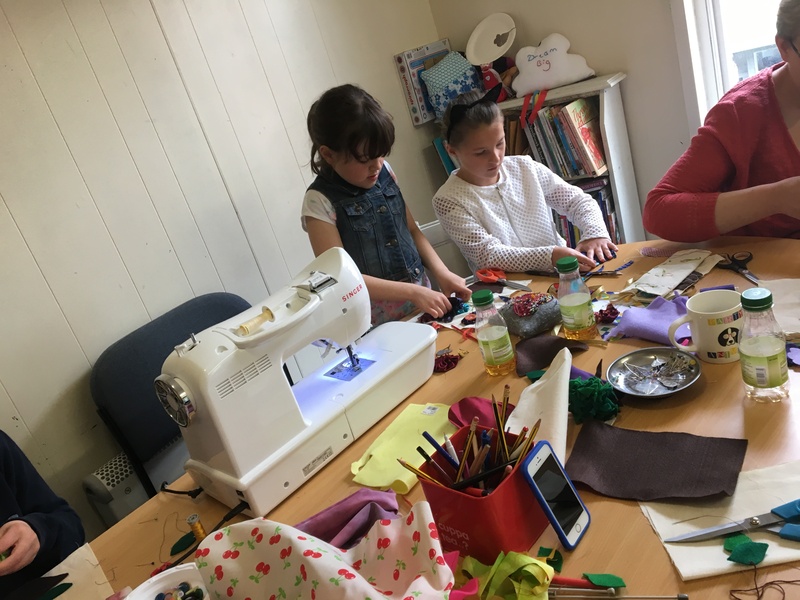 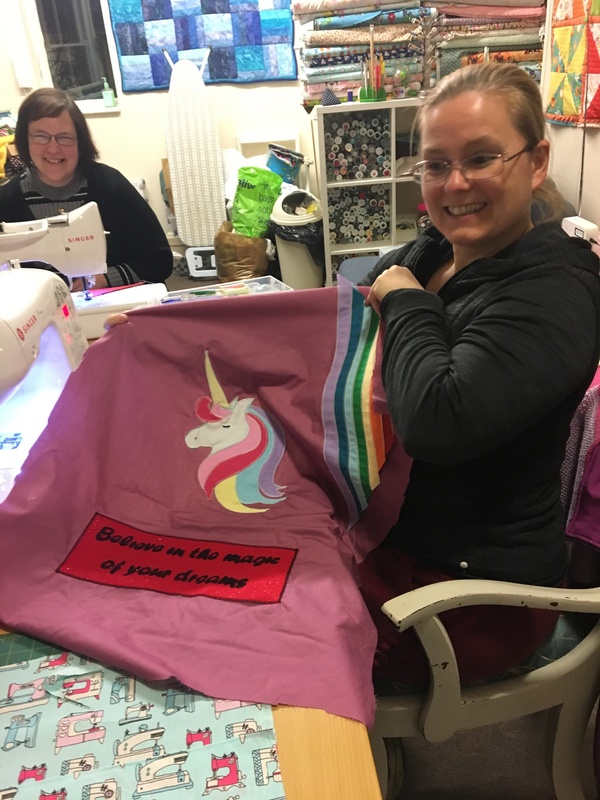 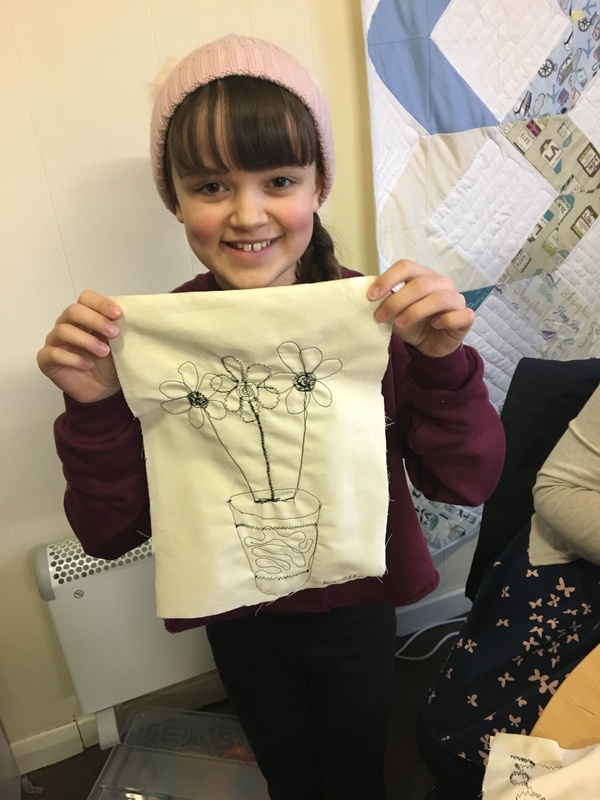 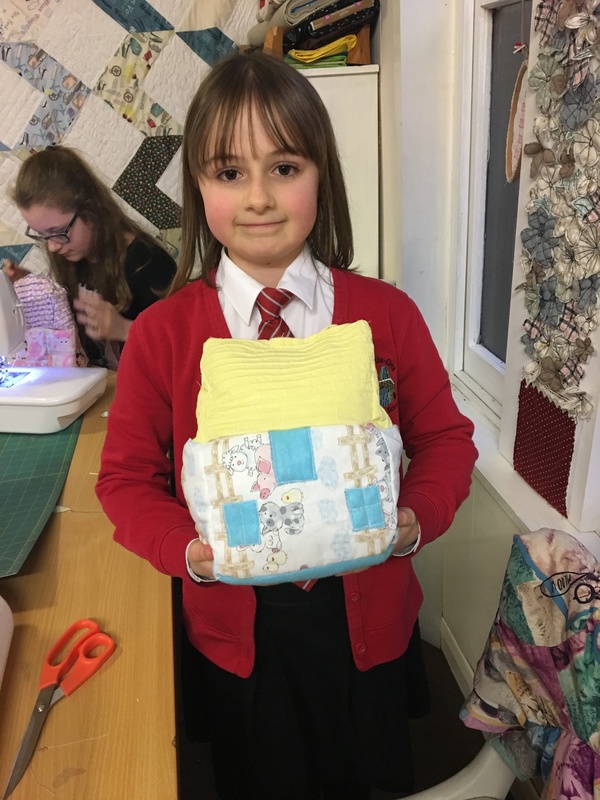 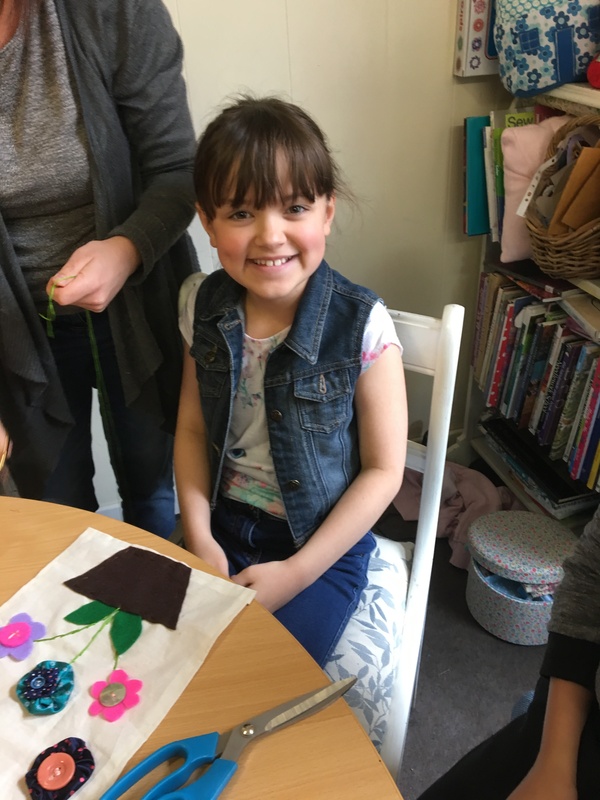 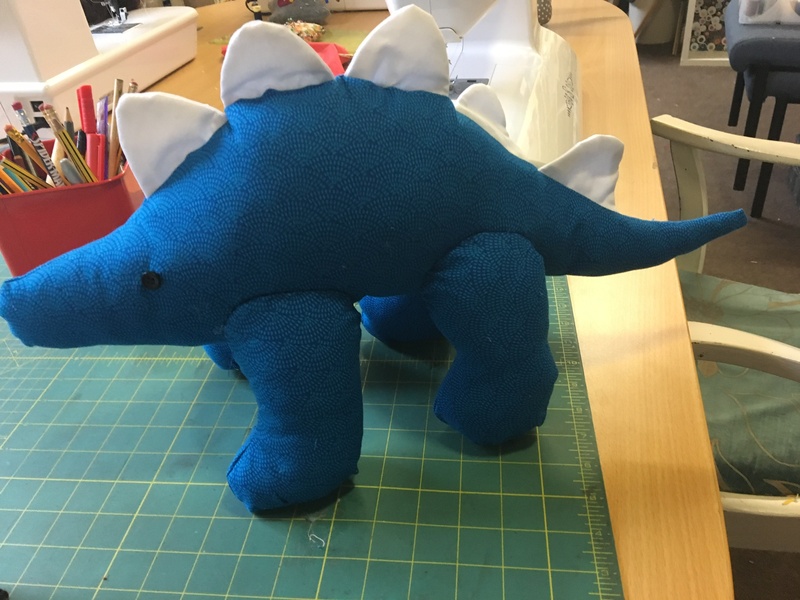 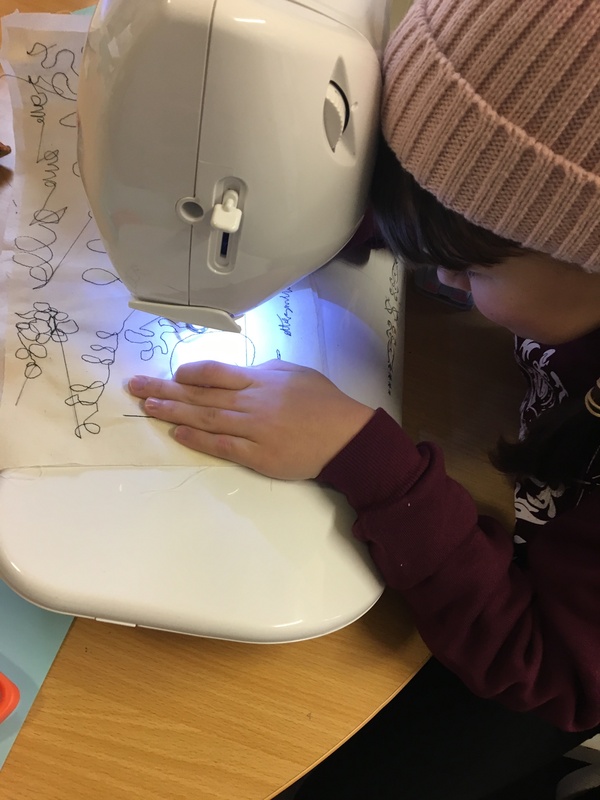 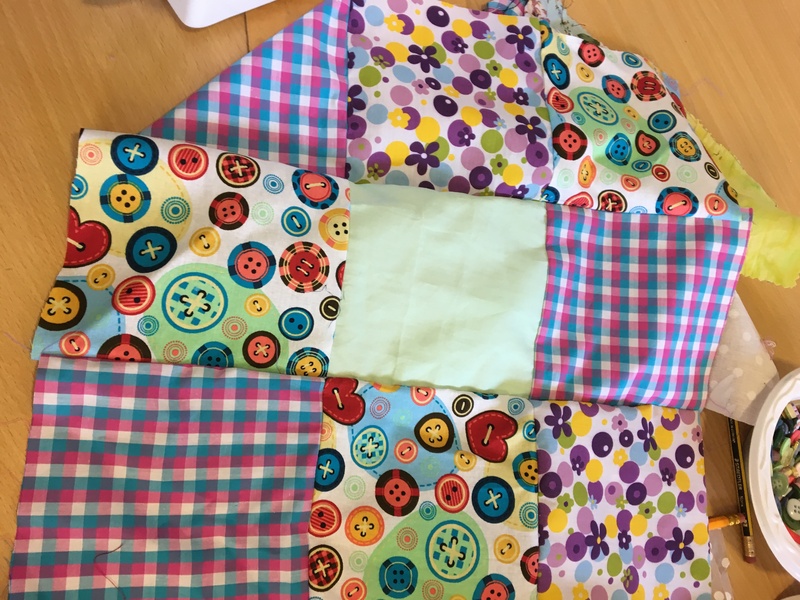 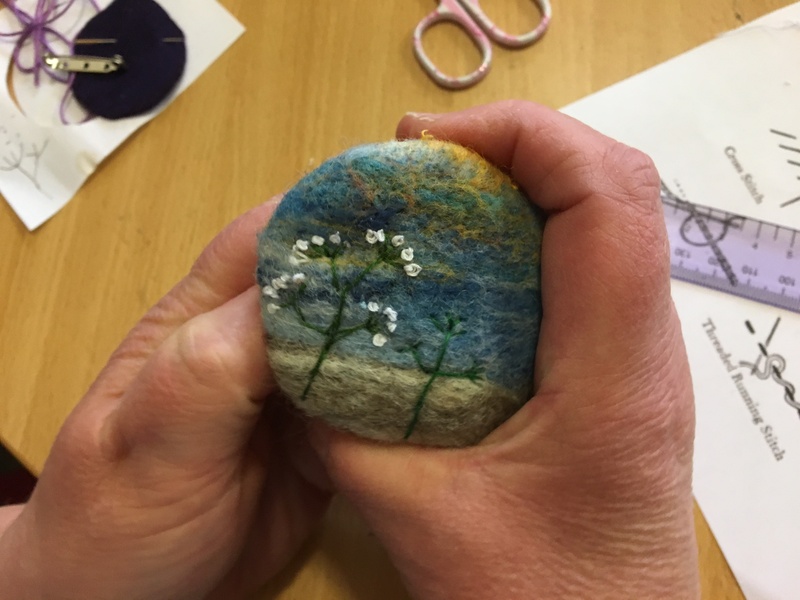 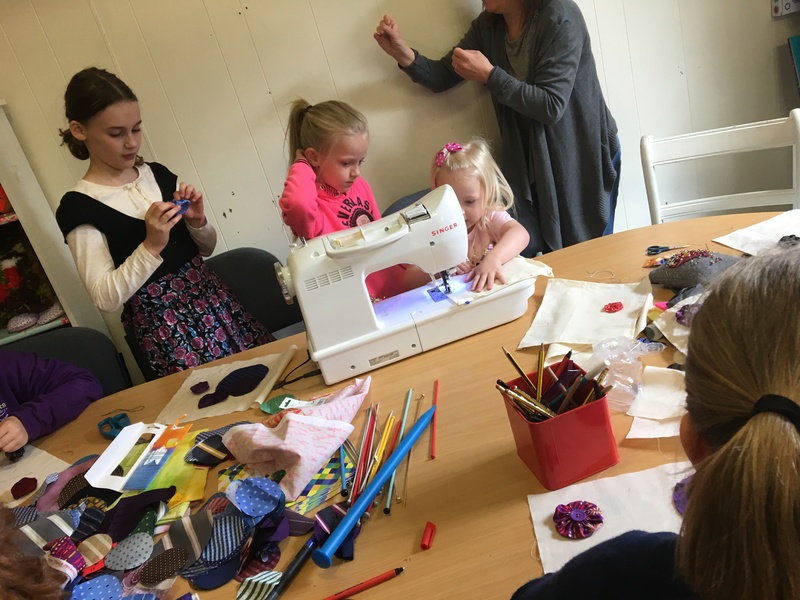 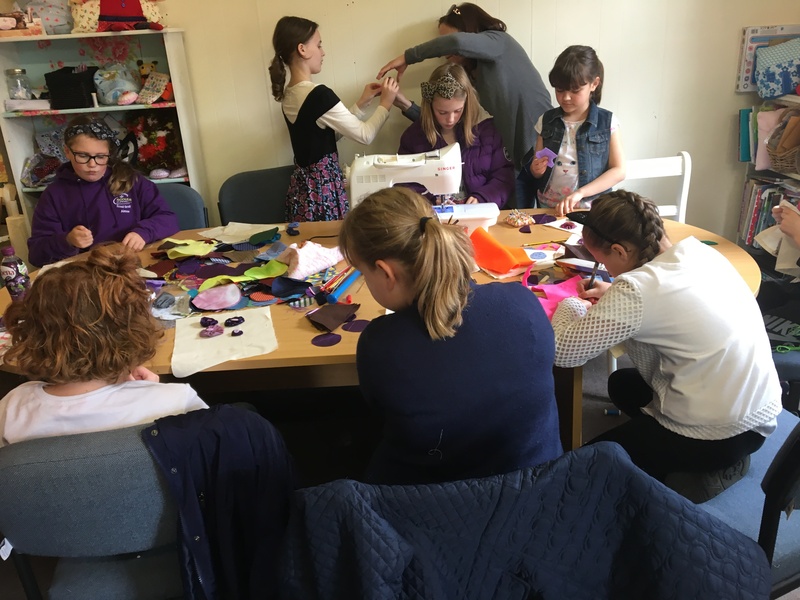 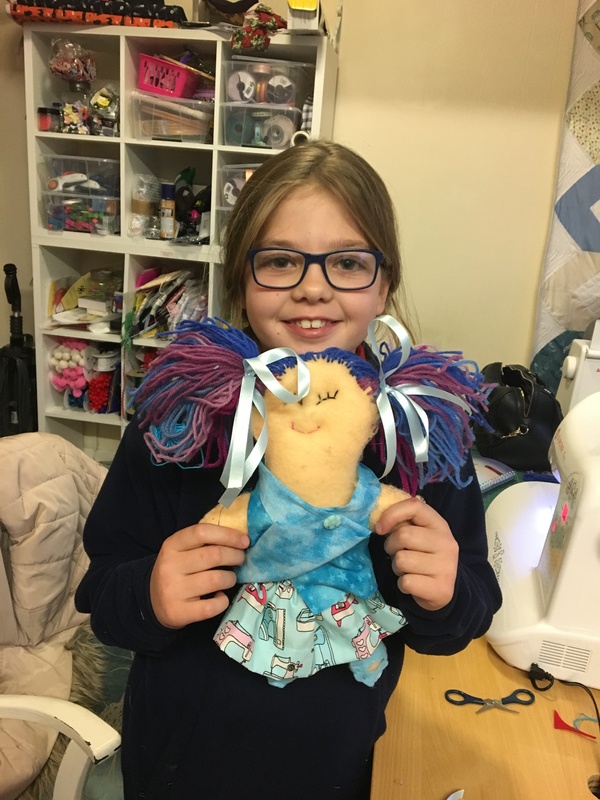 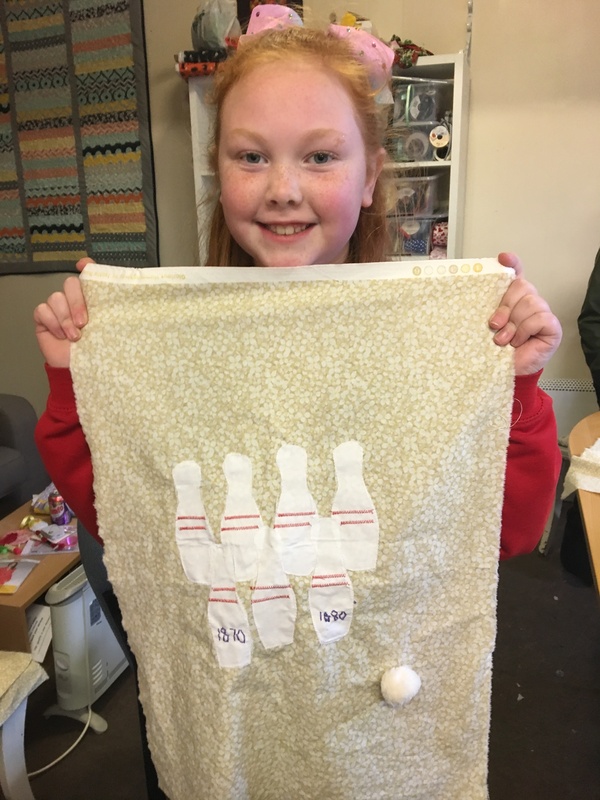 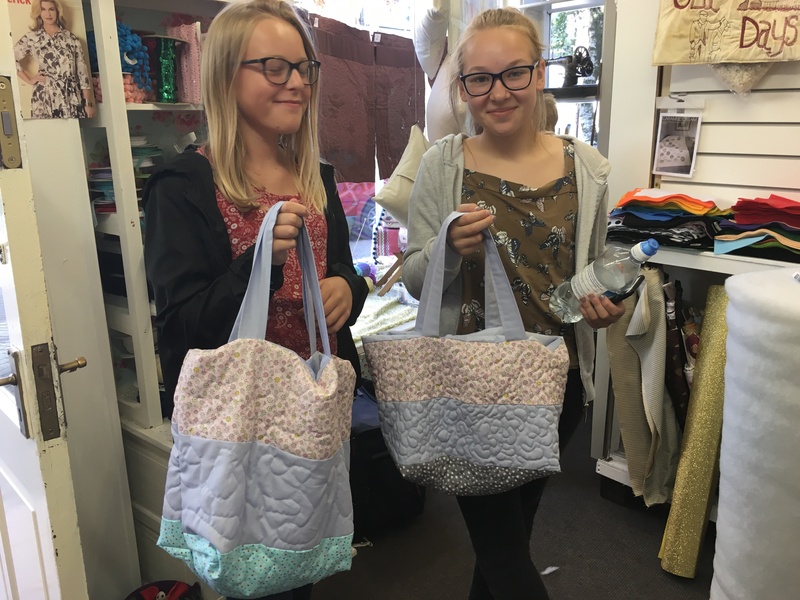 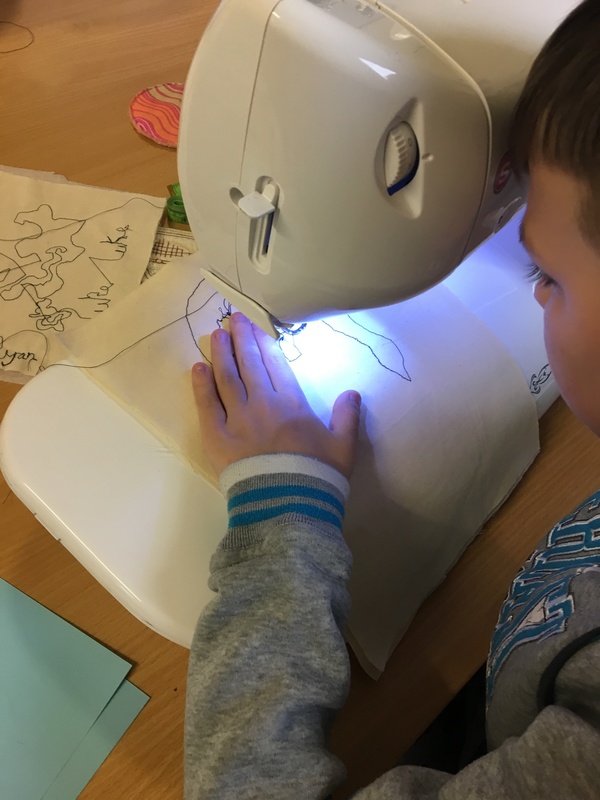 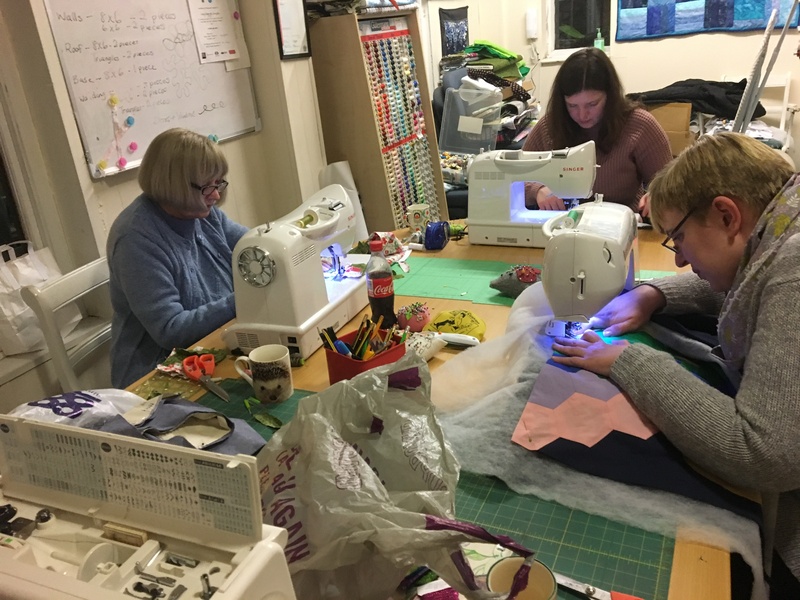 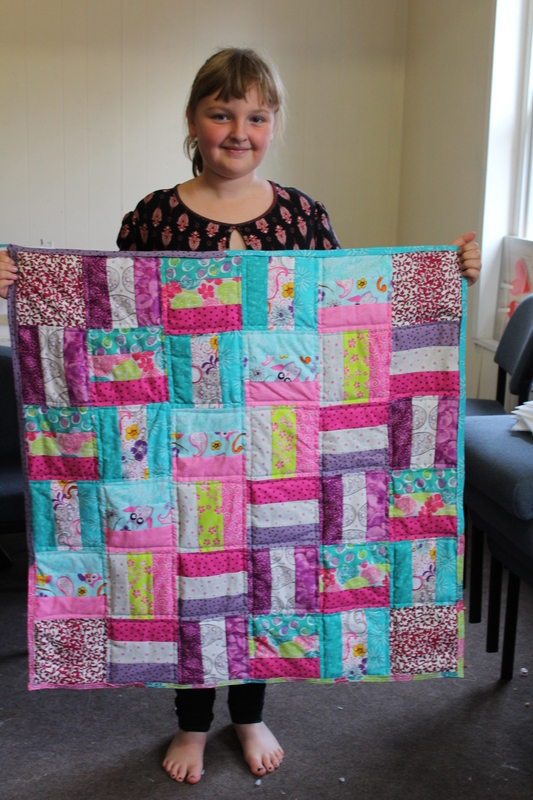 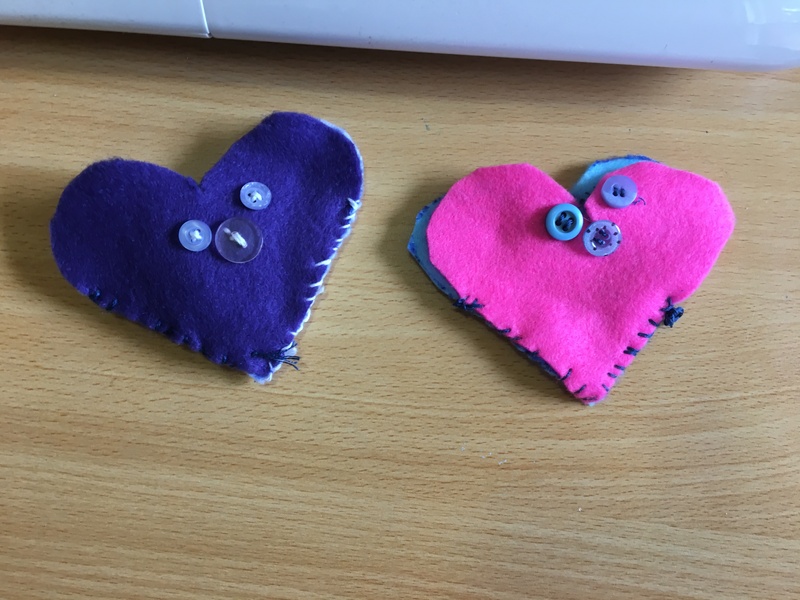 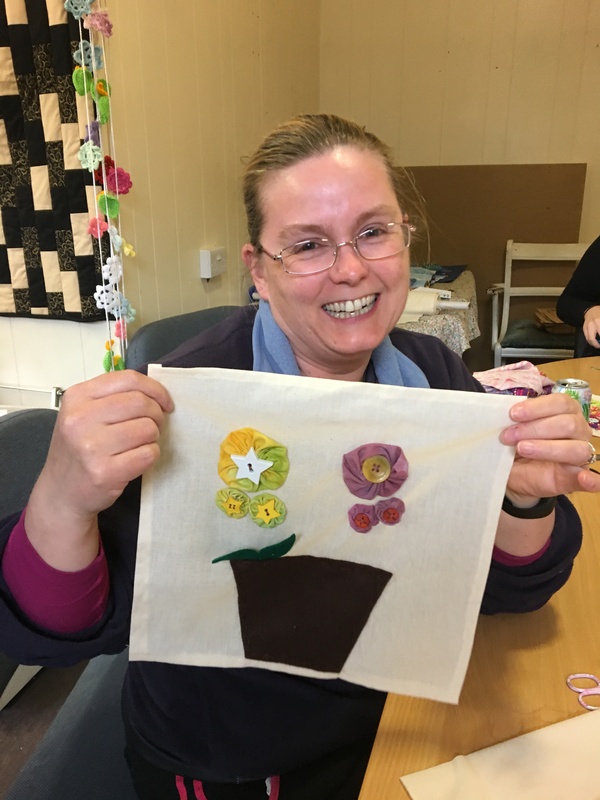 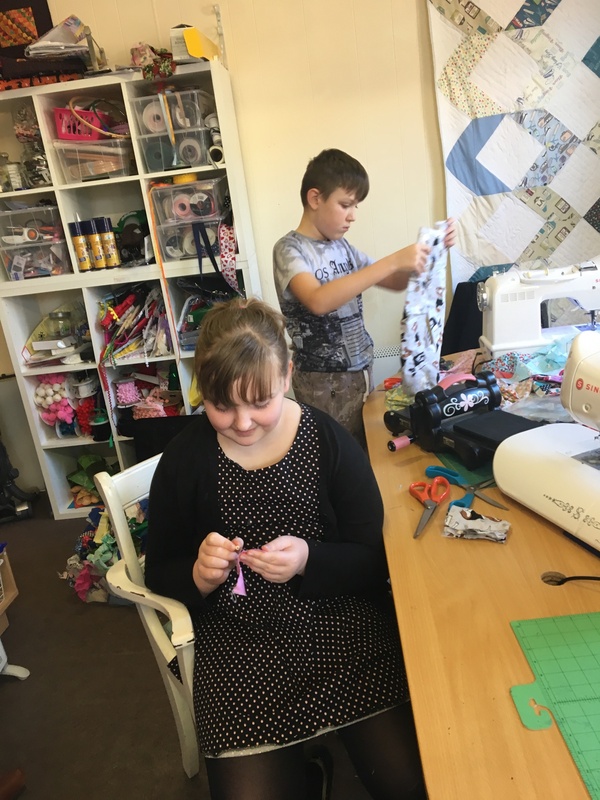 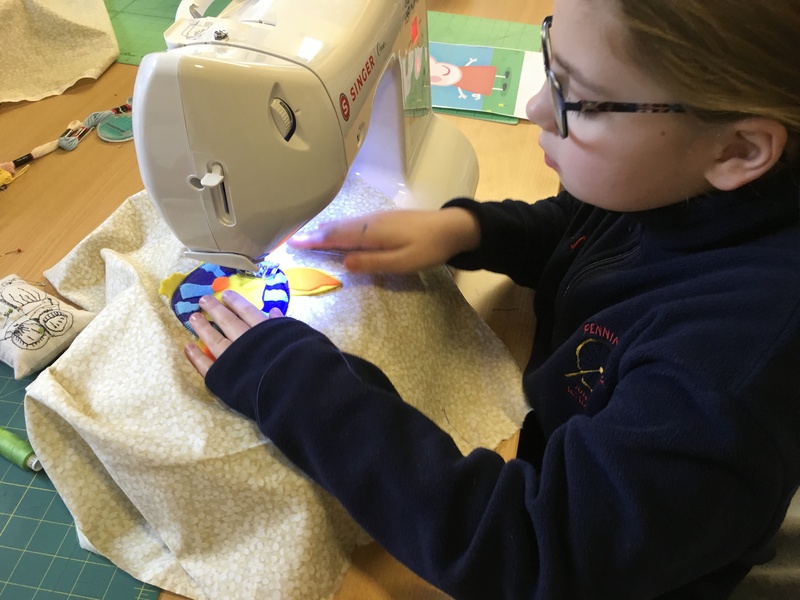 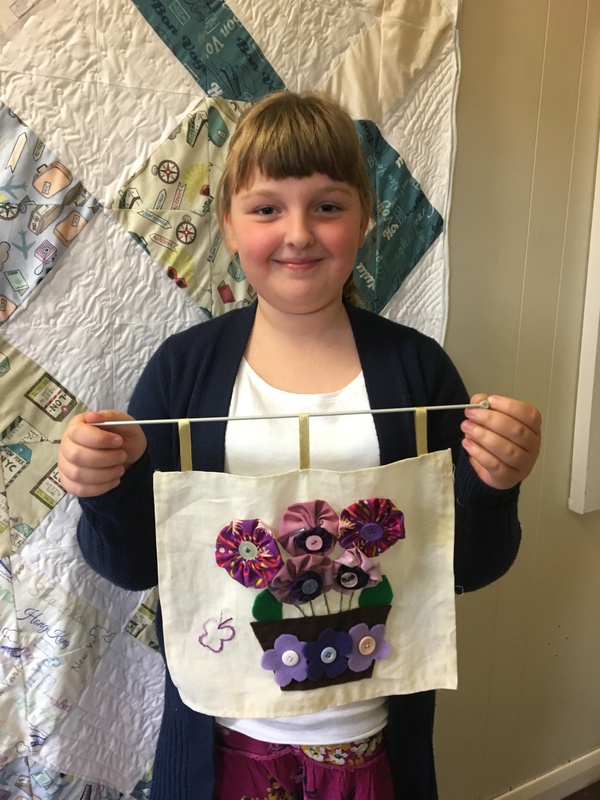 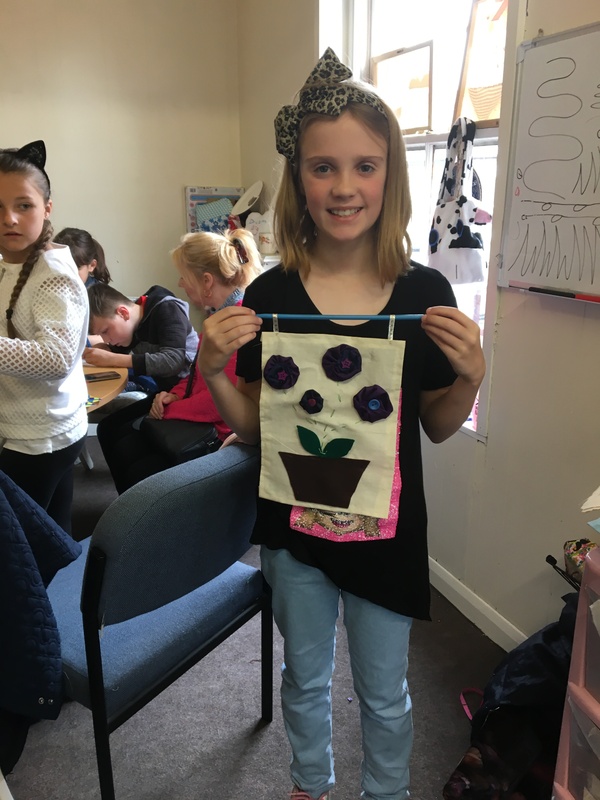 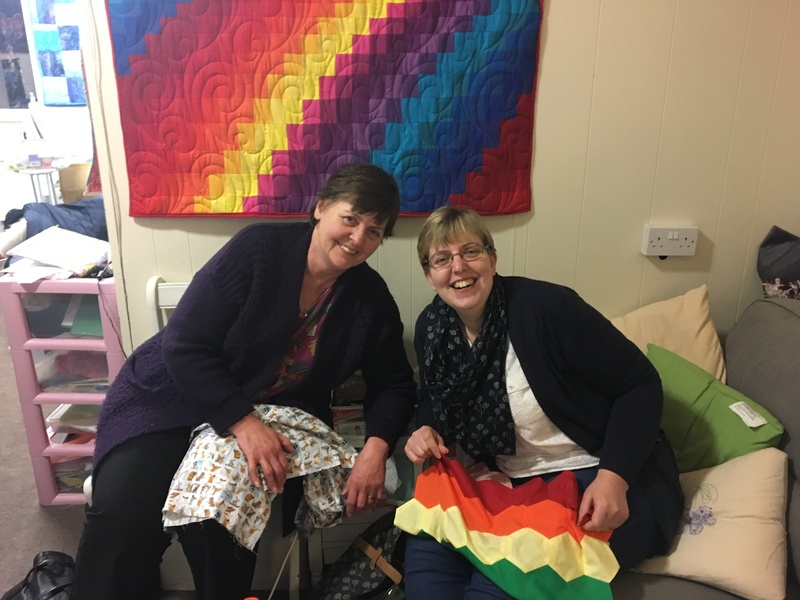 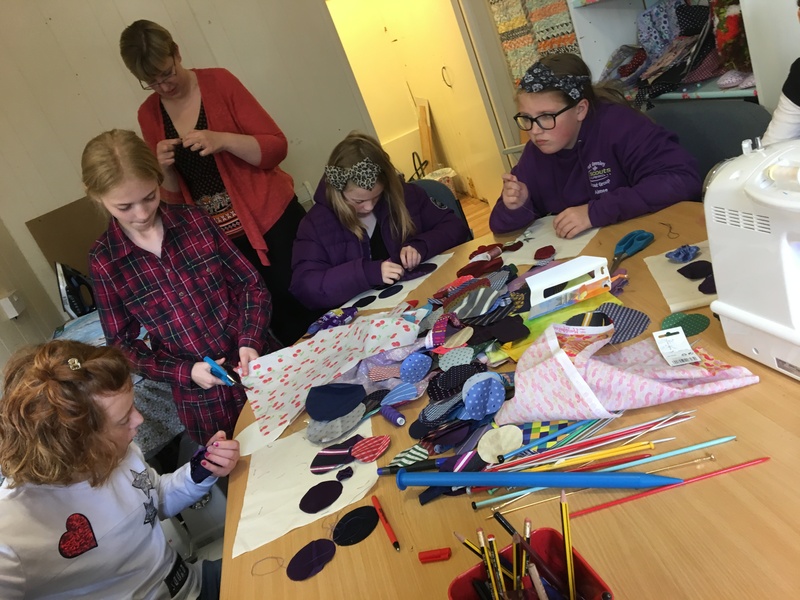 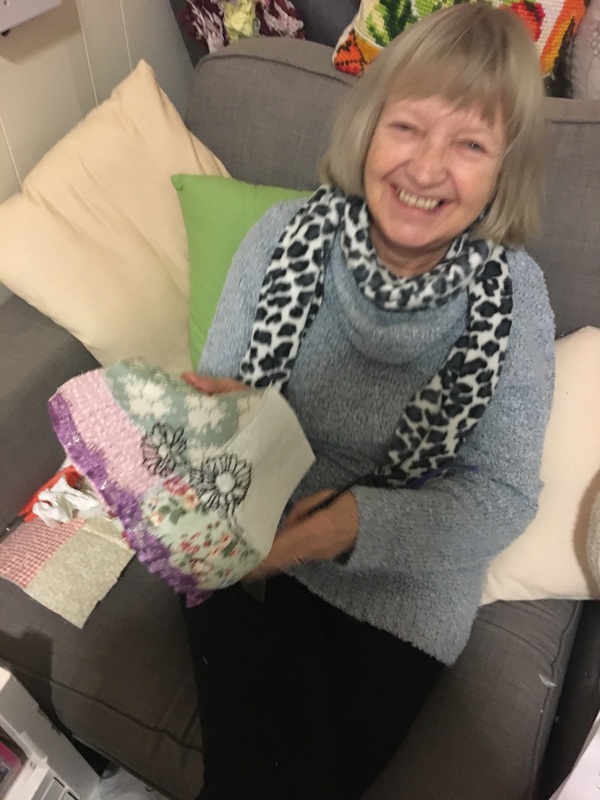 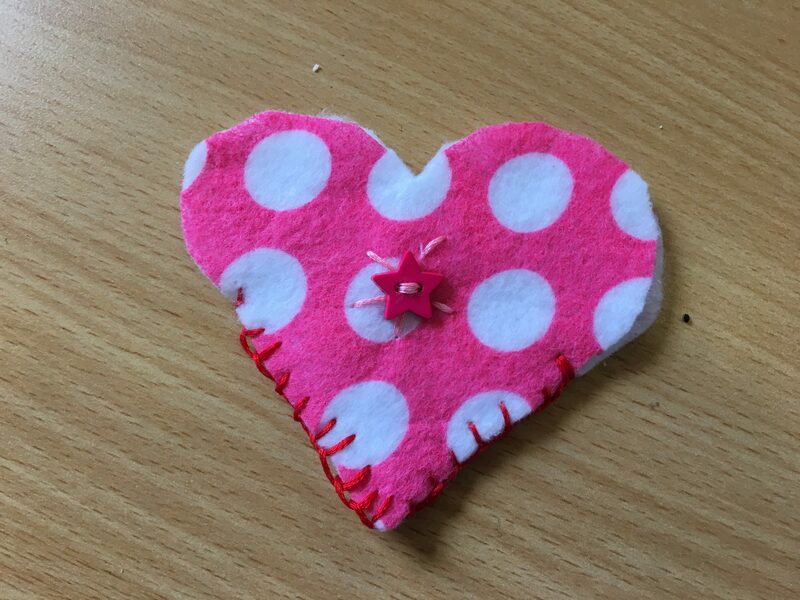 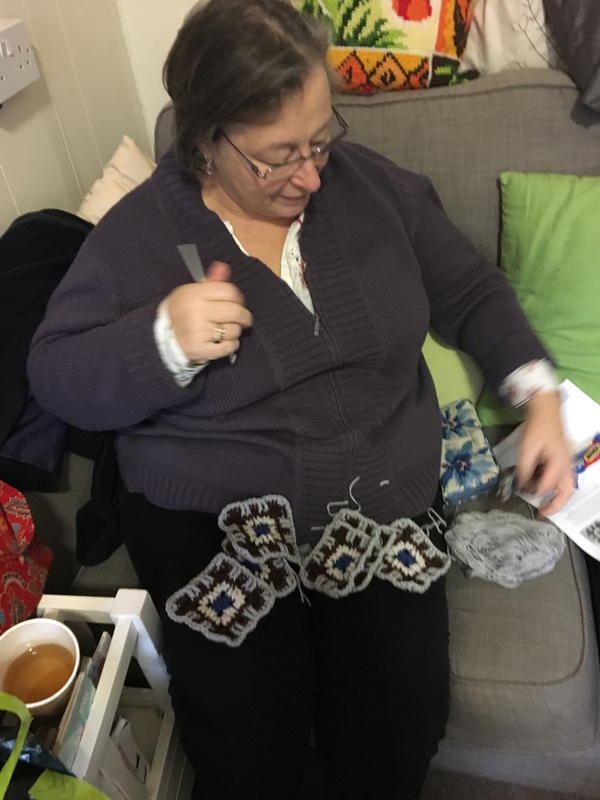 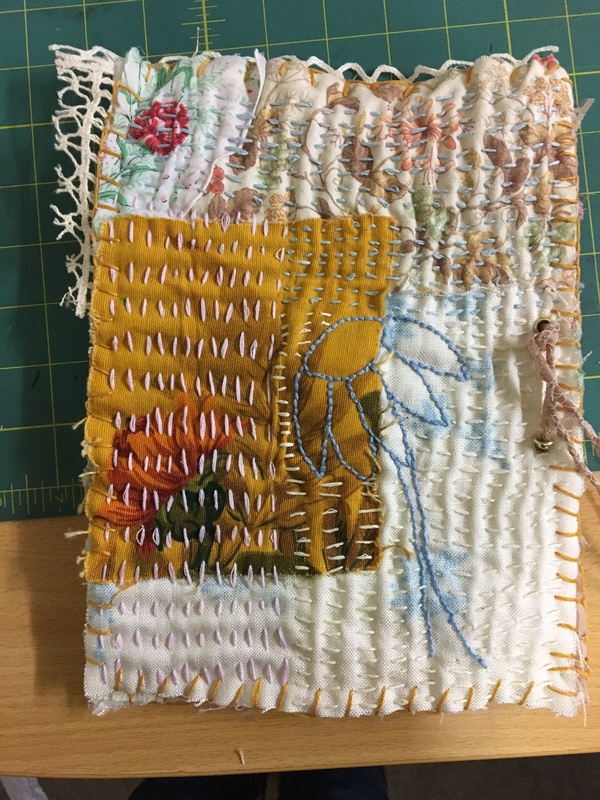 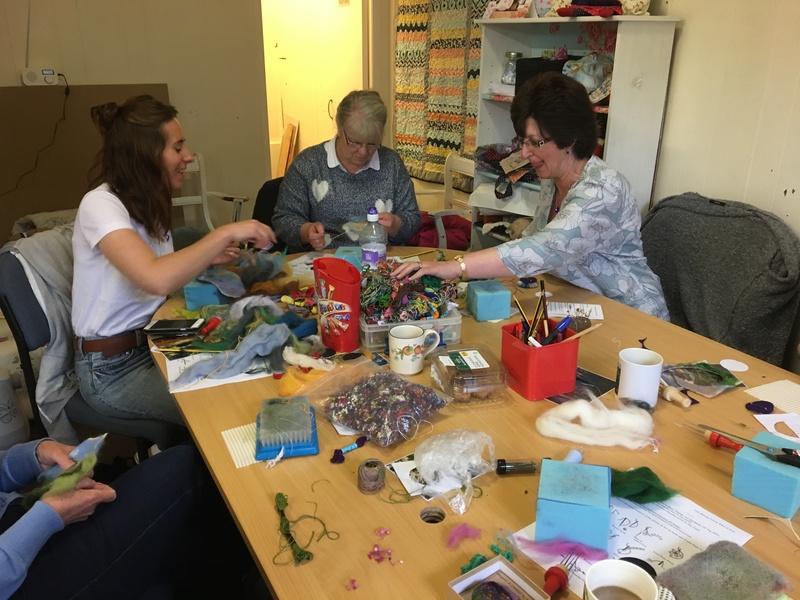 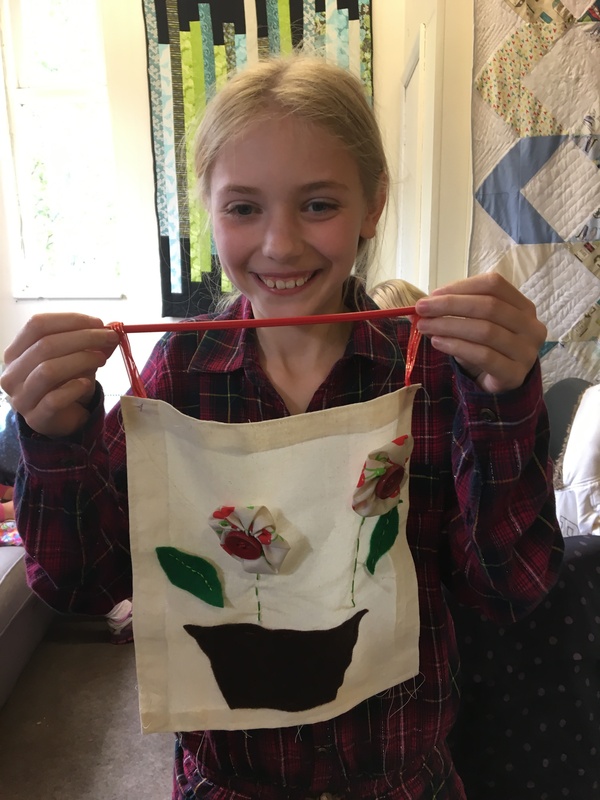 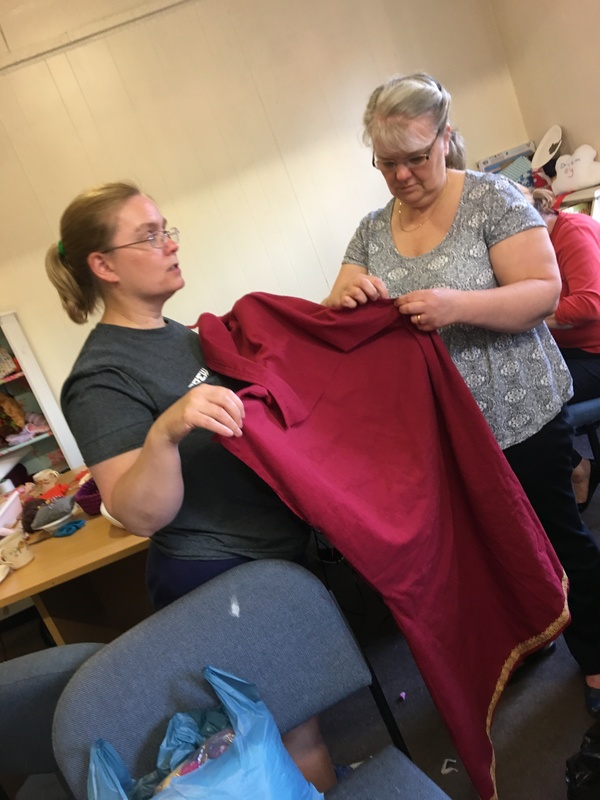 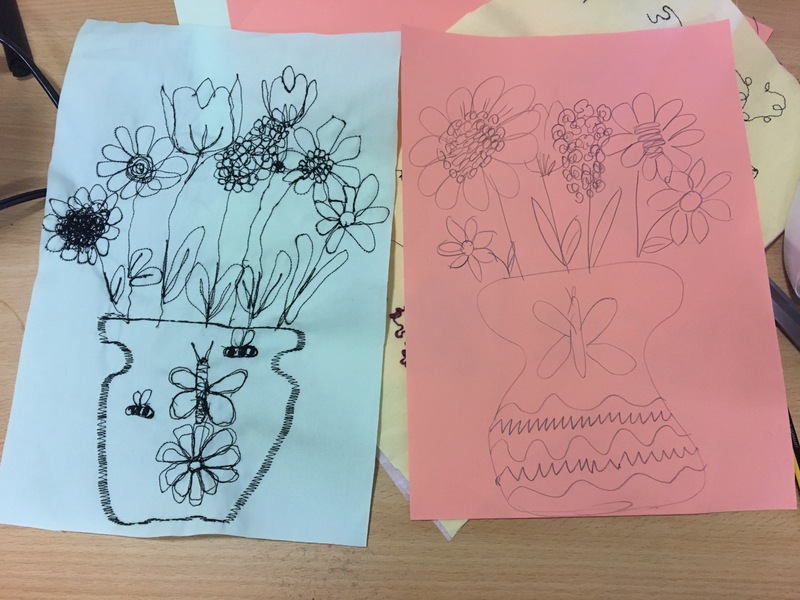 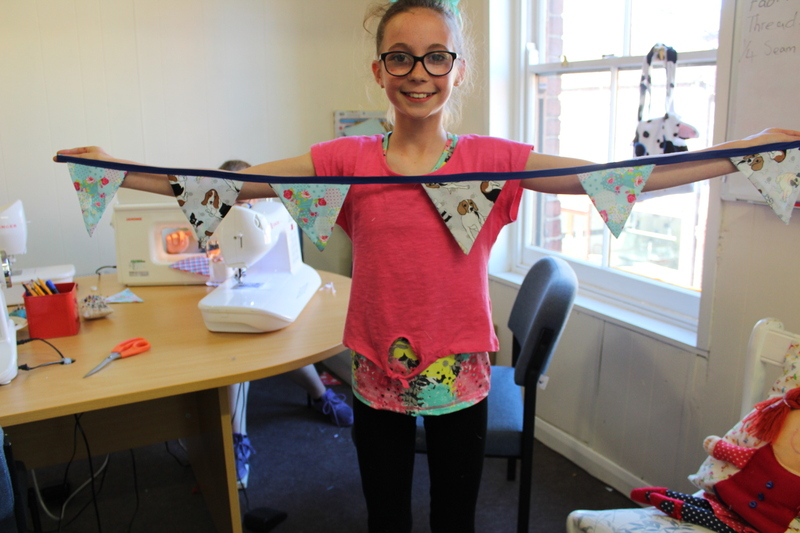 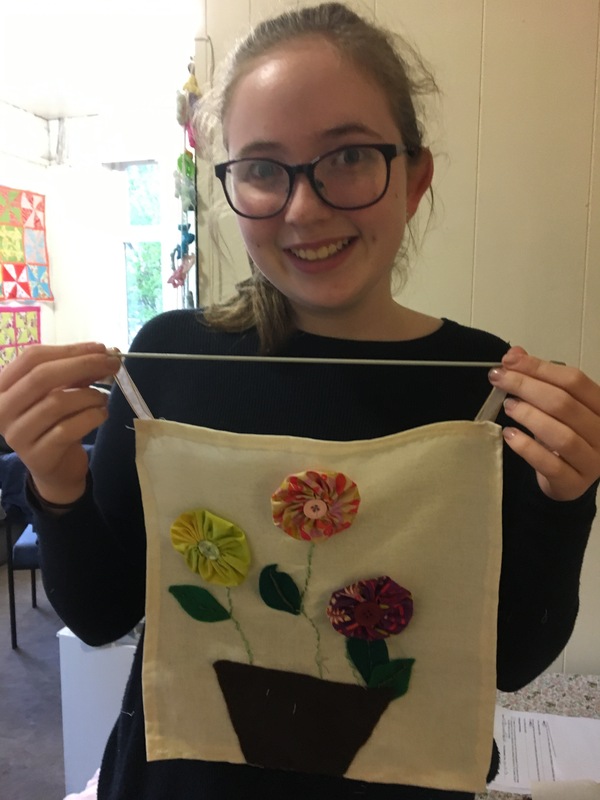 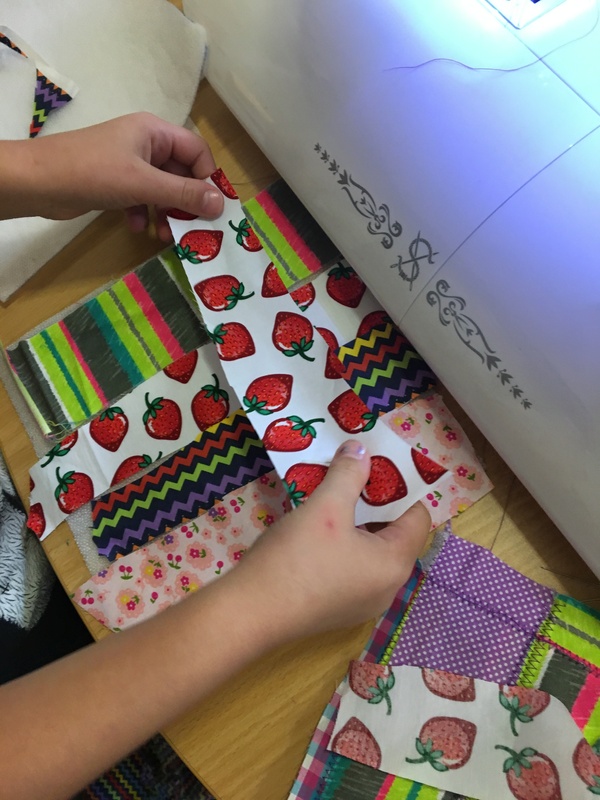 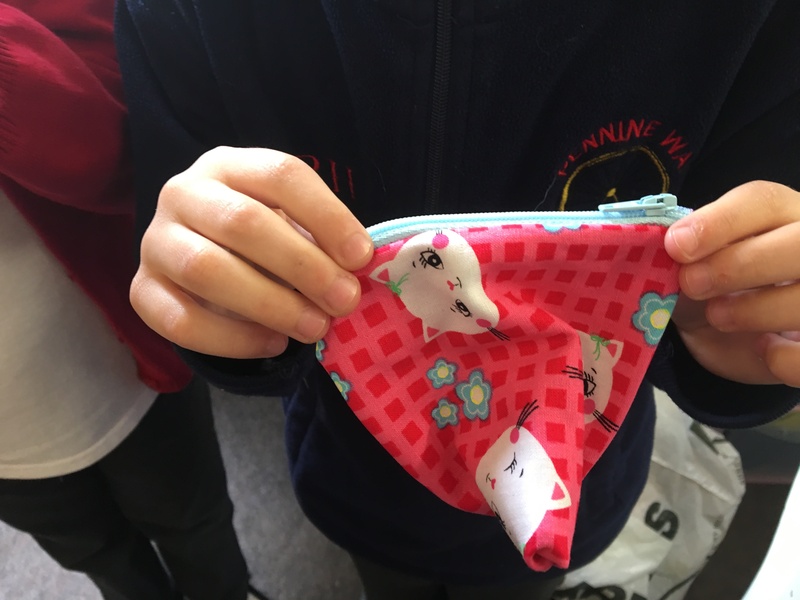 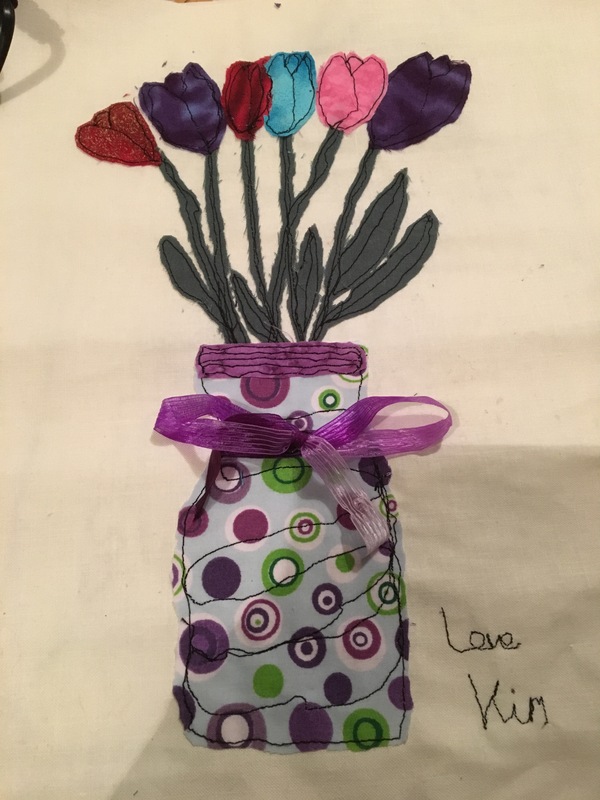 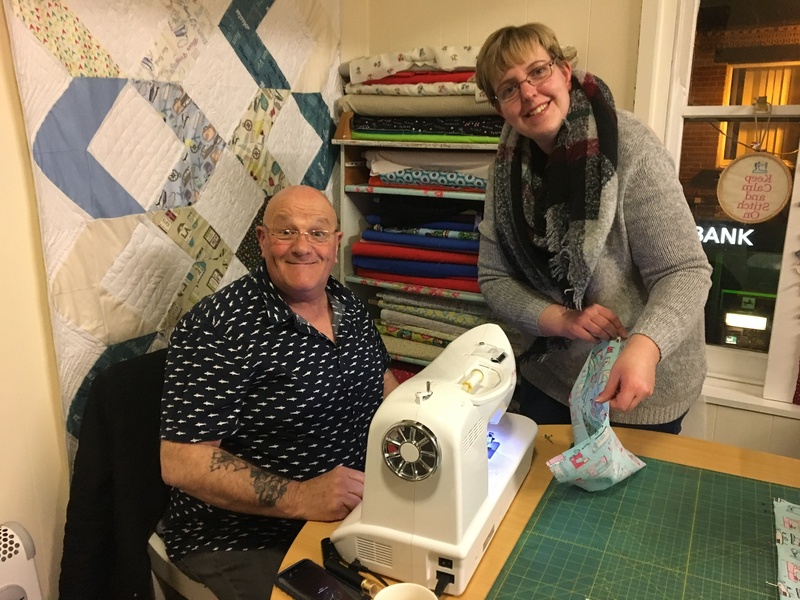 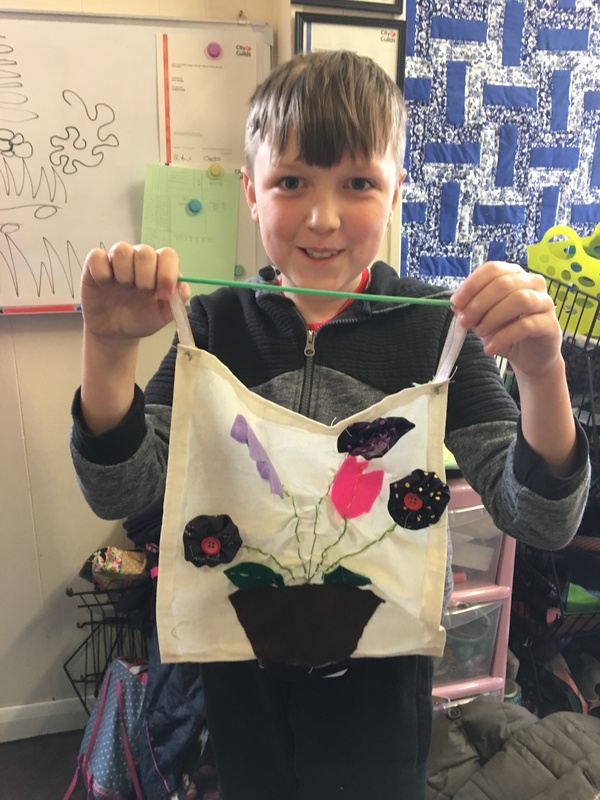 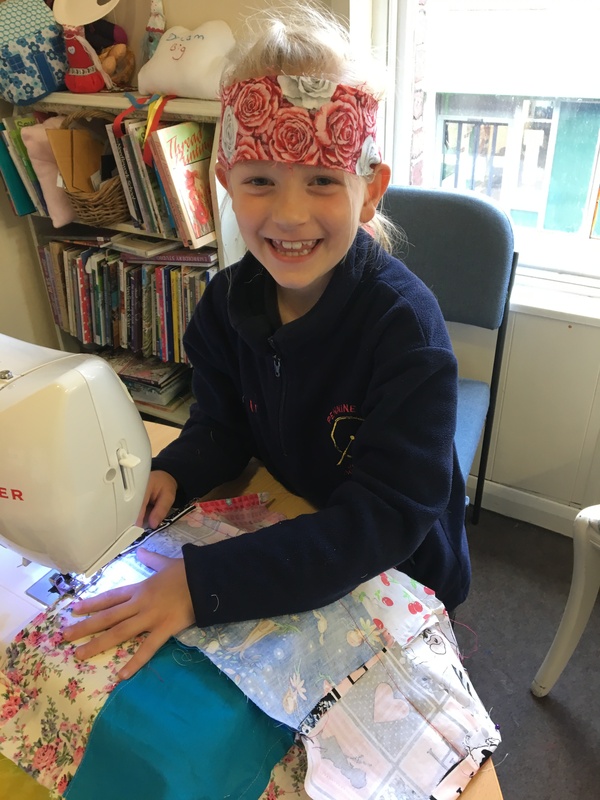 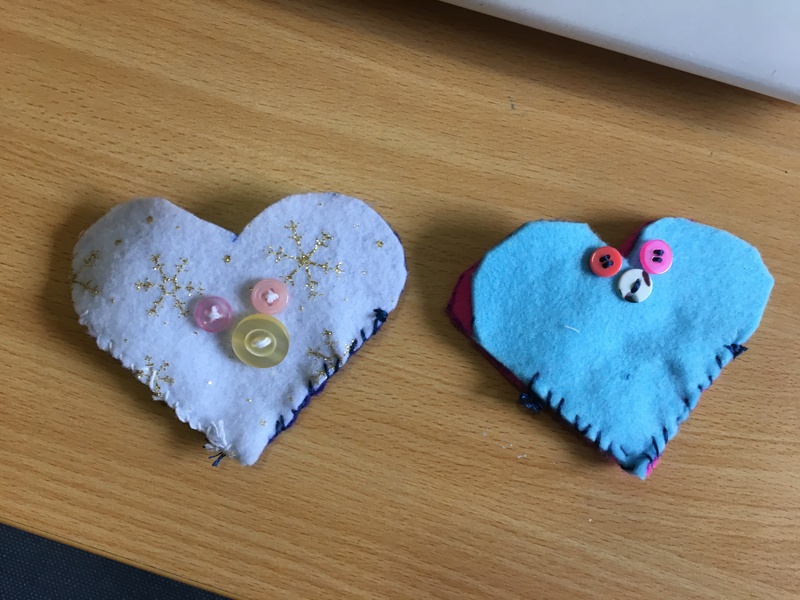 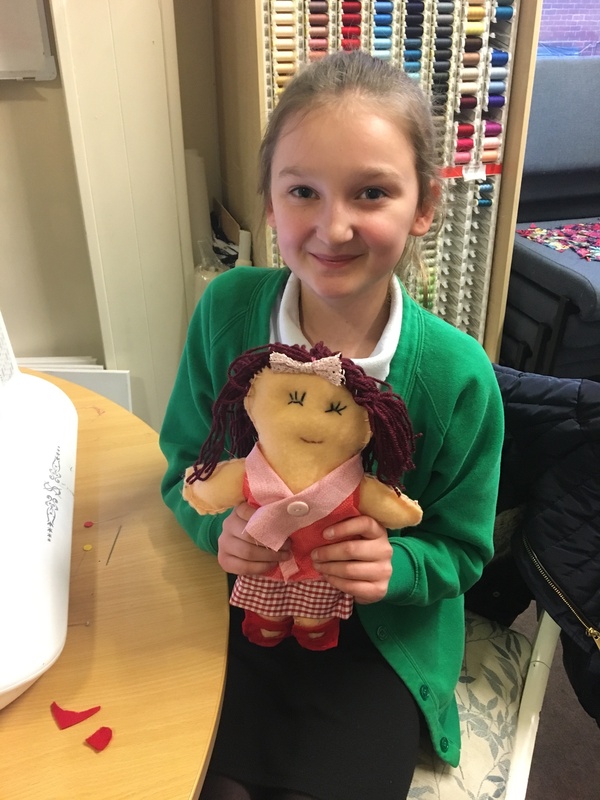 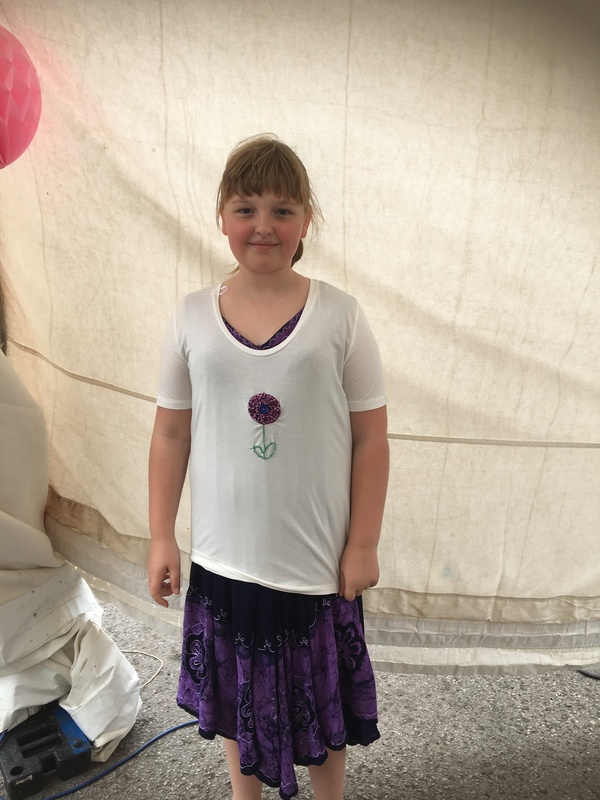 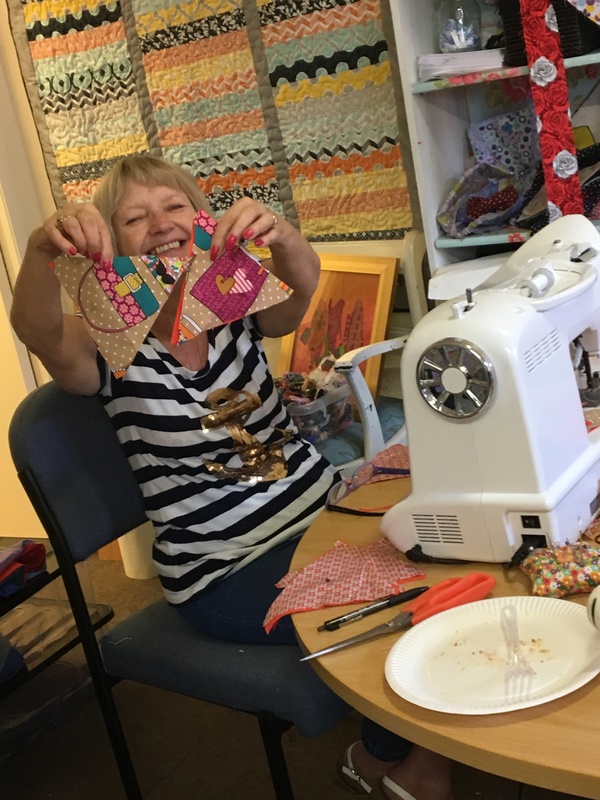 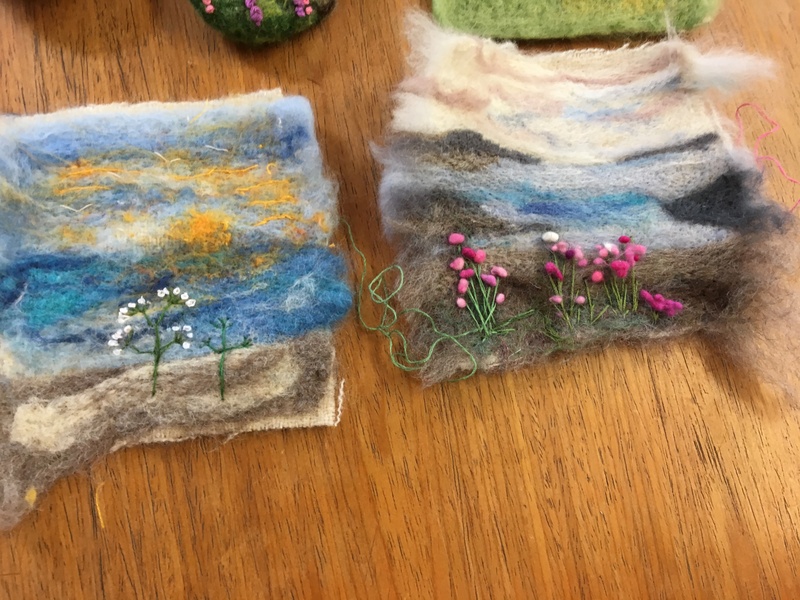 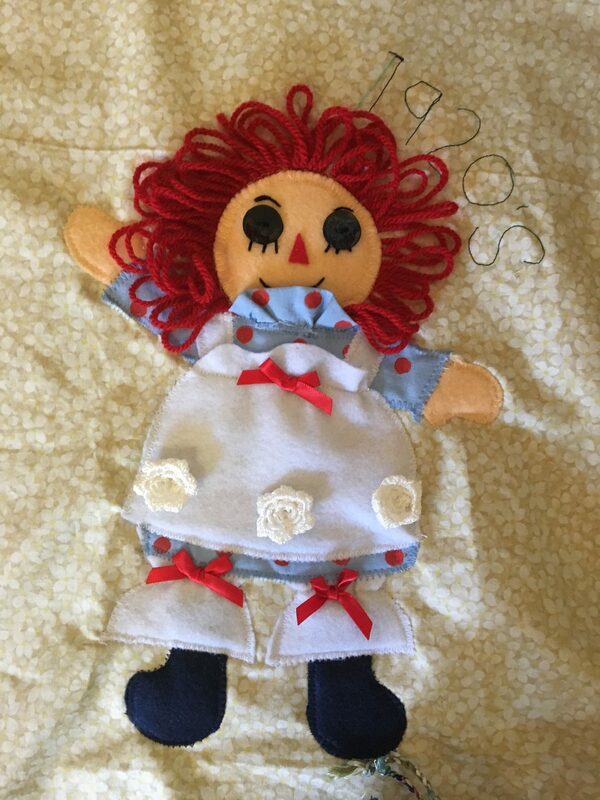 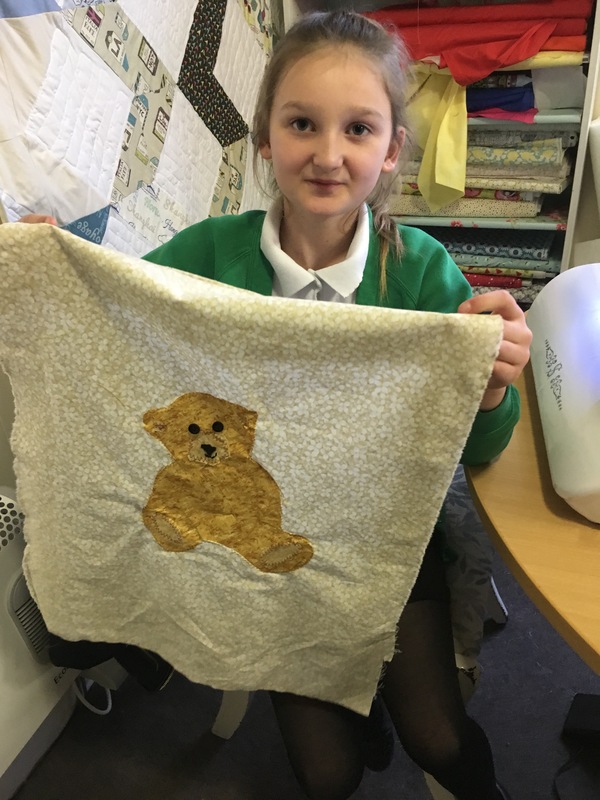 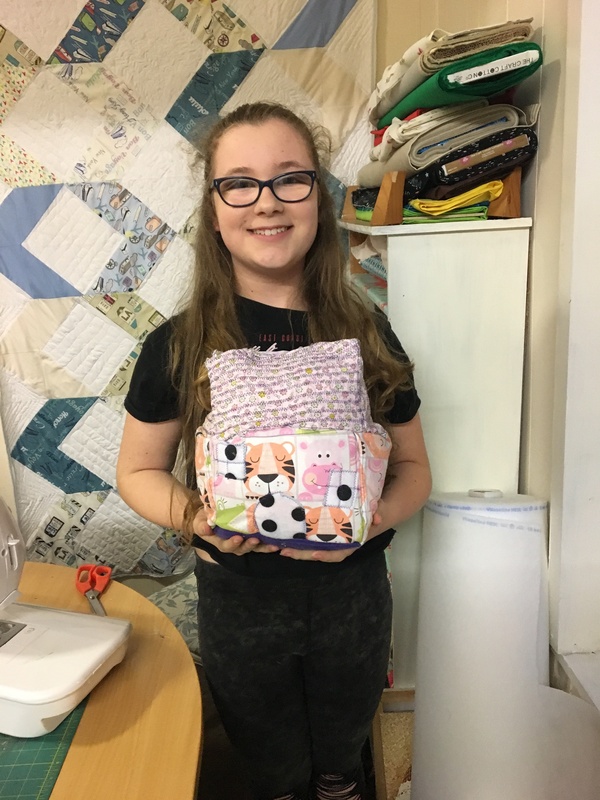 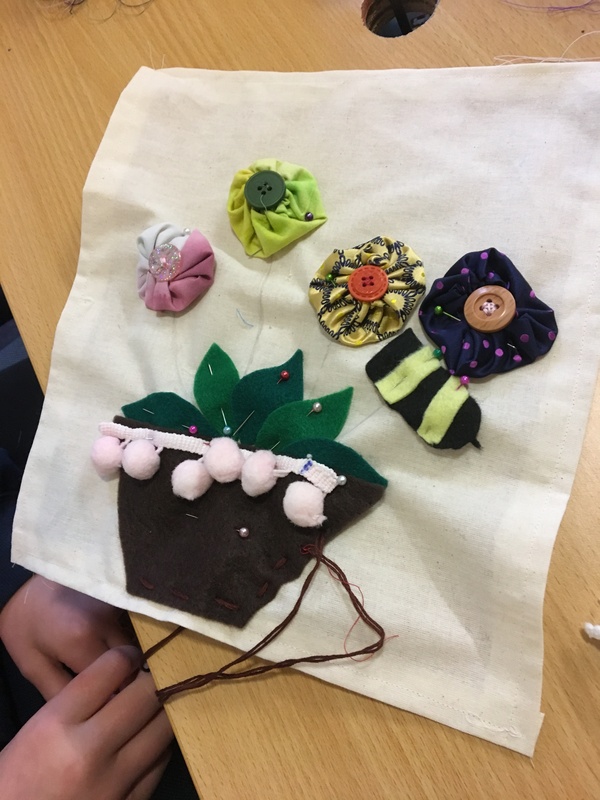 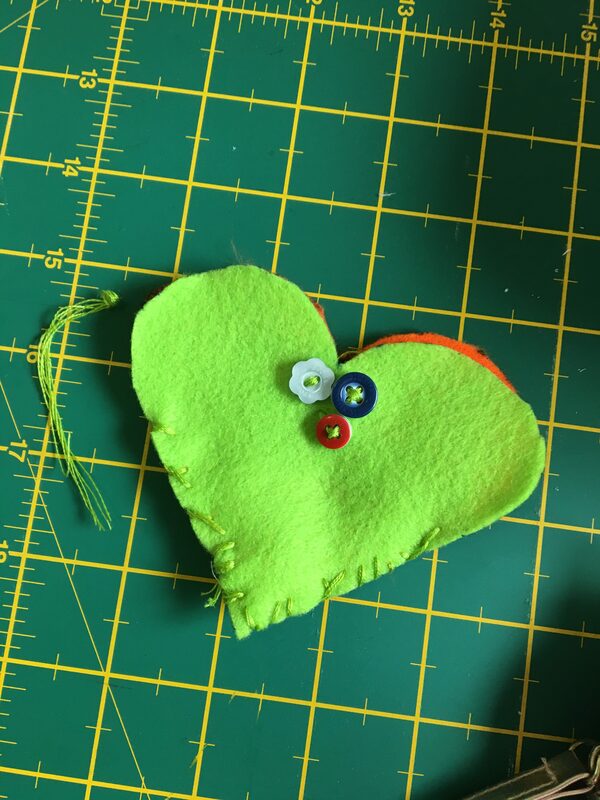 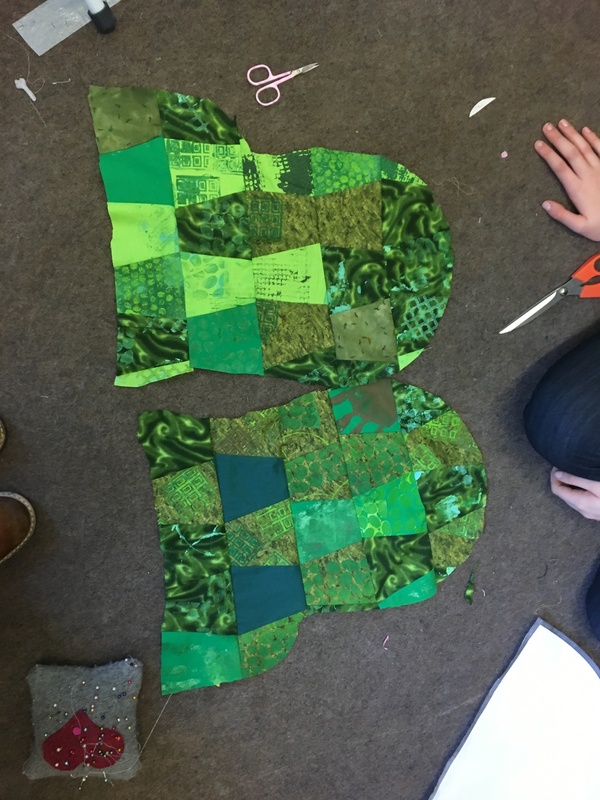 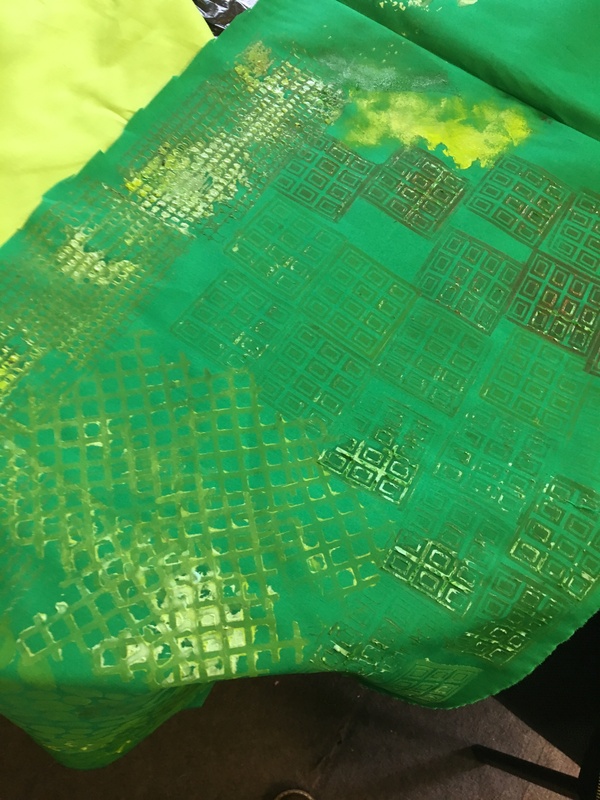 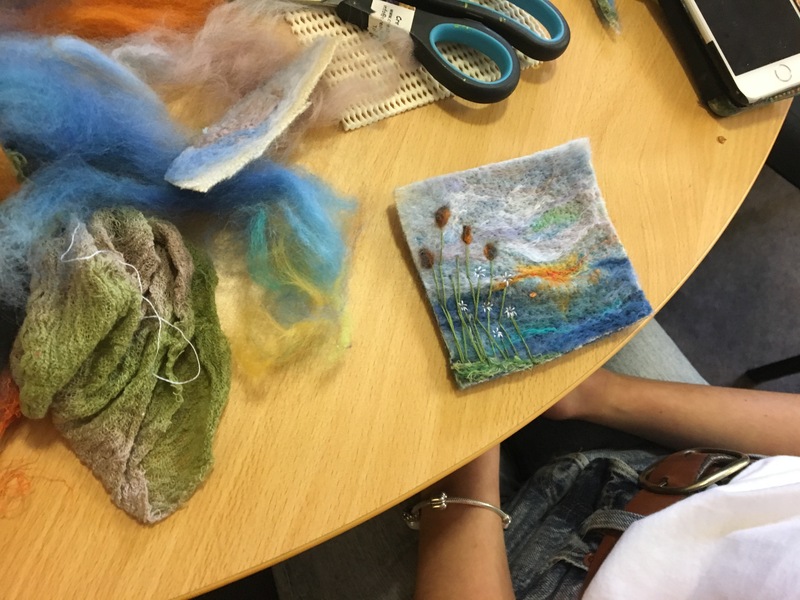 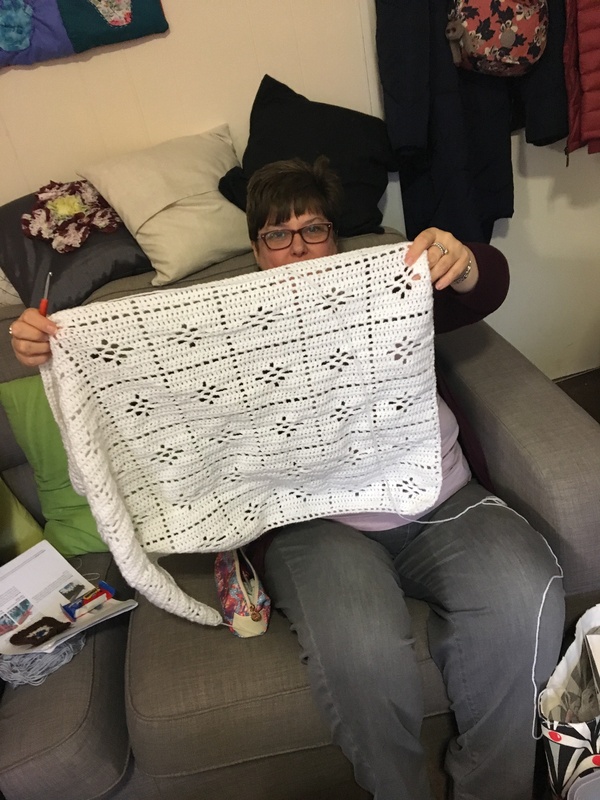 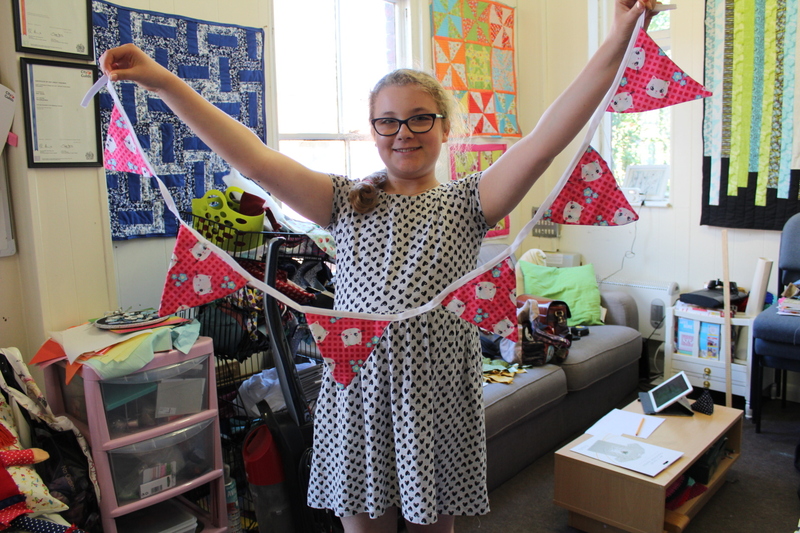 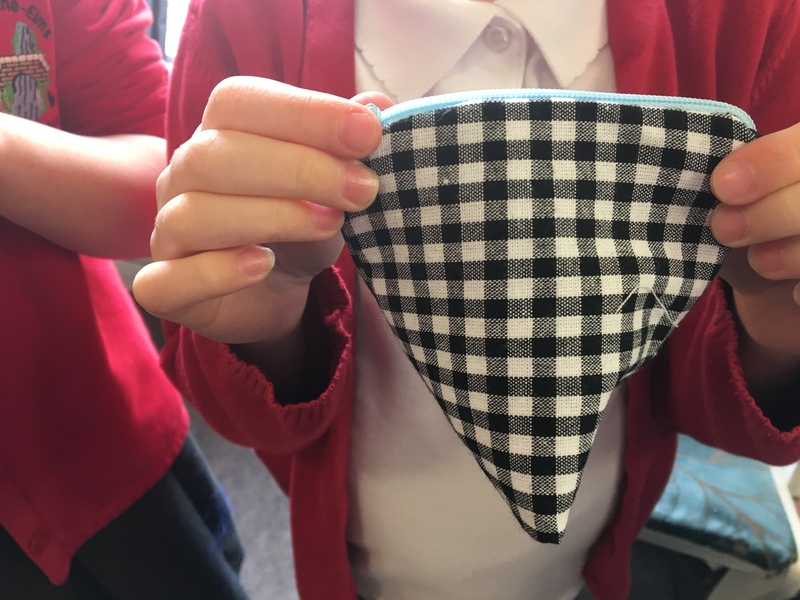 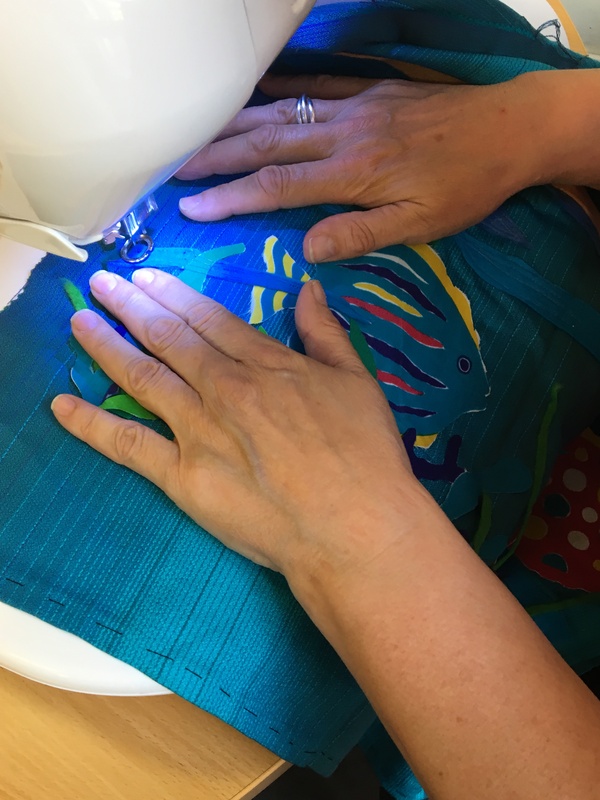 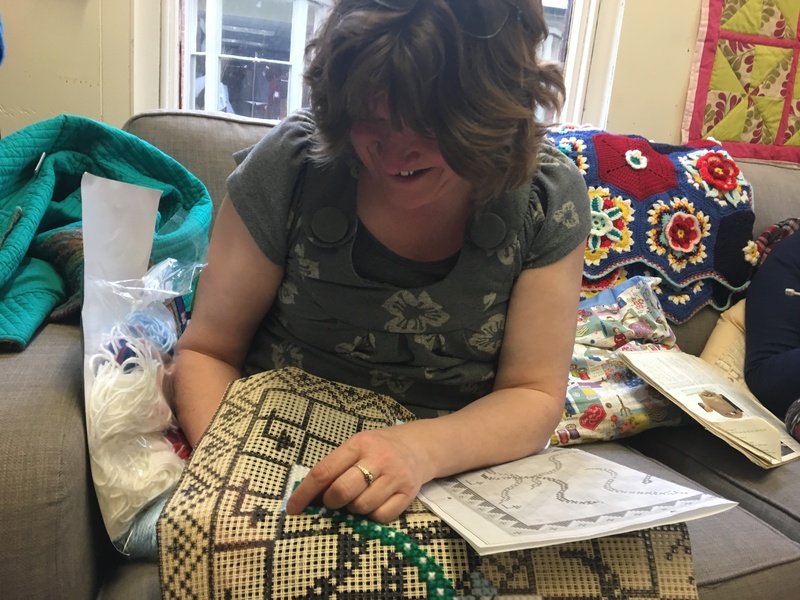 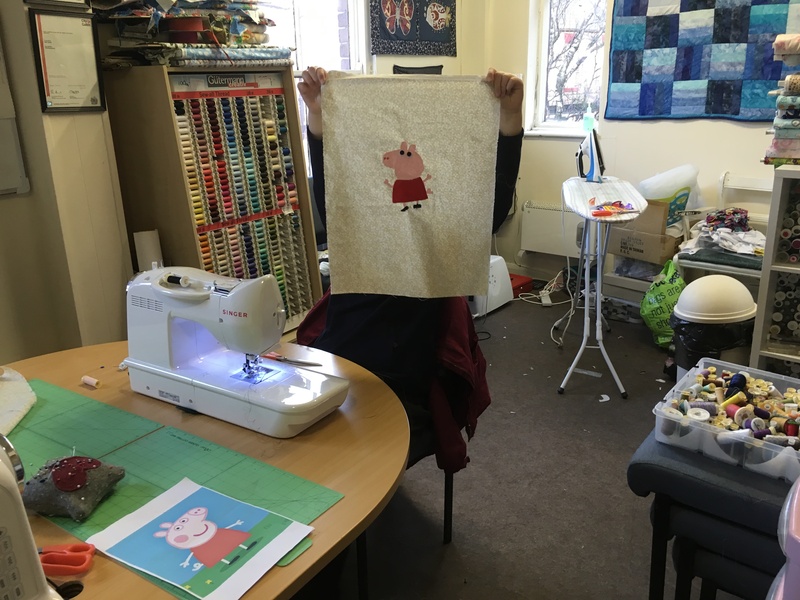 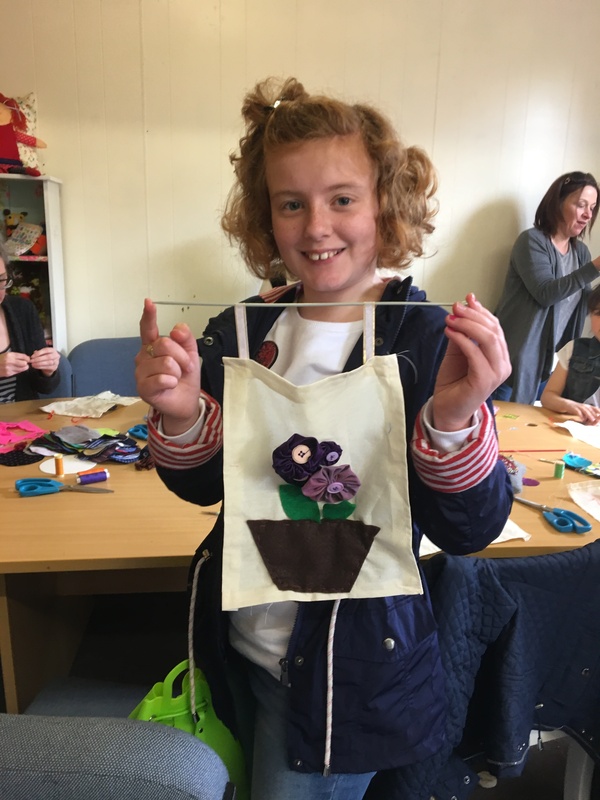 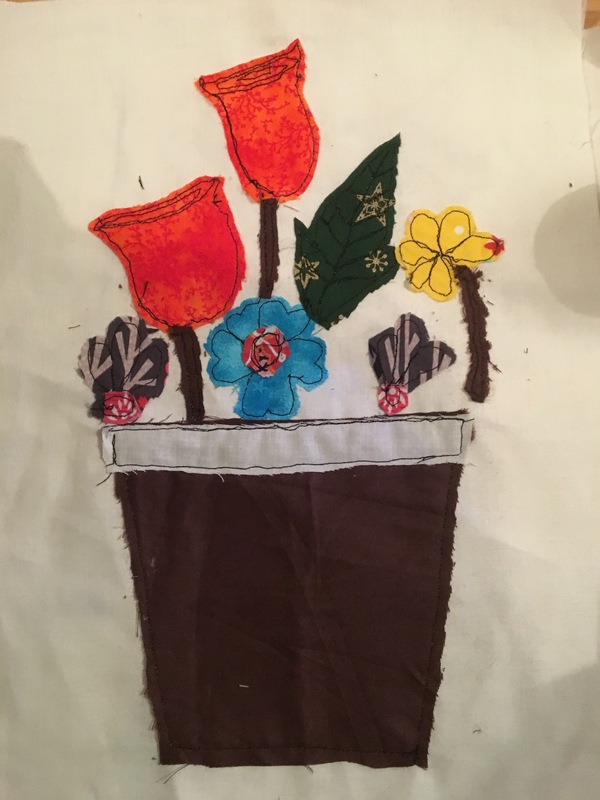 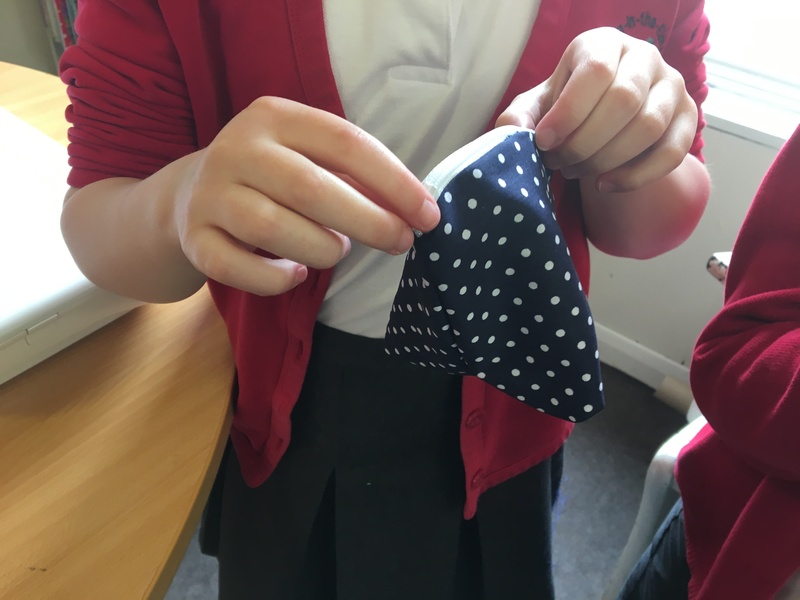 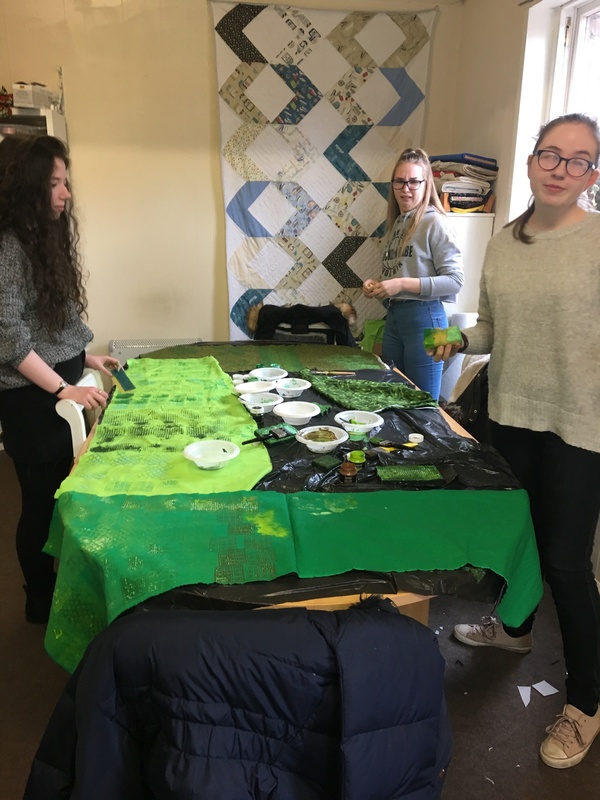 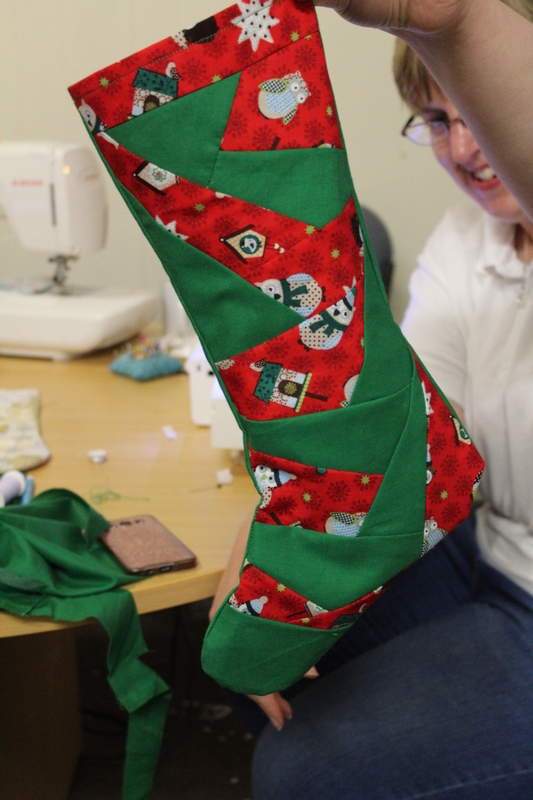 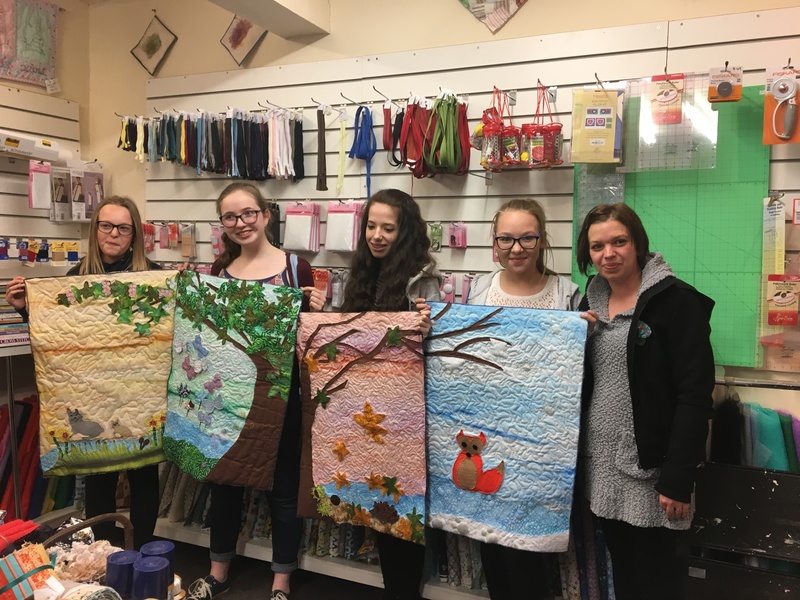 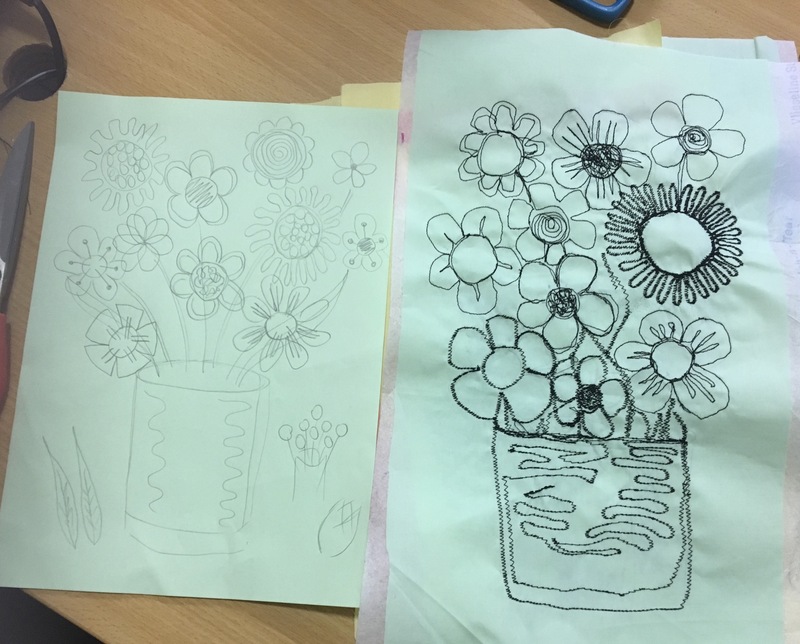 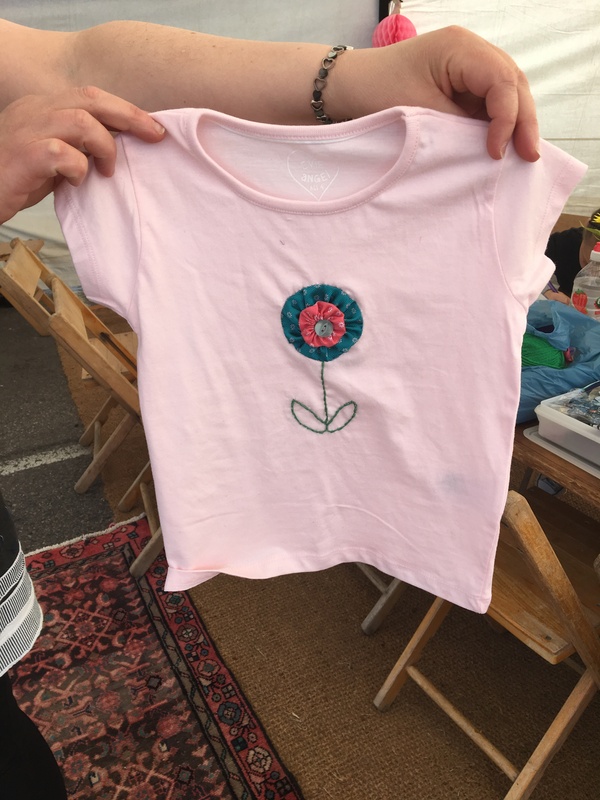 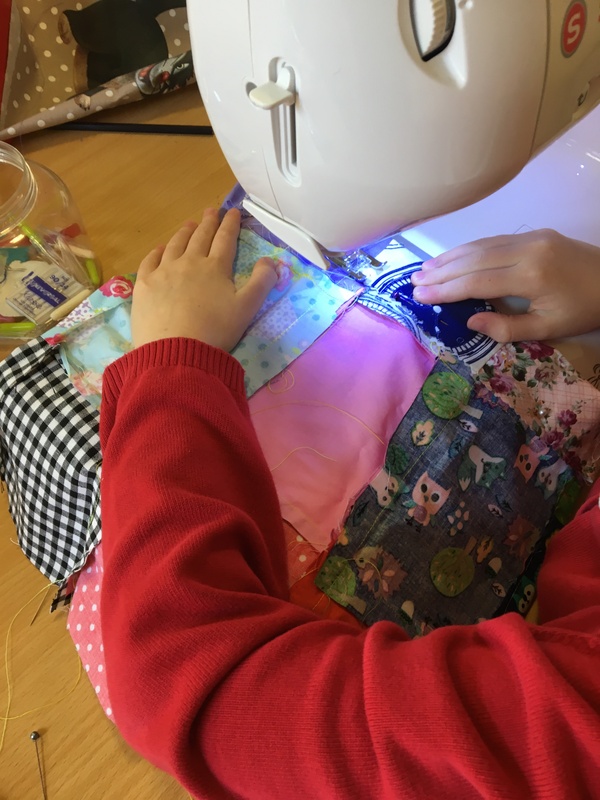 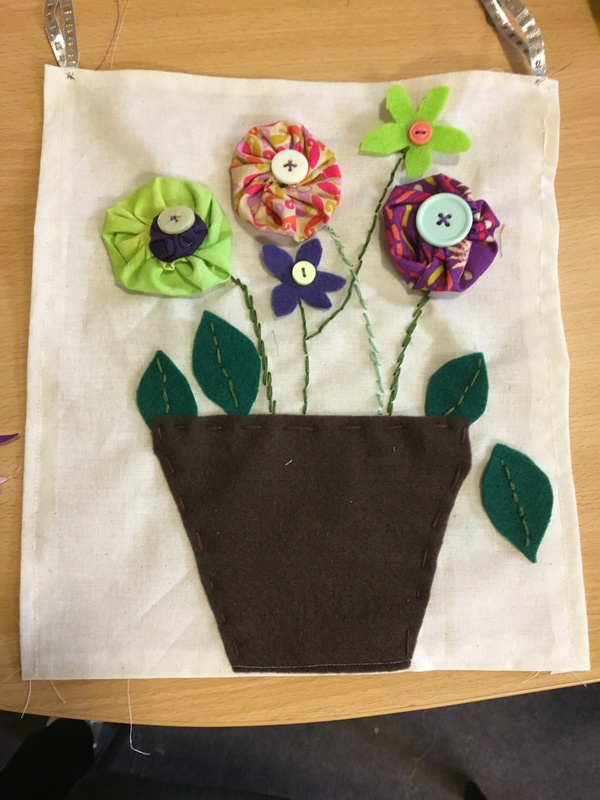 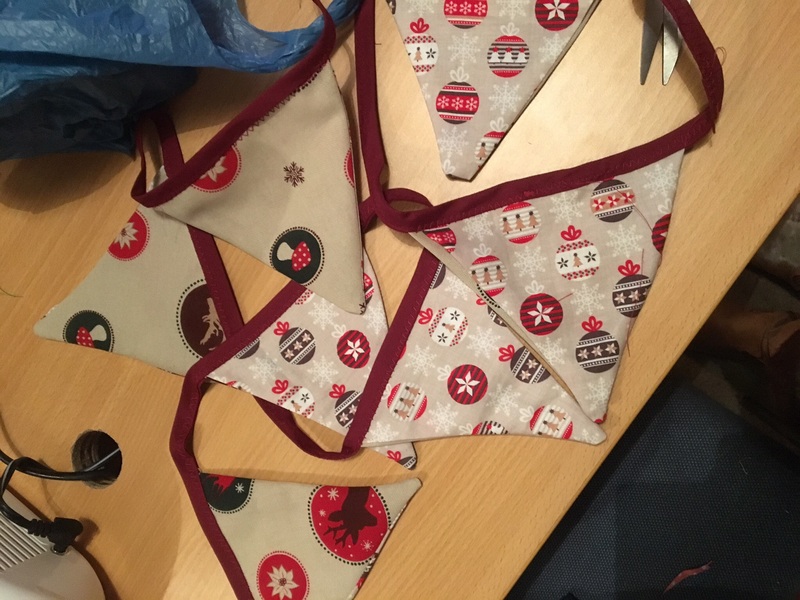 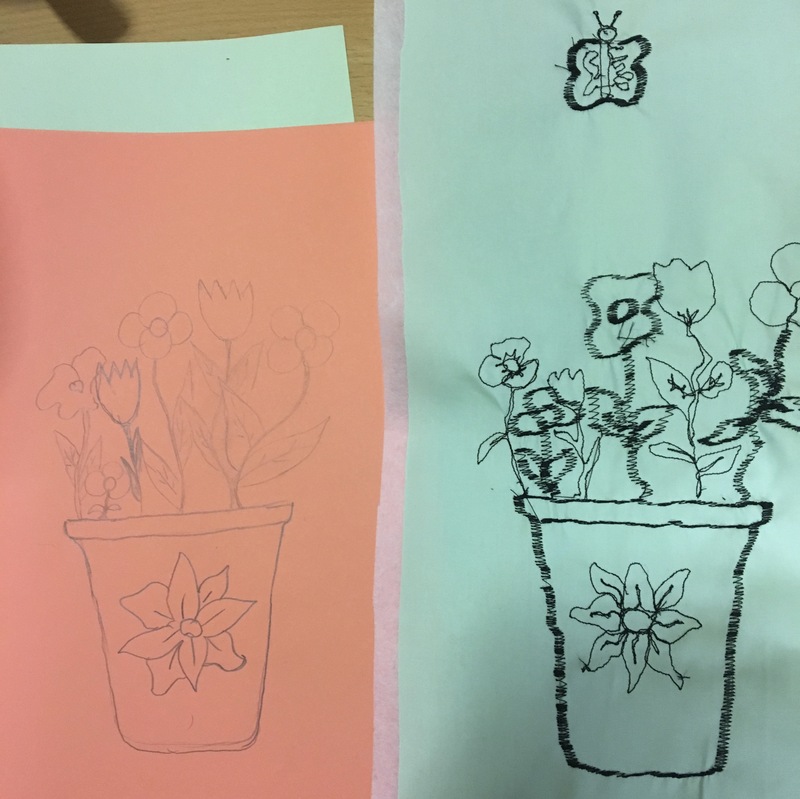 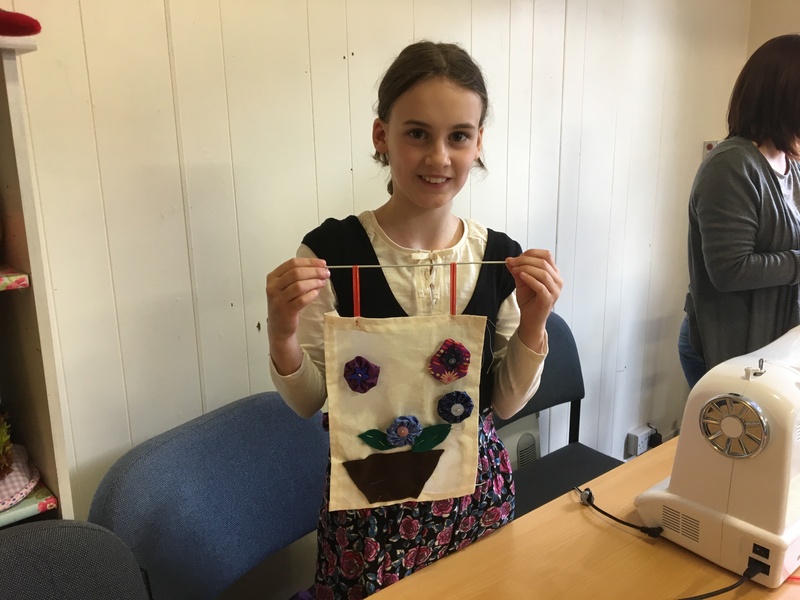 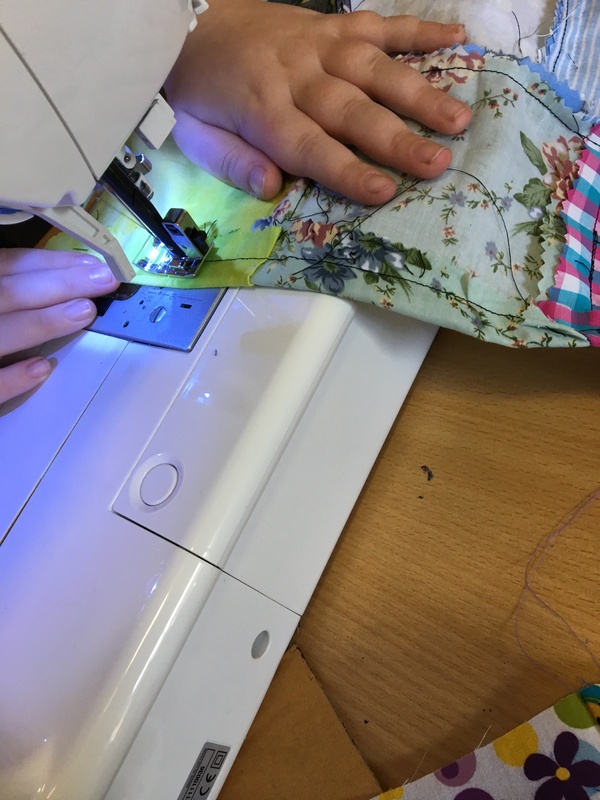 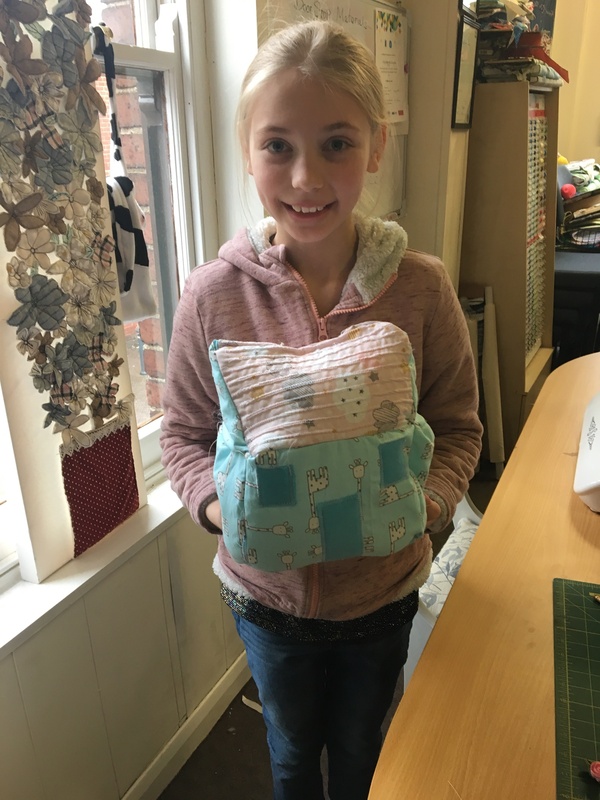 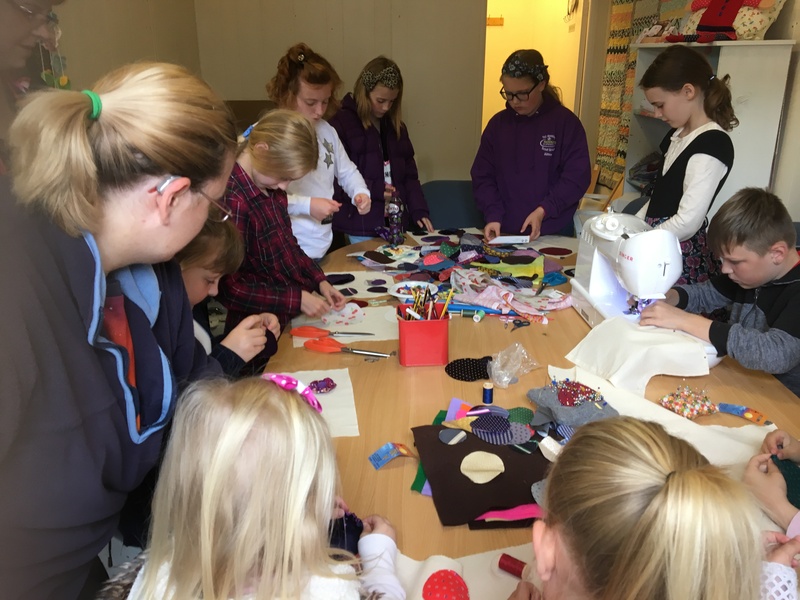 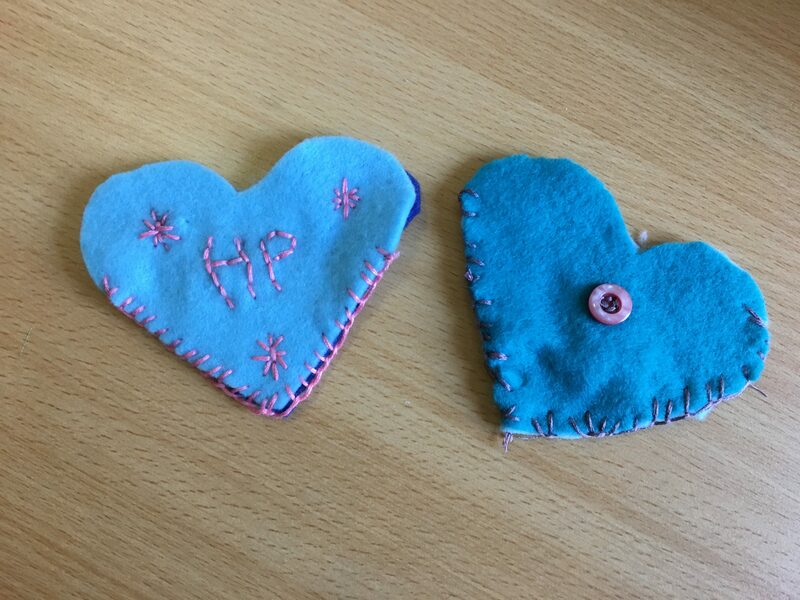 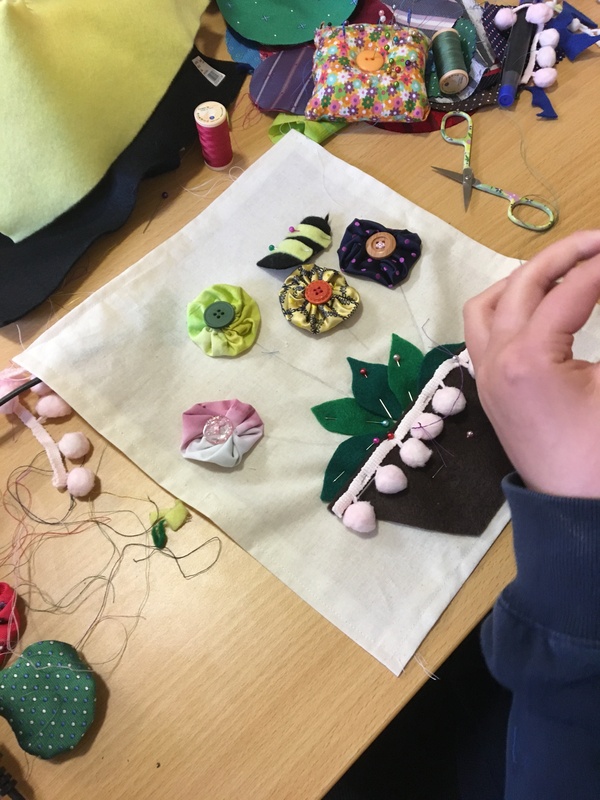 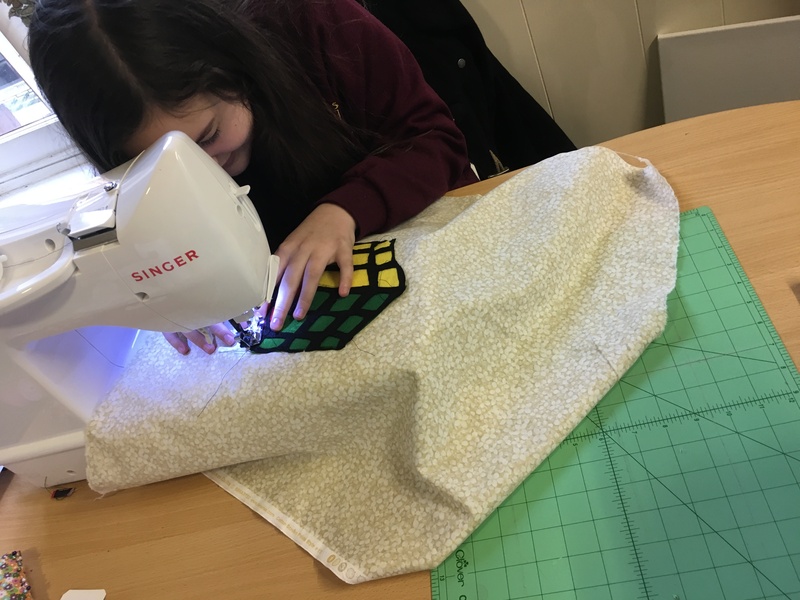 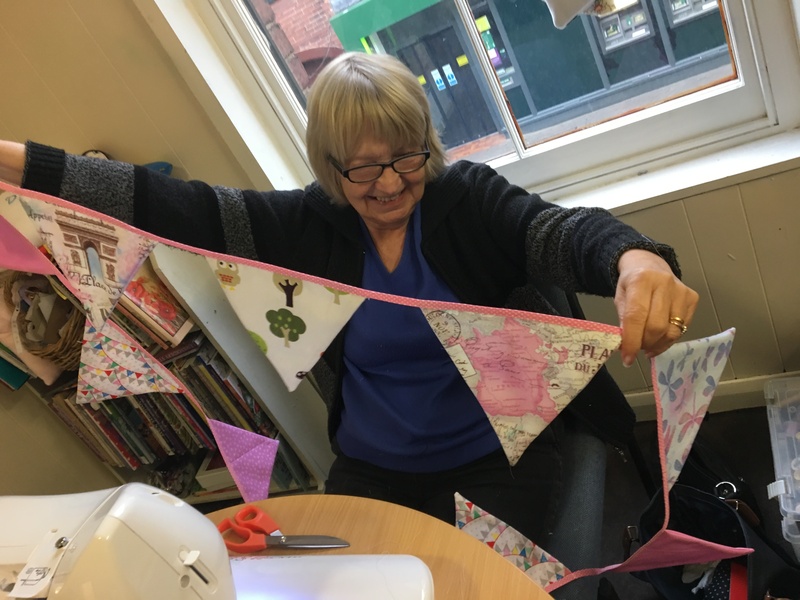 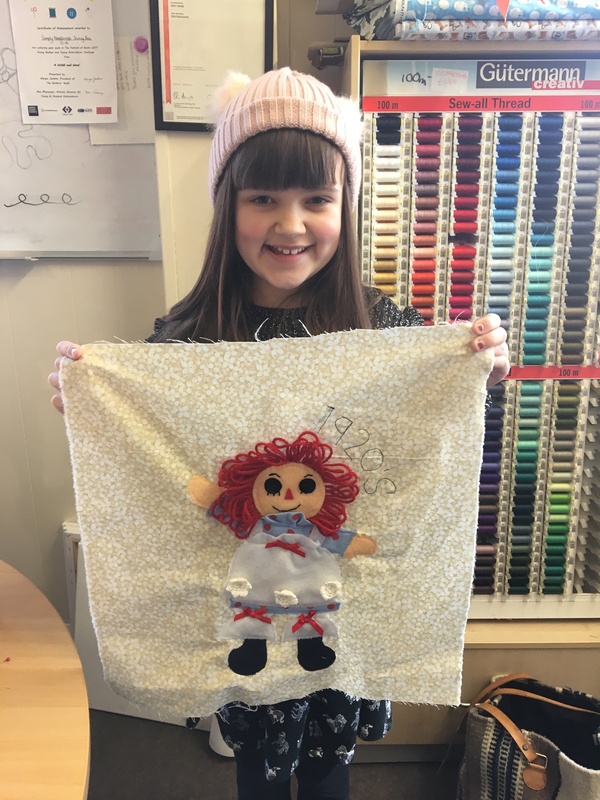 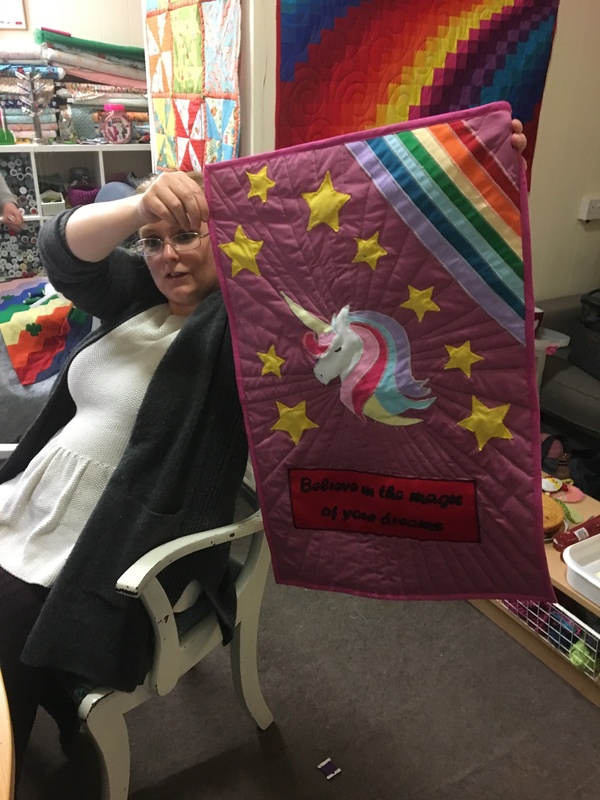 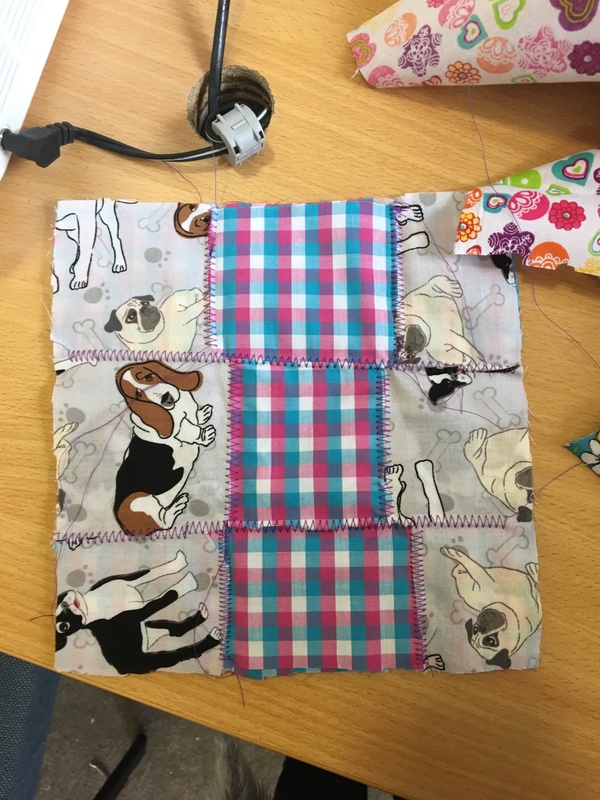 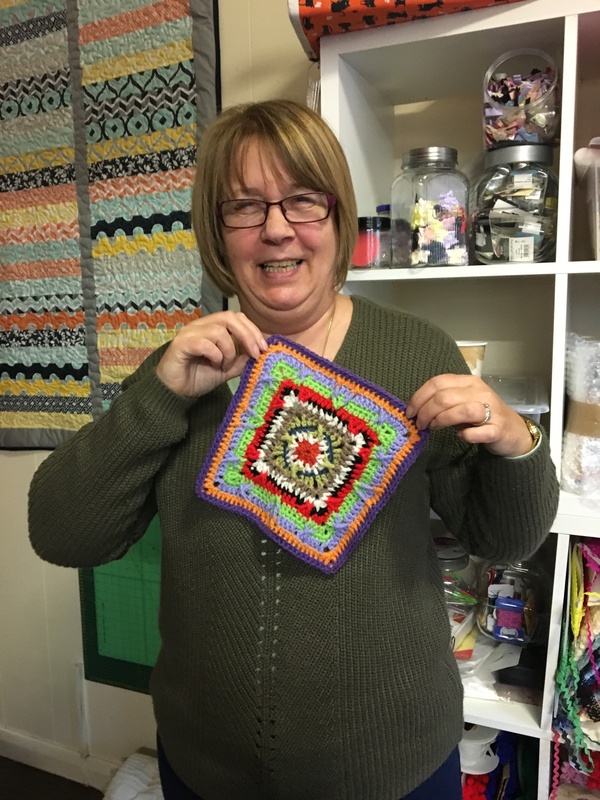 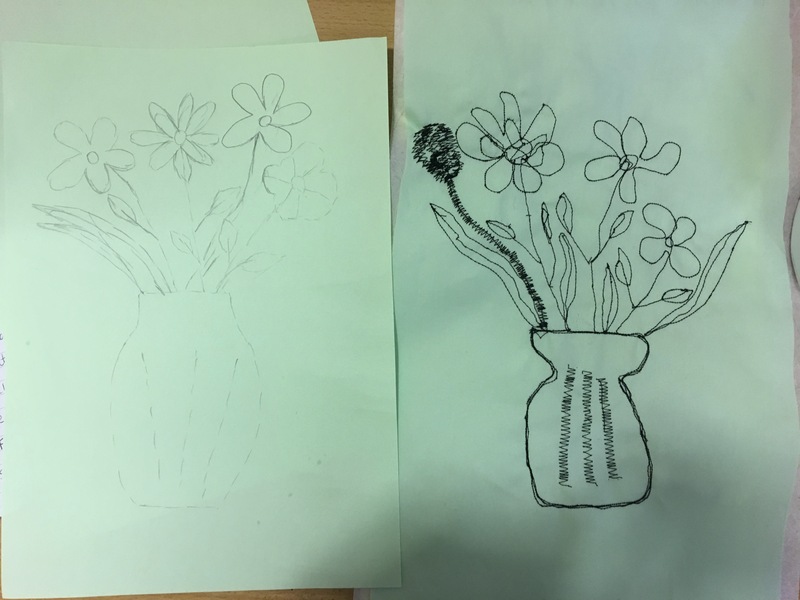 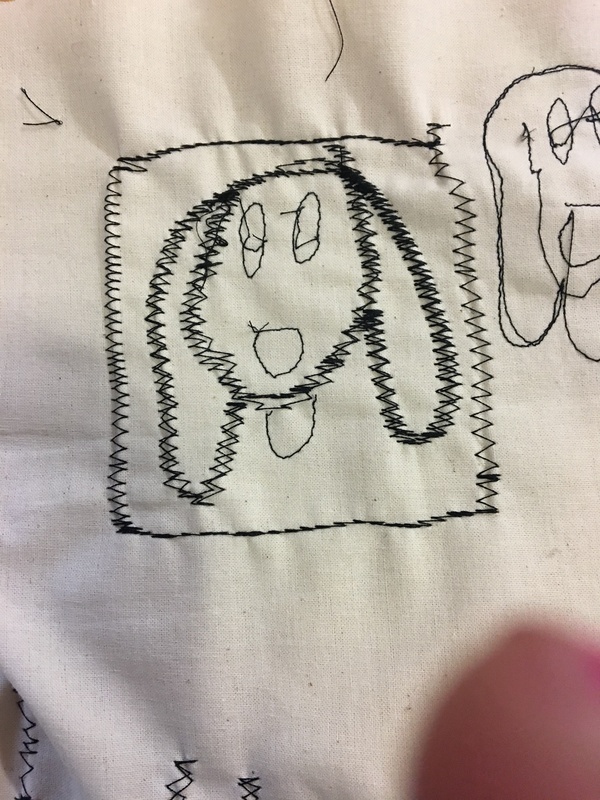 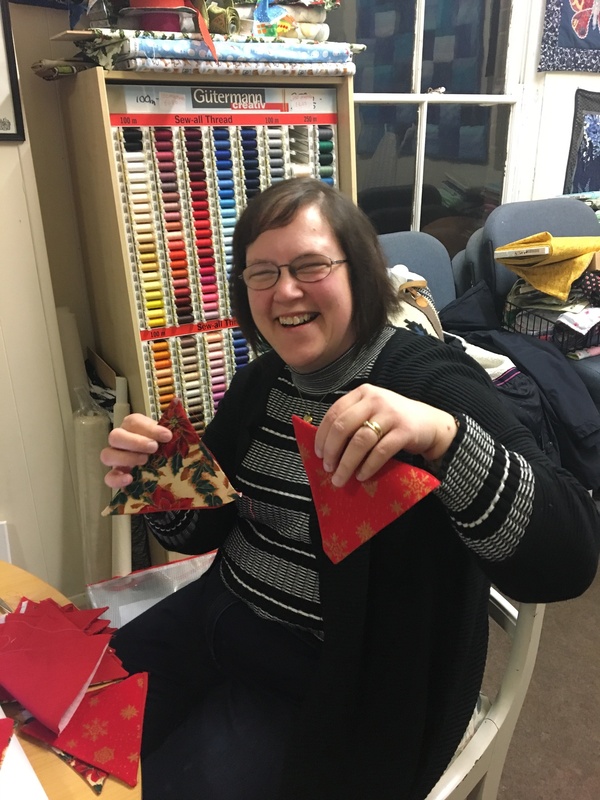 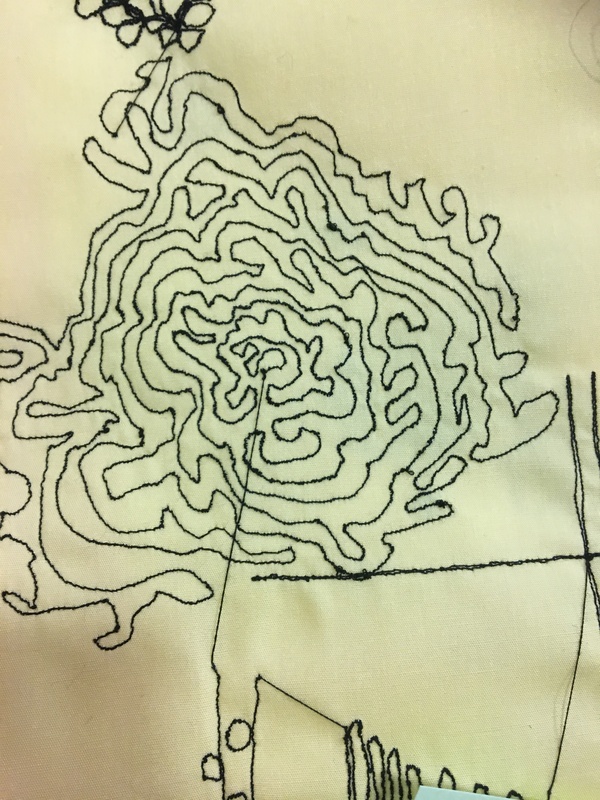 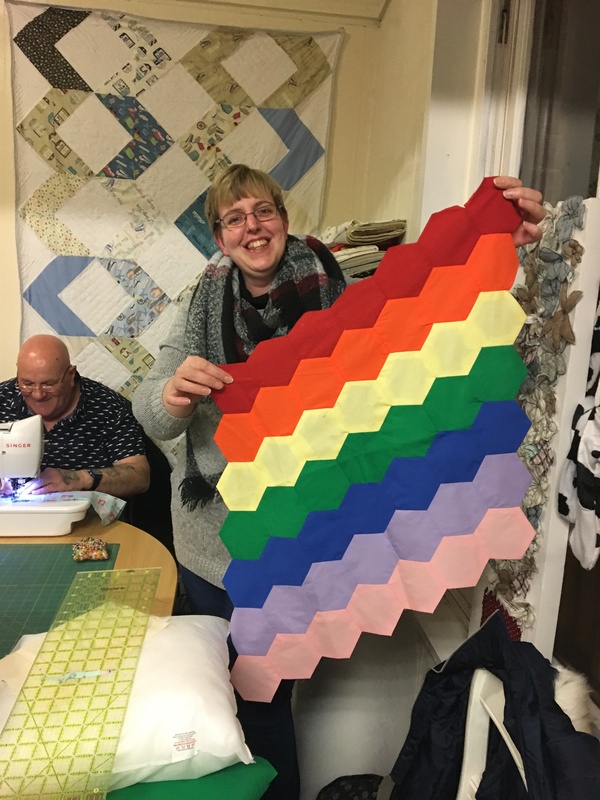 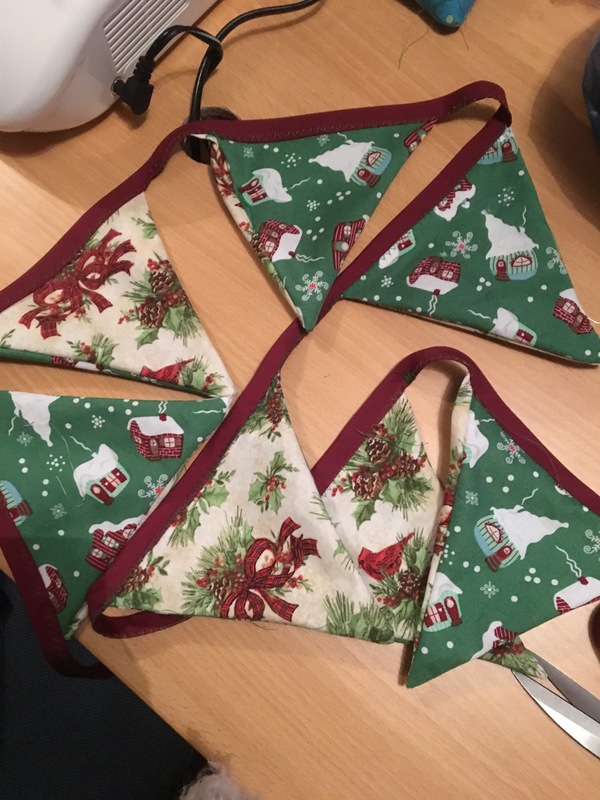 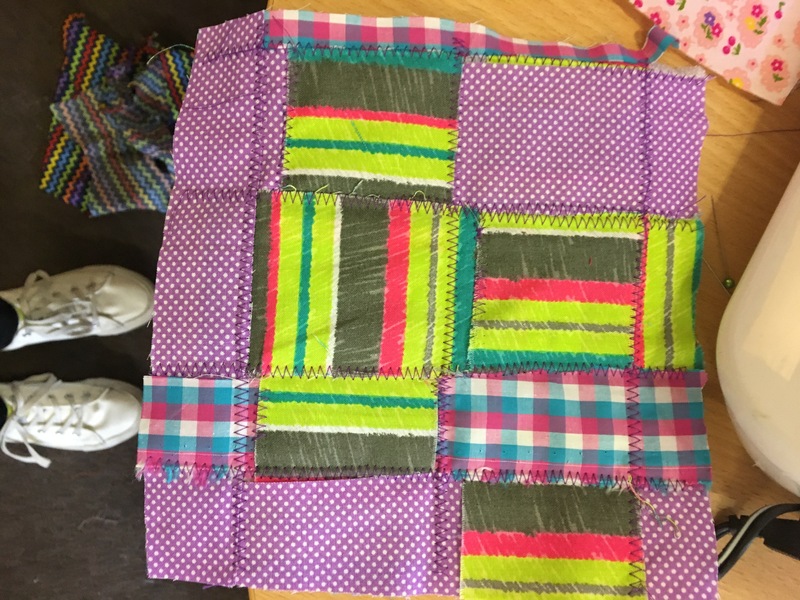 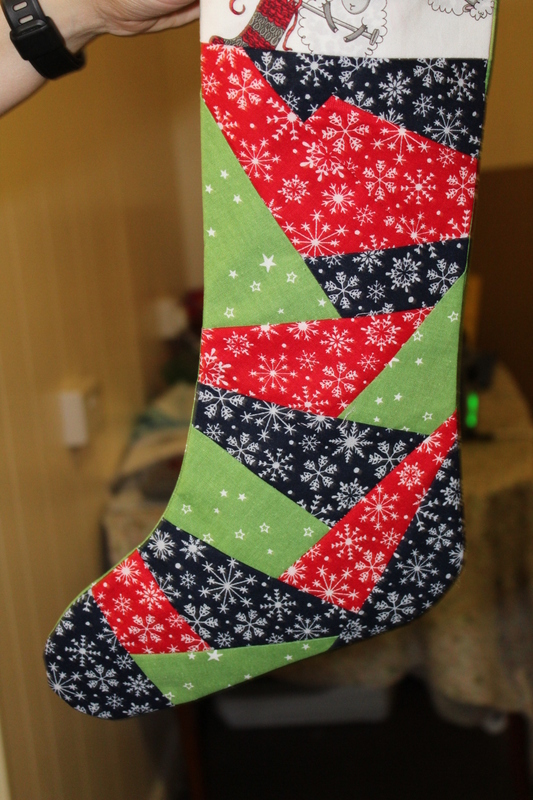 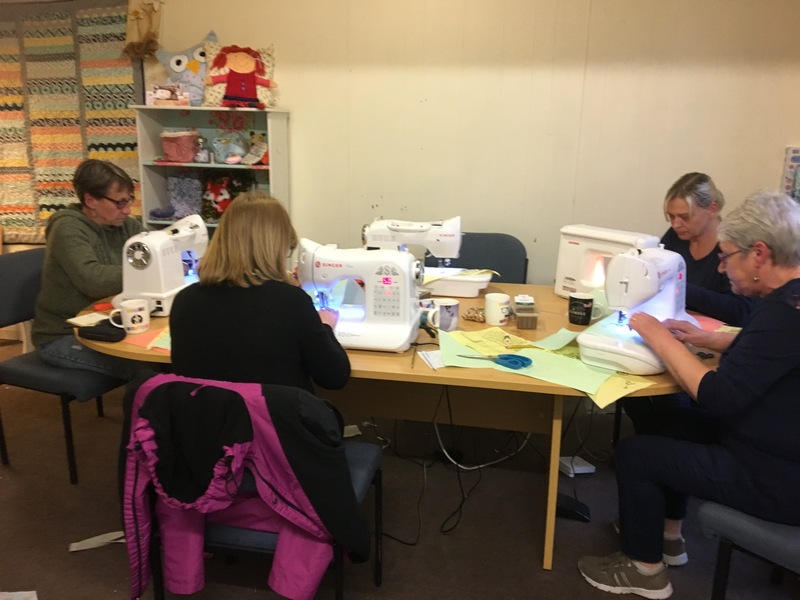 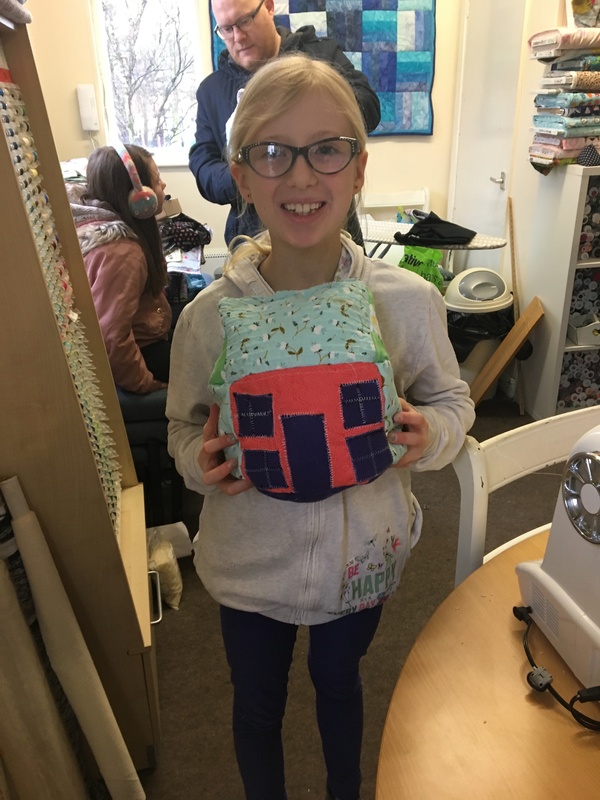 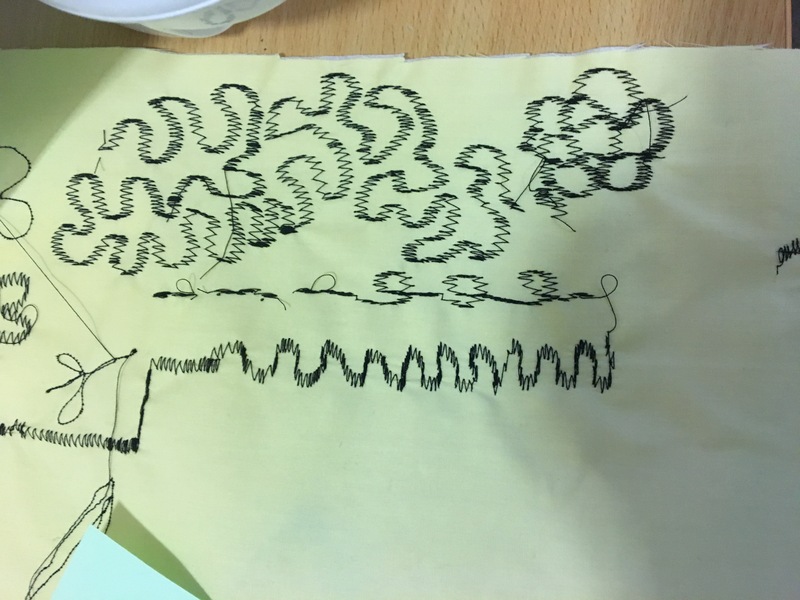 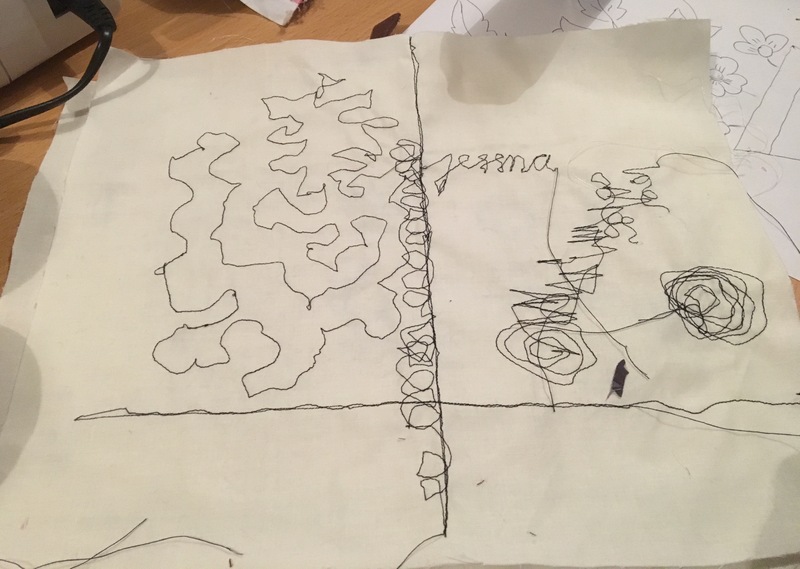 We had a busy time in the Sewing Studio too as the kids are busy working on their entries to the Festival of Quilts and the weekly crochet group come out with fantastic results…. 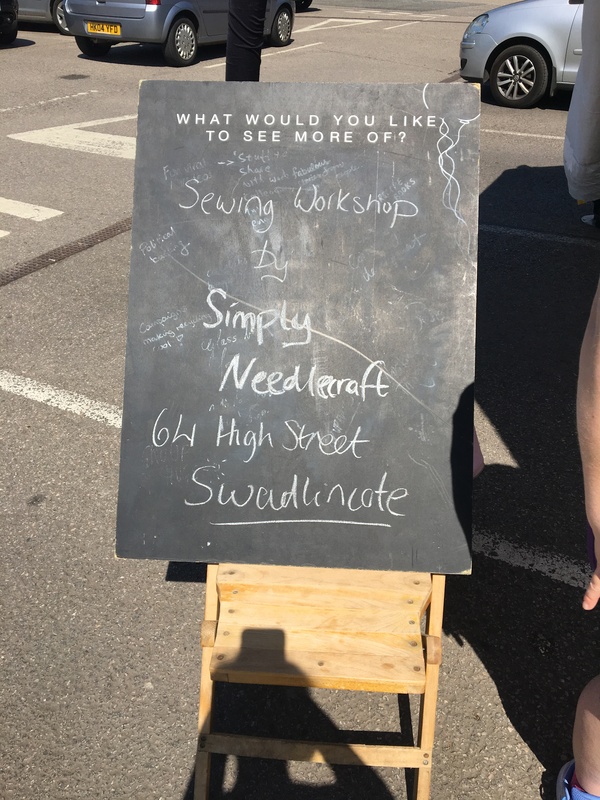 As always it’s been really busy with workshops, craft groups and the Sewing Bee. 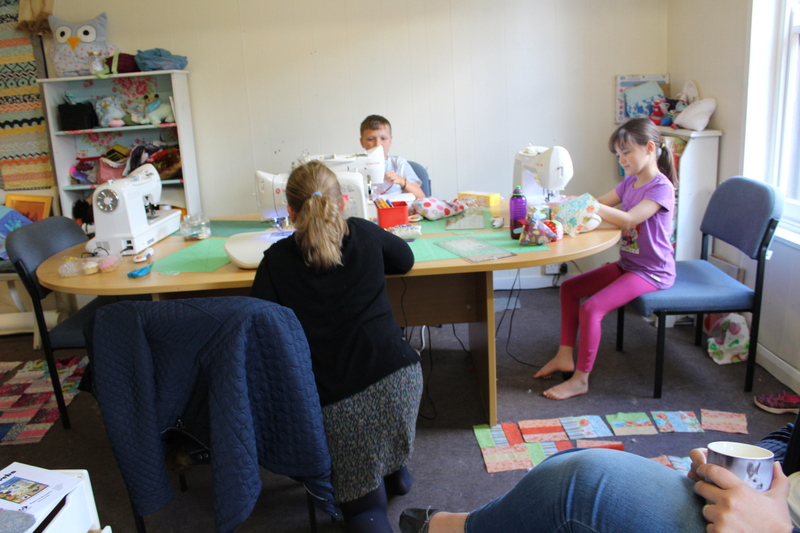 Lets st start with the little ones………. 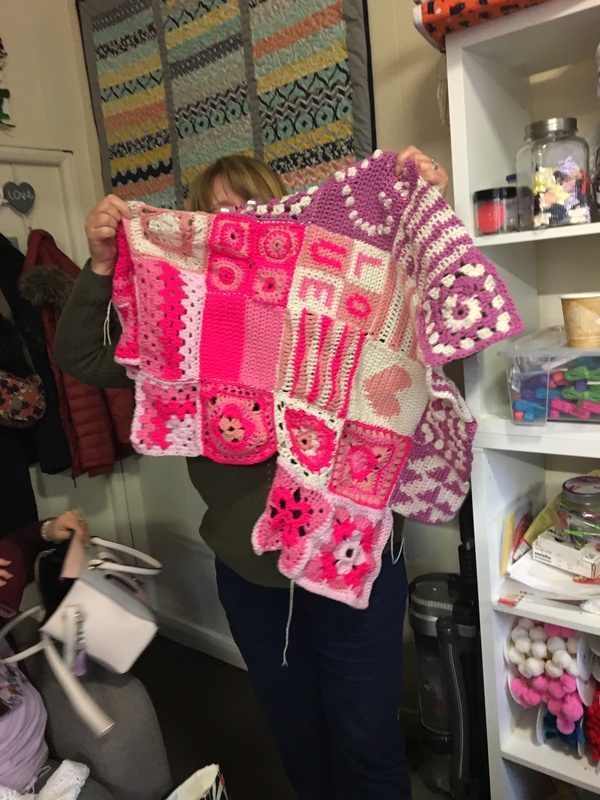 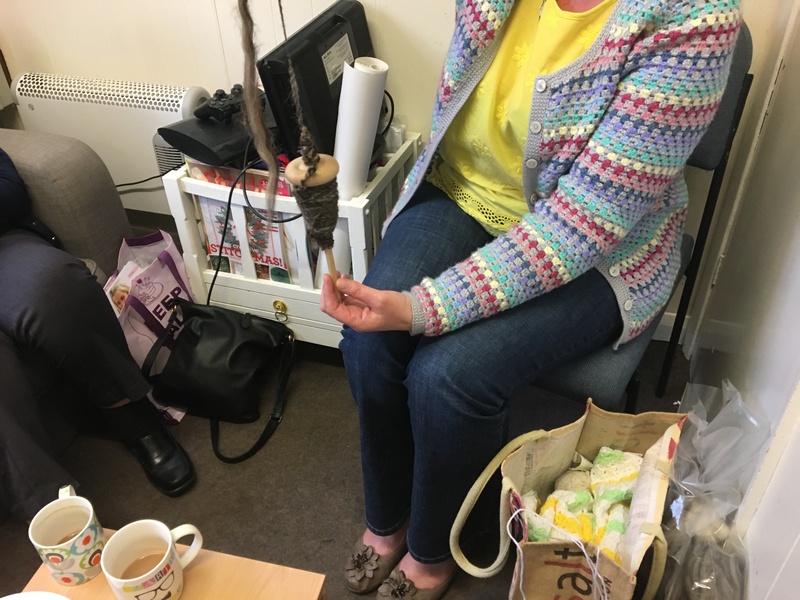 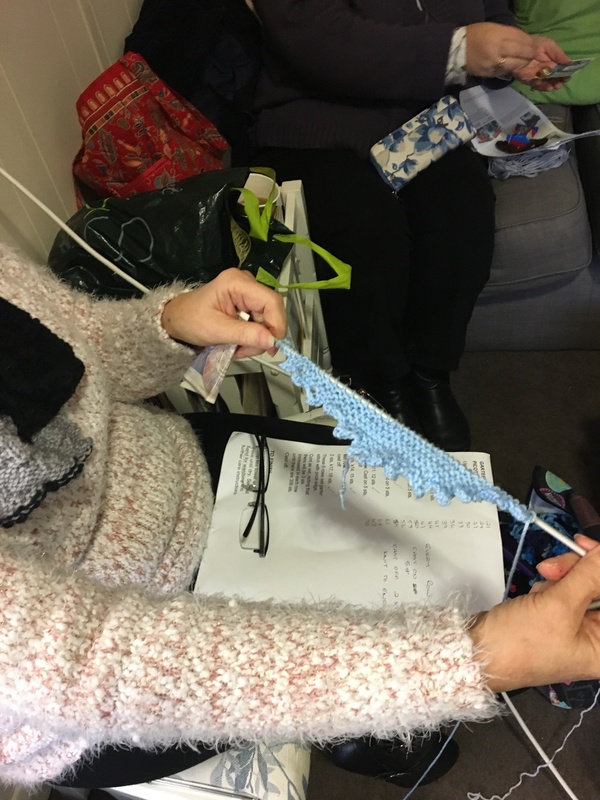 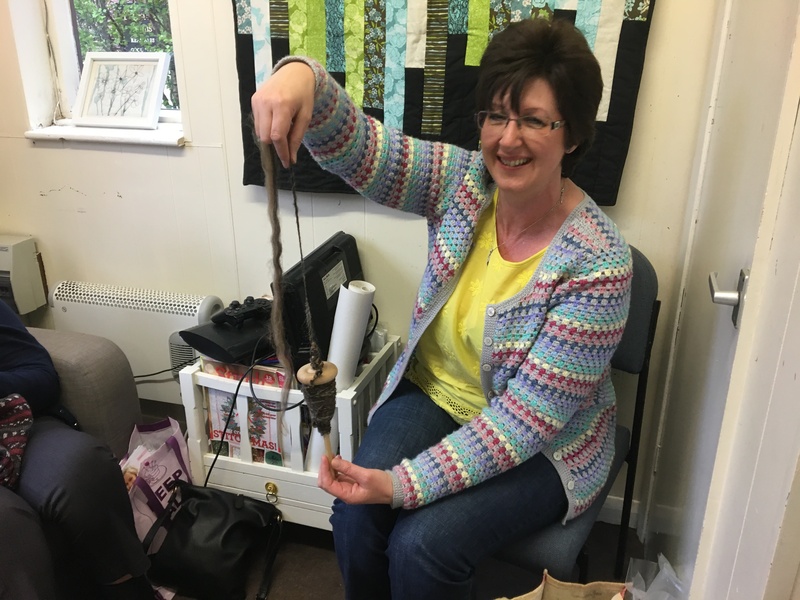 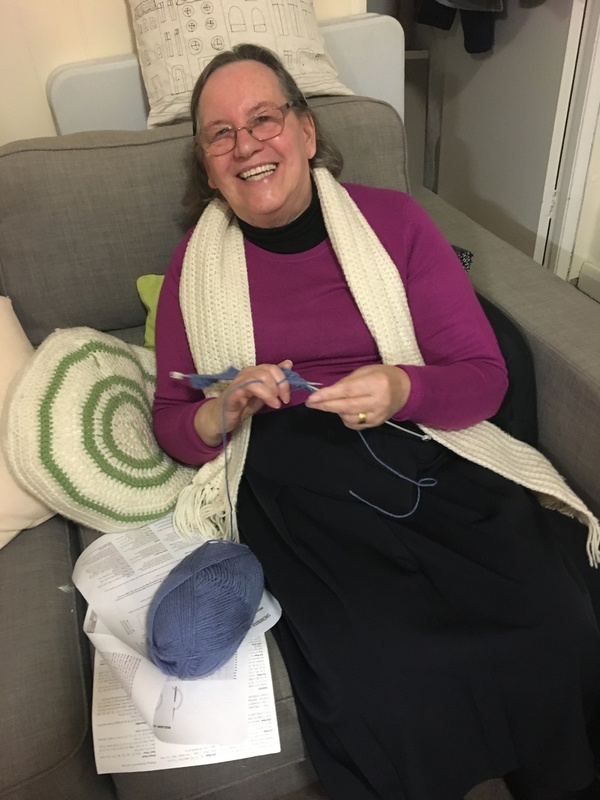 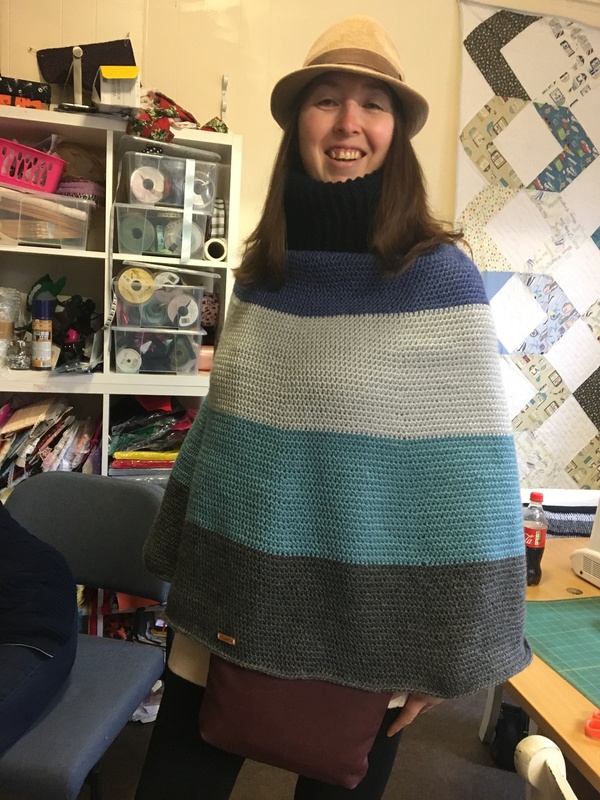 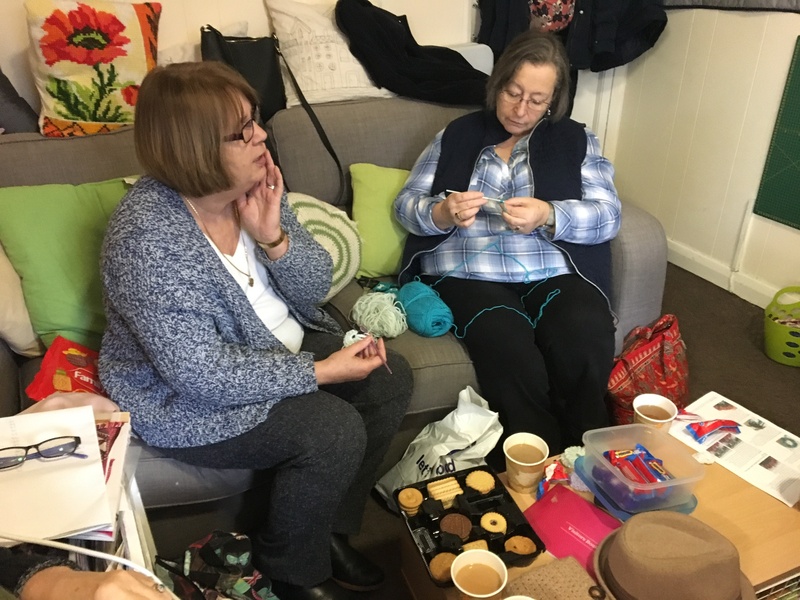 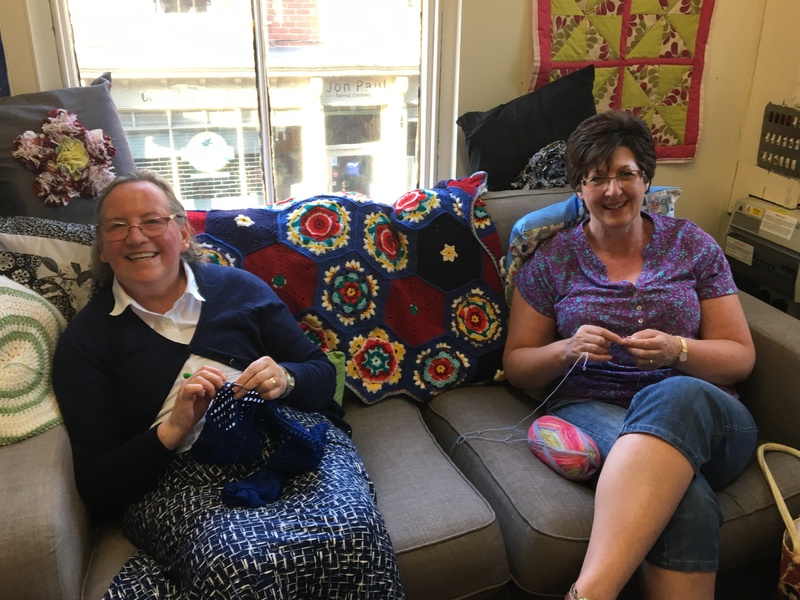 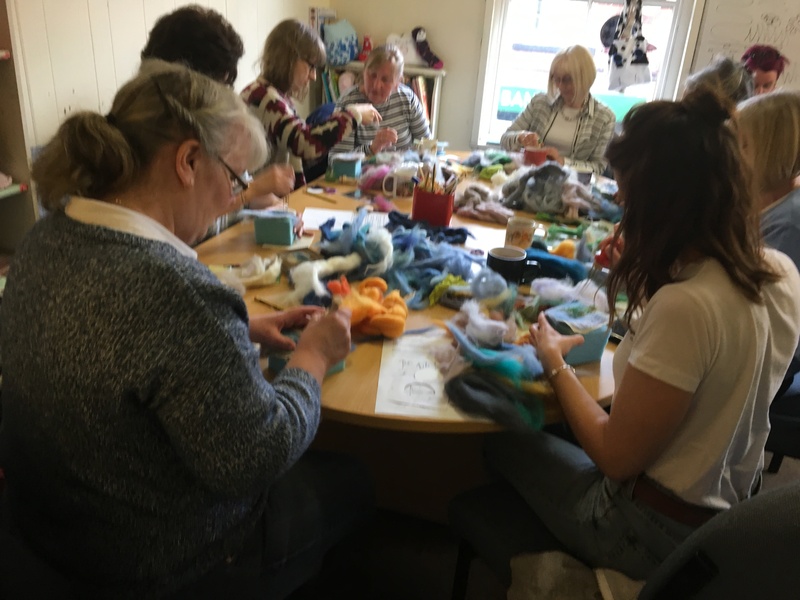 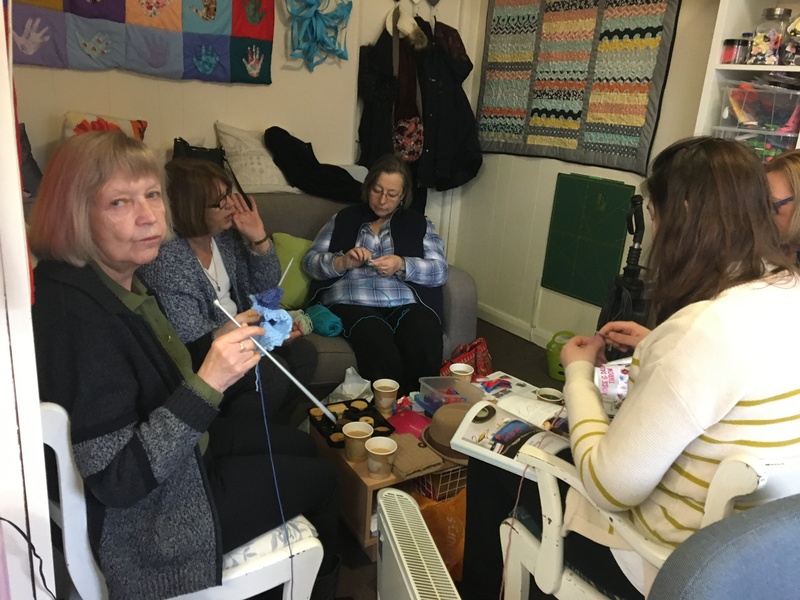 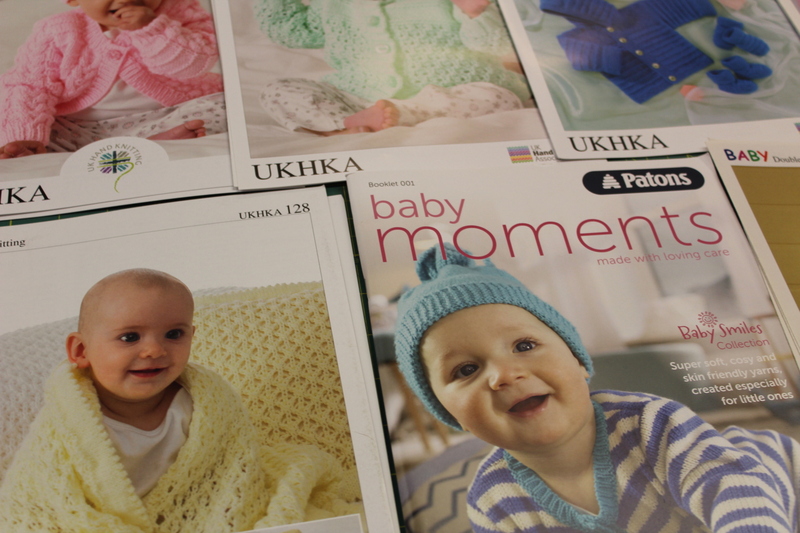 The crochet group have been working wonders with wool ……. 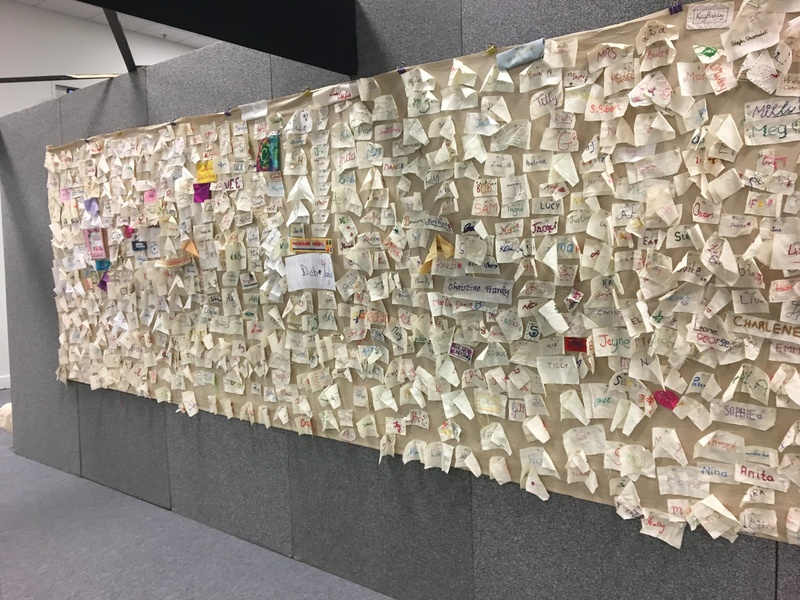 yes it’s my favourite part of the building. 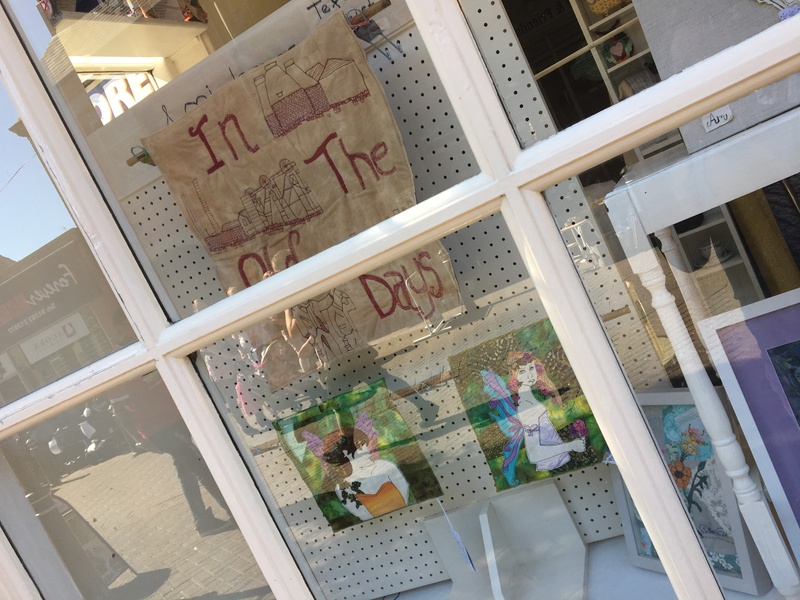 It’s a place that’s full of creativity, laughter and proud moments. 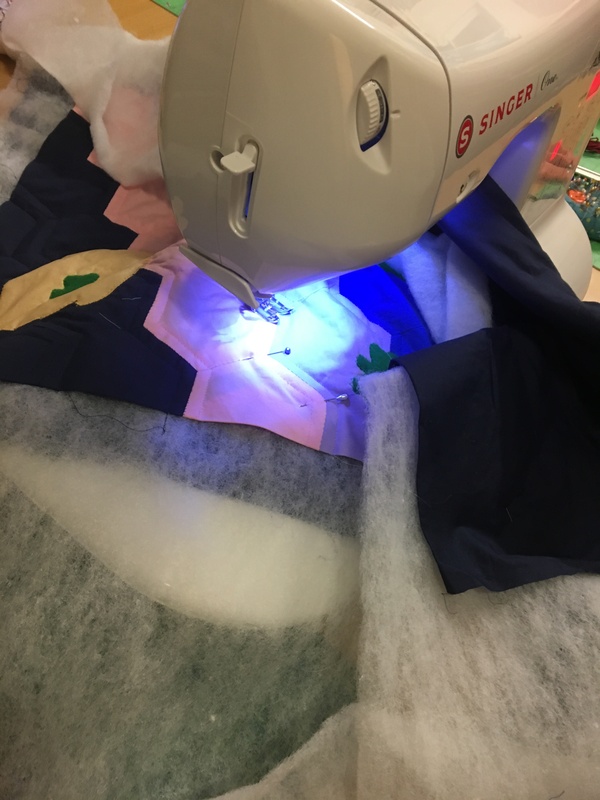 So this blog post is dedicated to everyone’s hard work. 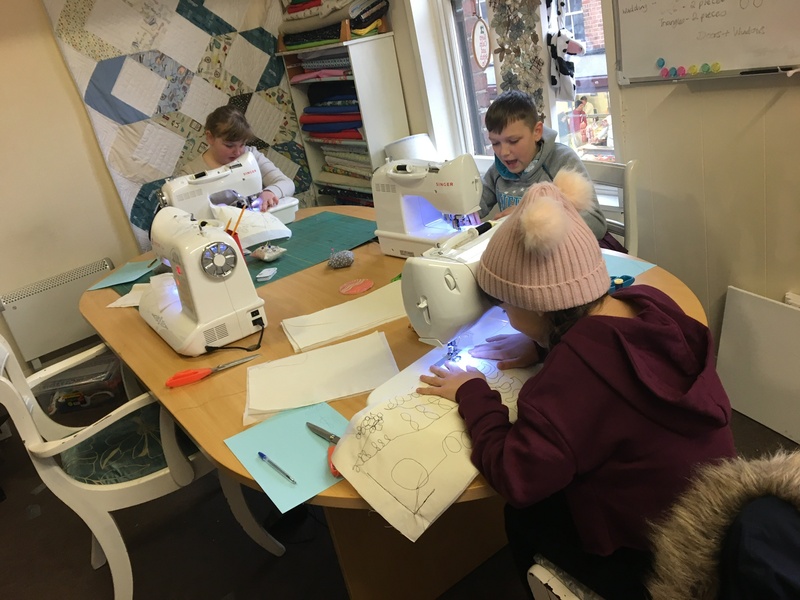 Lets start with my younger group. 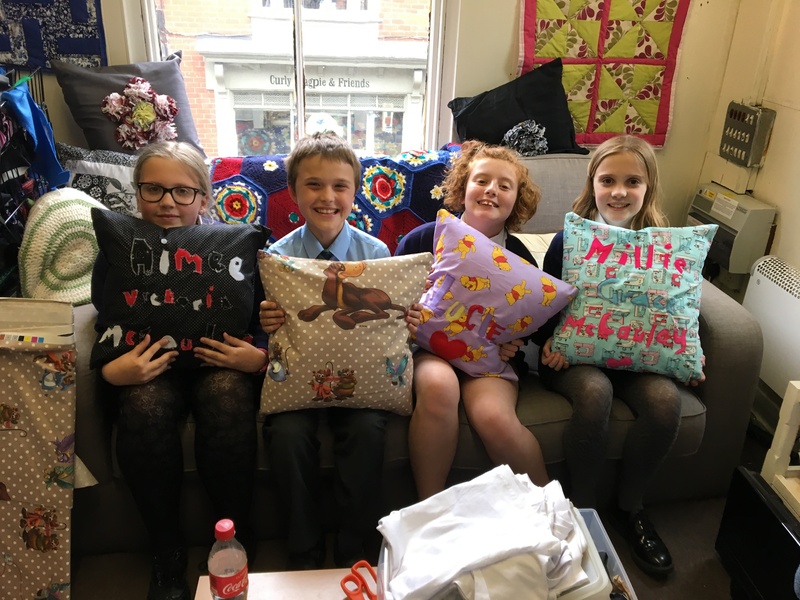 This is a group made up of three girls, Hollie, Dolcie and Ellie and one boy Luke. 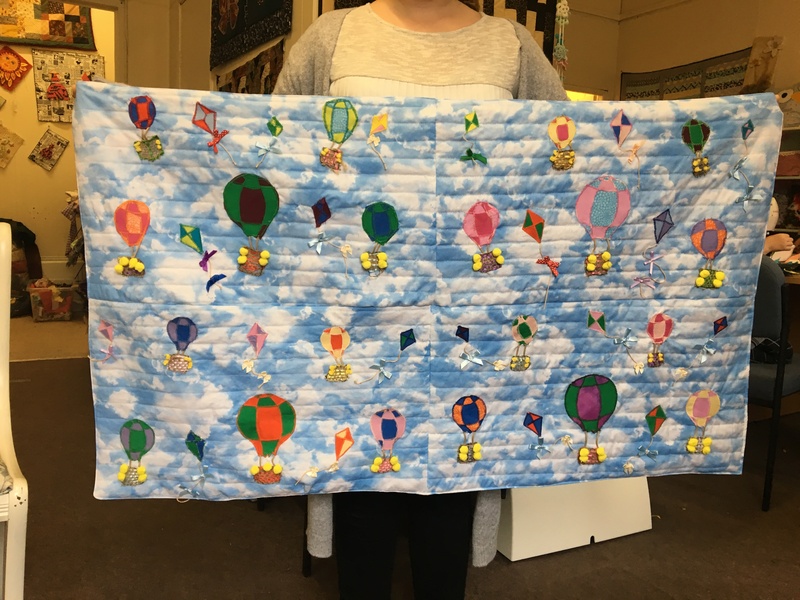 Their entry to the competition was a quilt called Up, up & away. 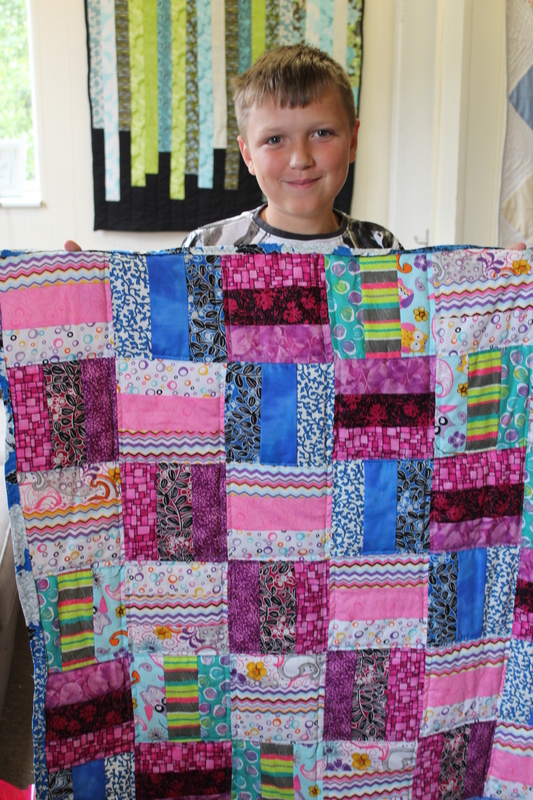 They have been working hard since Christmas to get the quilt finished before the deadline. 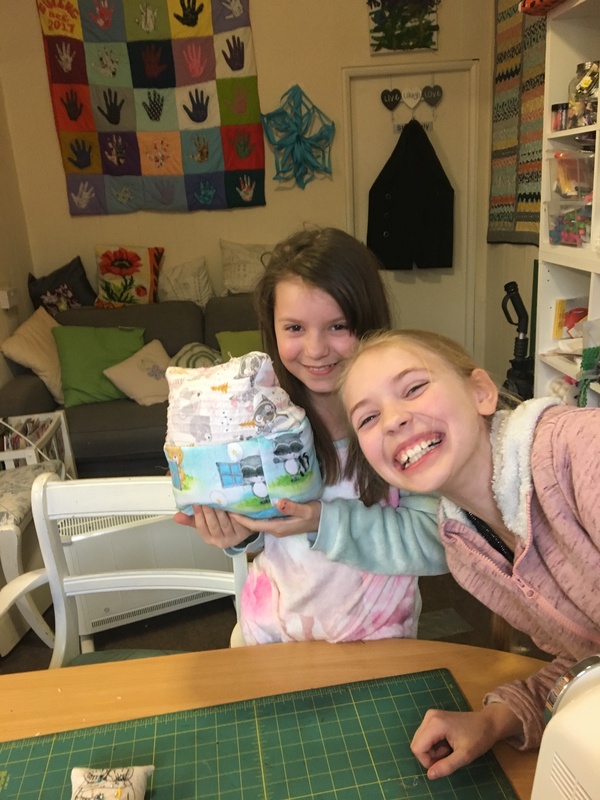 My older group is made up of four girls, Elizabeth, Hope, Mia and Molly. 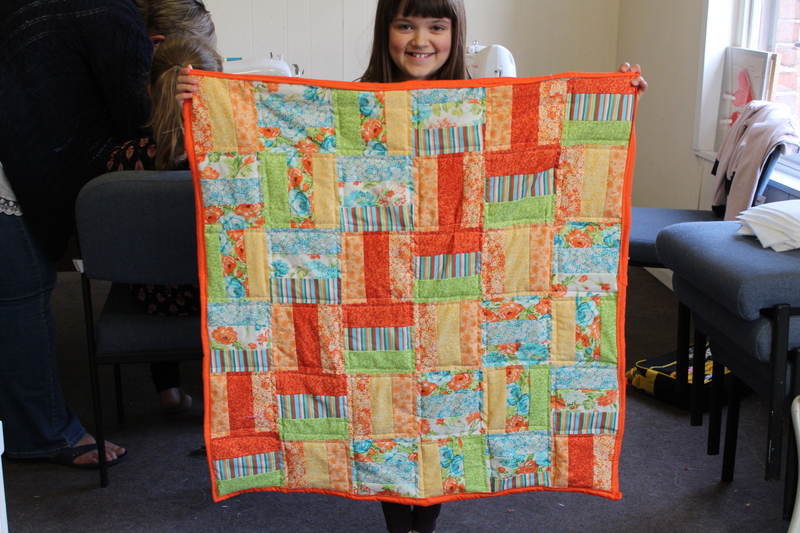 Their quilt was named Natures Wardrobe. 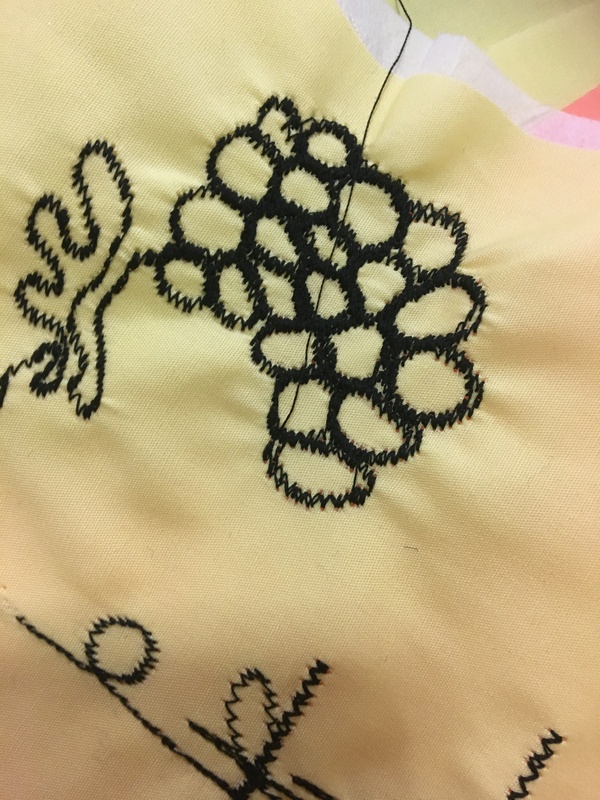 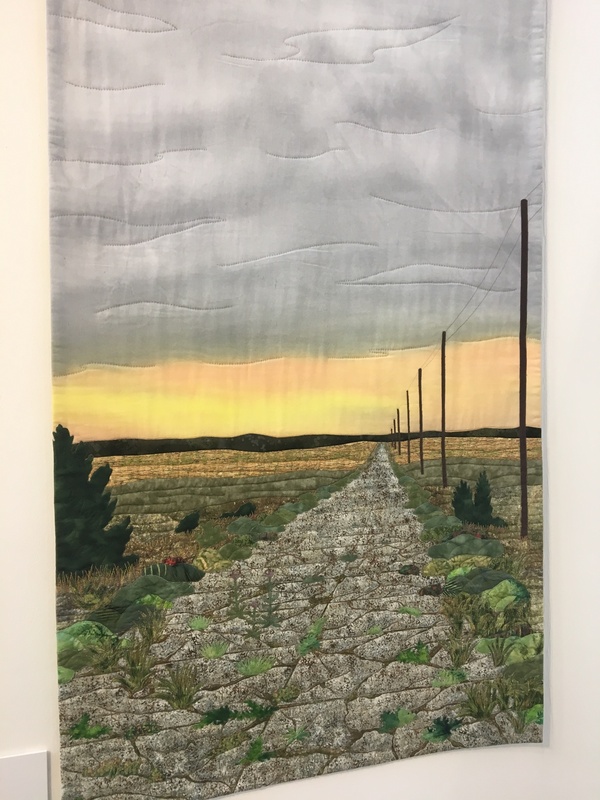 They used hand dying, raw edge appliqué, free motion stitching and free motion quilting techniques. 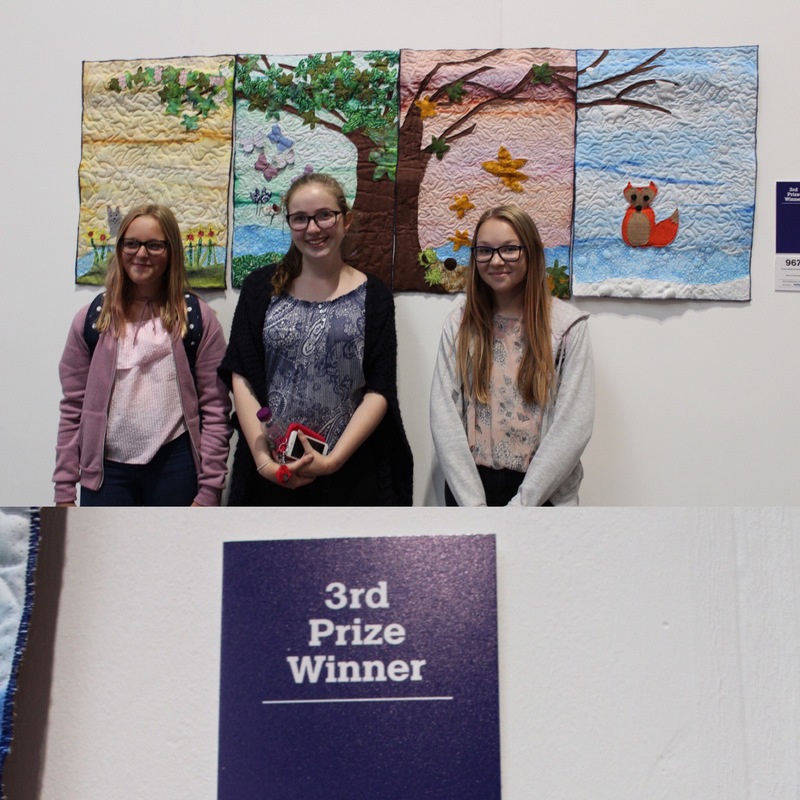 The win 3rd place in the competition…. 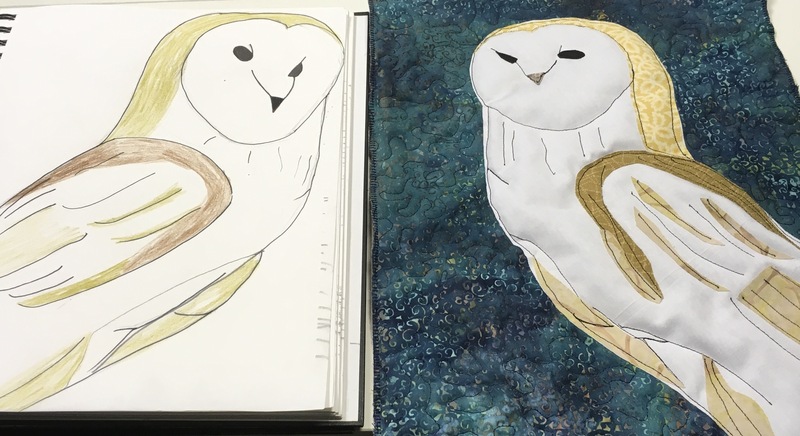 Both groups have worked extremely hard and I’m so proud of them. 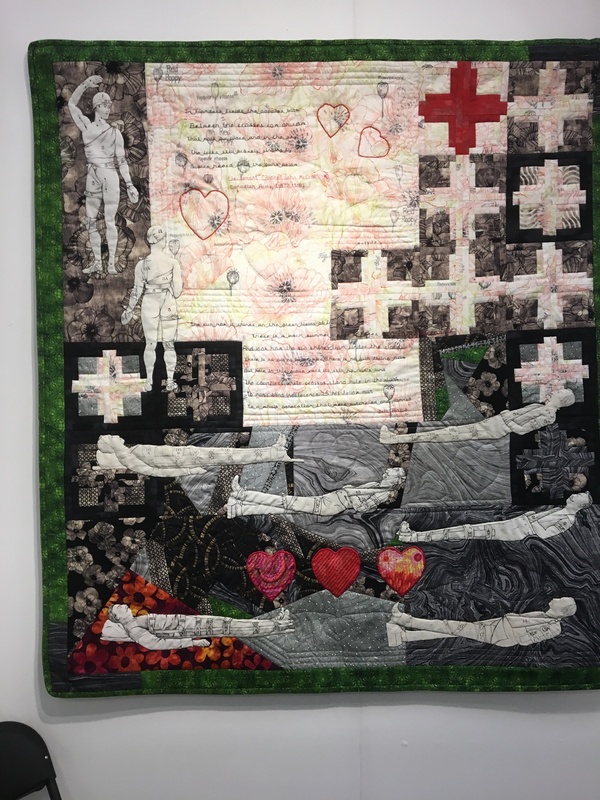 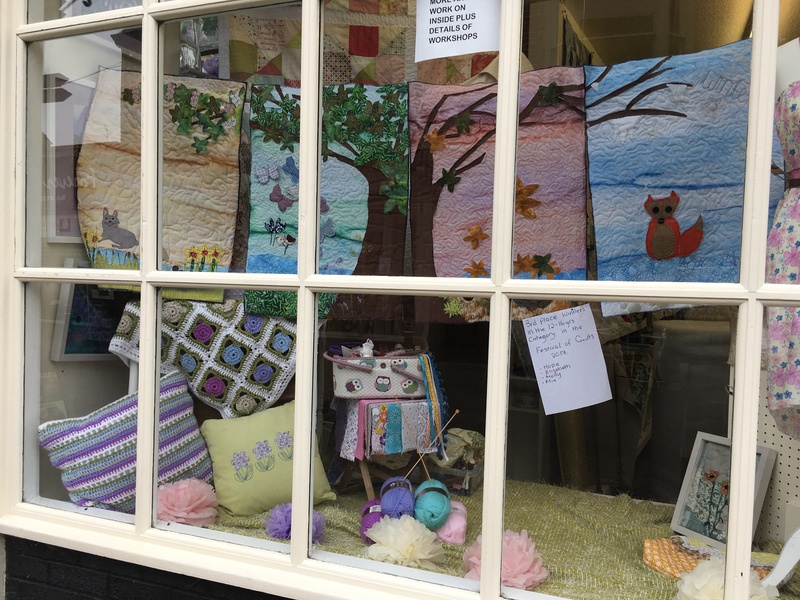 Both quilts are on display in the shop for another week….. 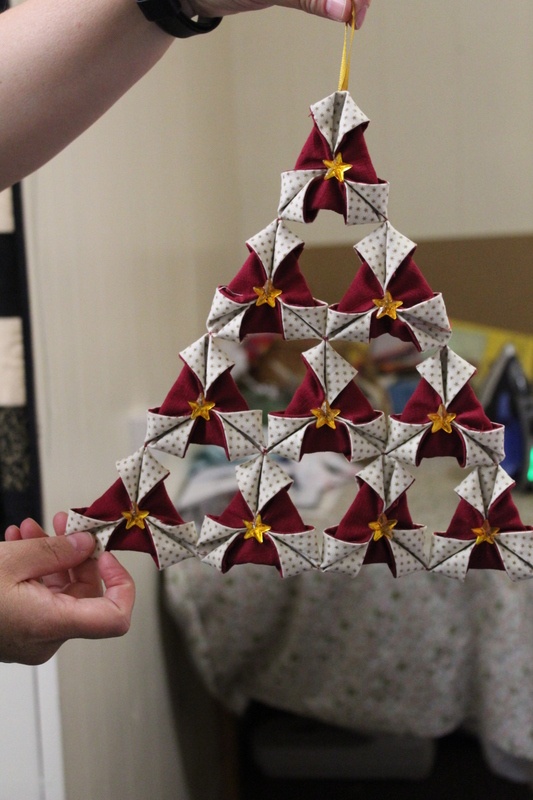 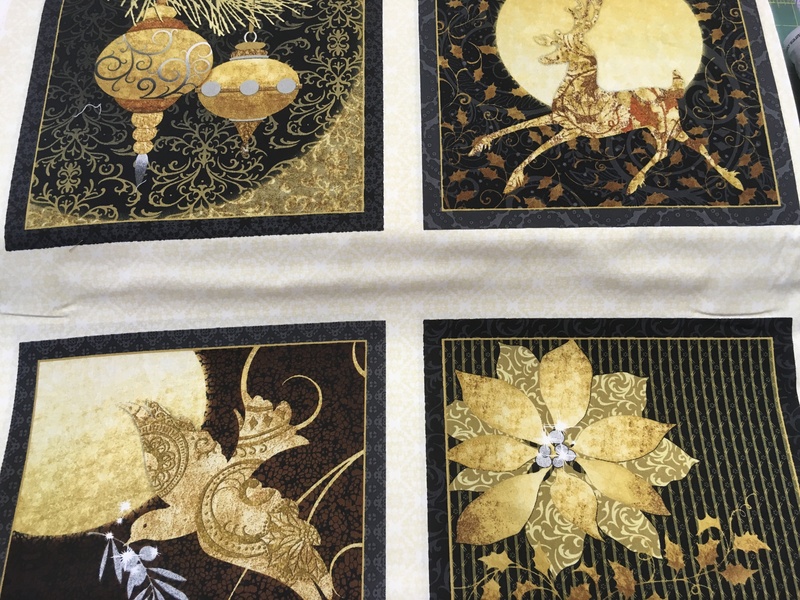 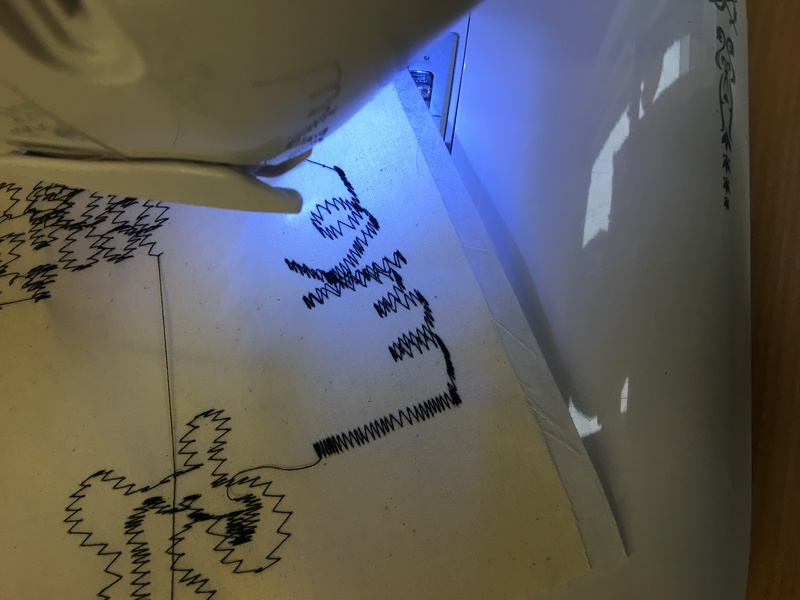 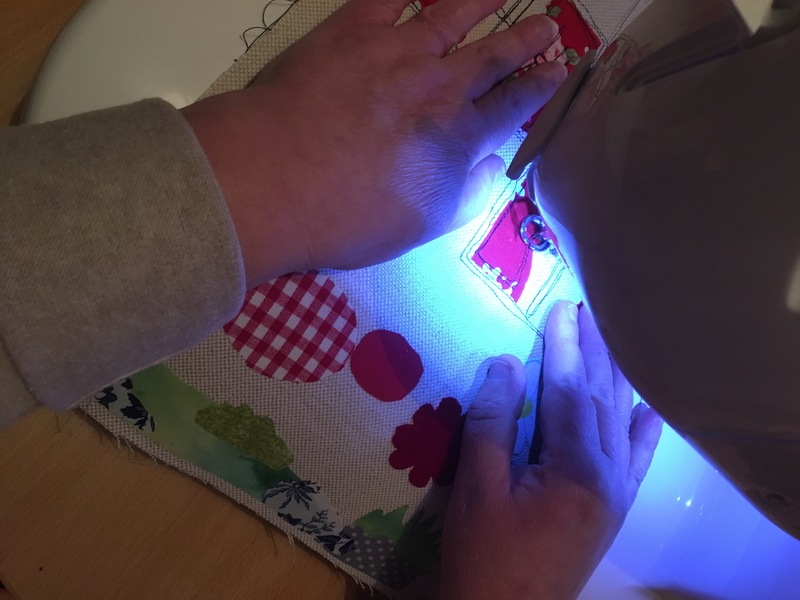 Carrying on with the Sewing Studio …. 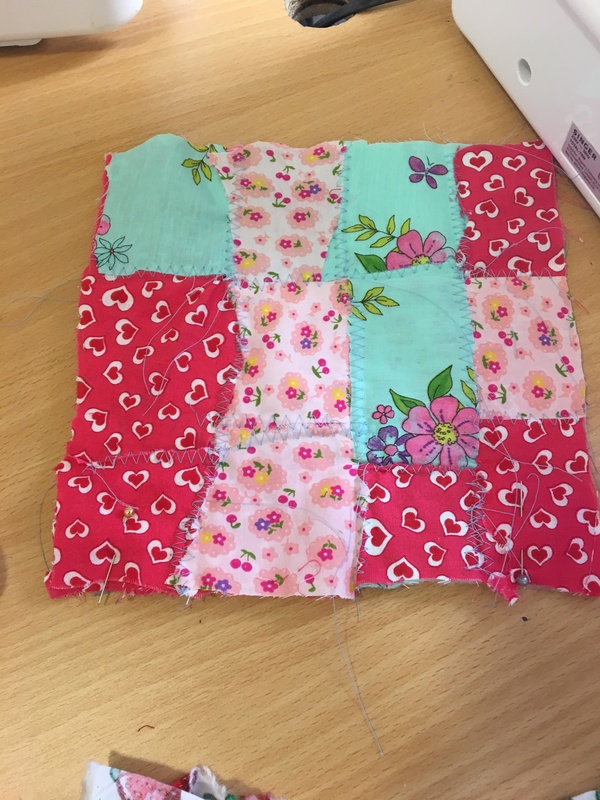 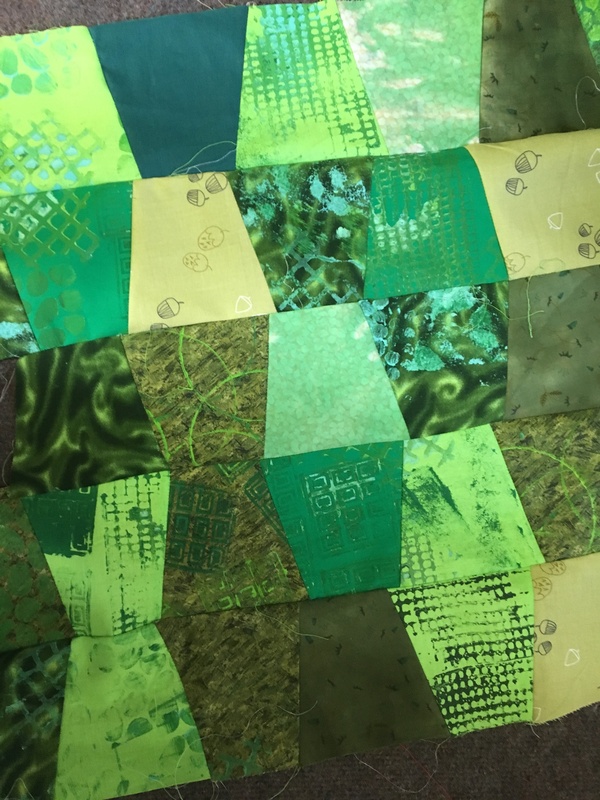 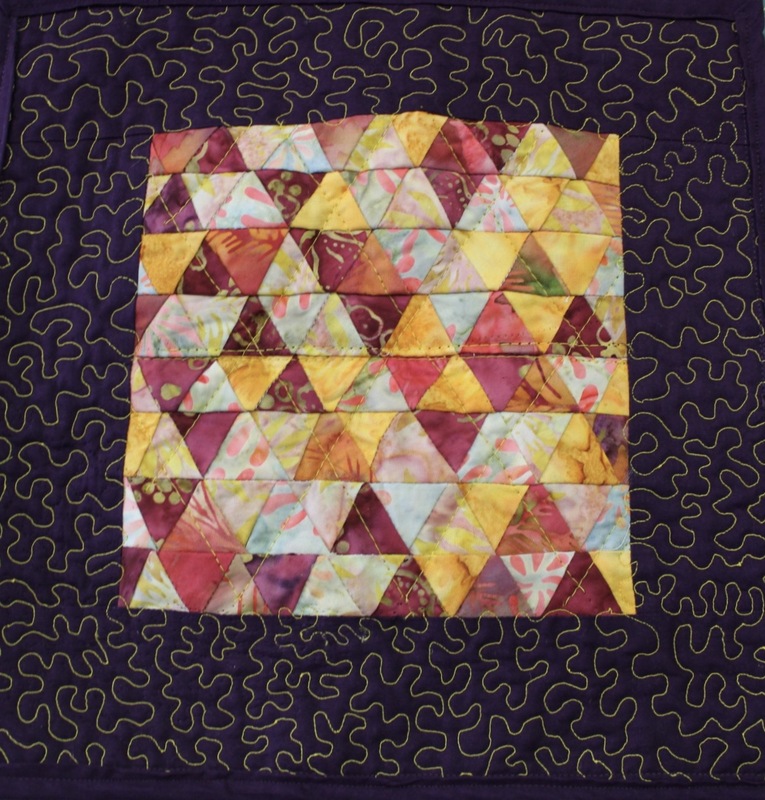 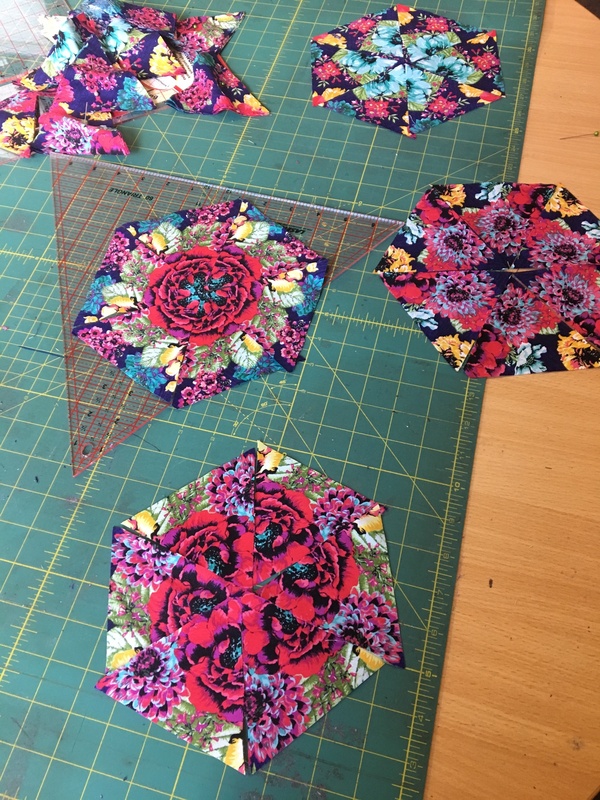 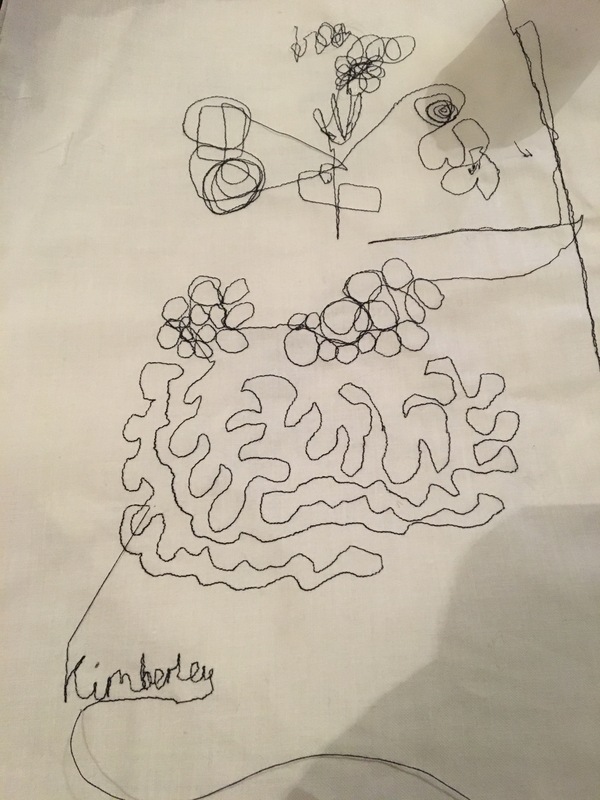 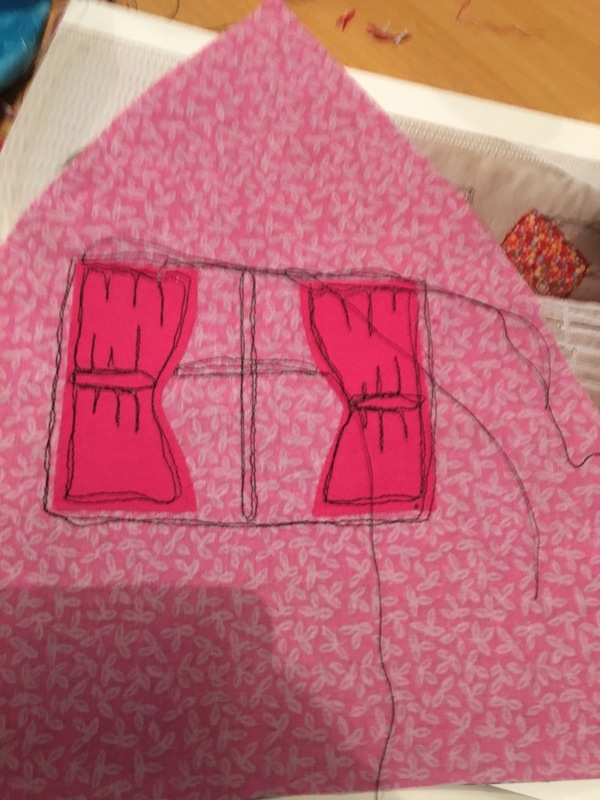 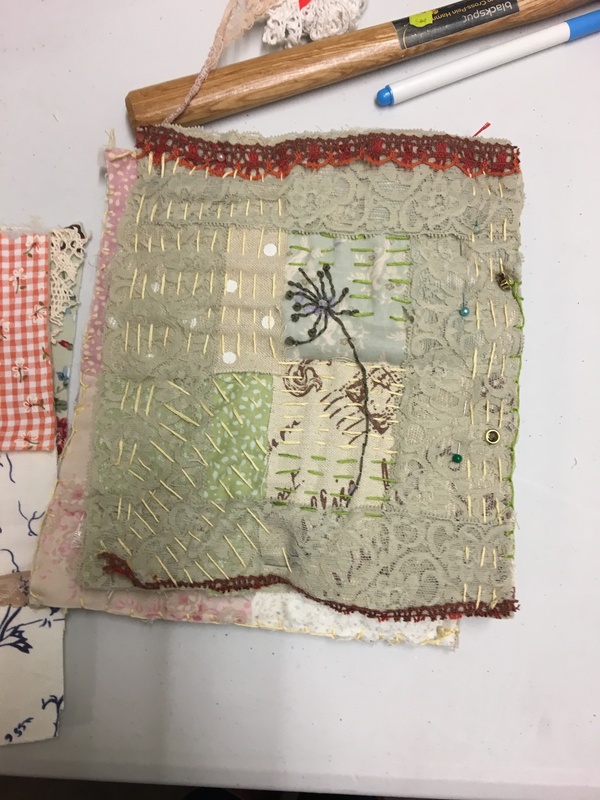 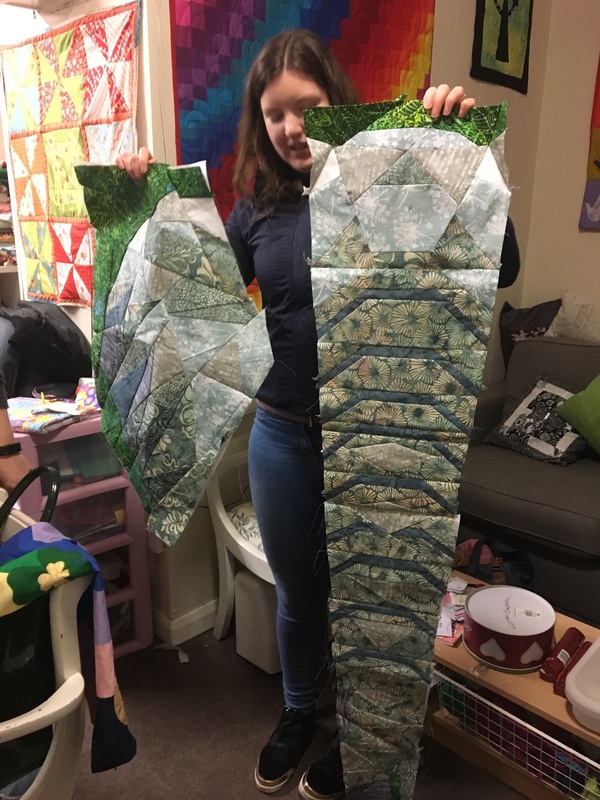 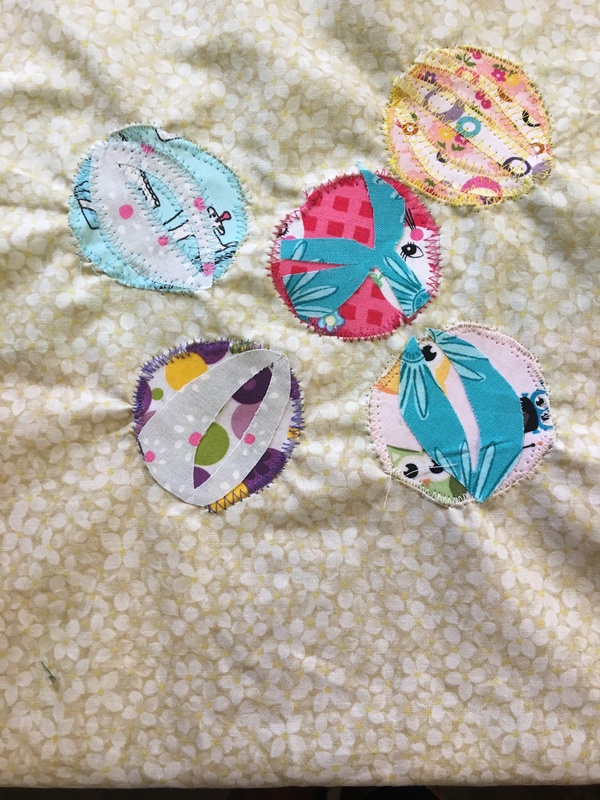 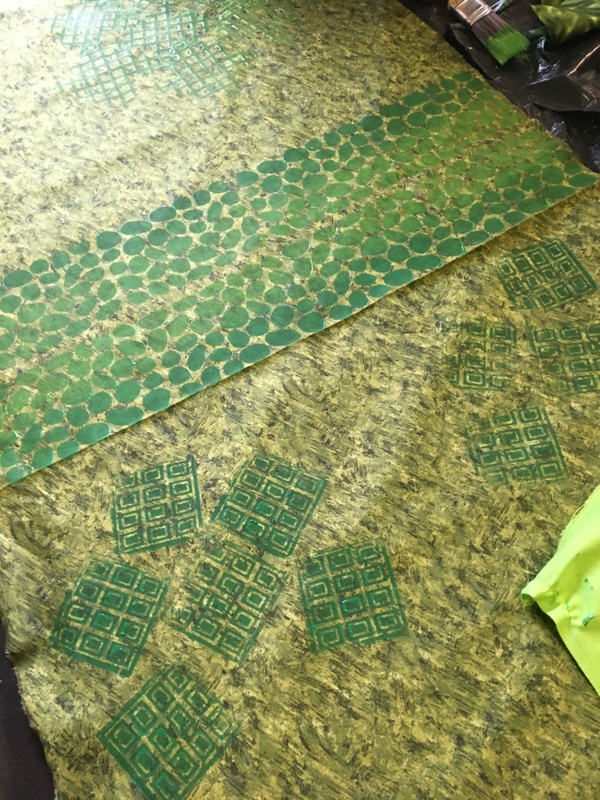 I’ve been joined by three of my stitchers over a week to make a patchwork and quilted lap quilt…..
We’ve quilted bags from two from my stitchers…..
I’ve had another two finishing off their bunting…. 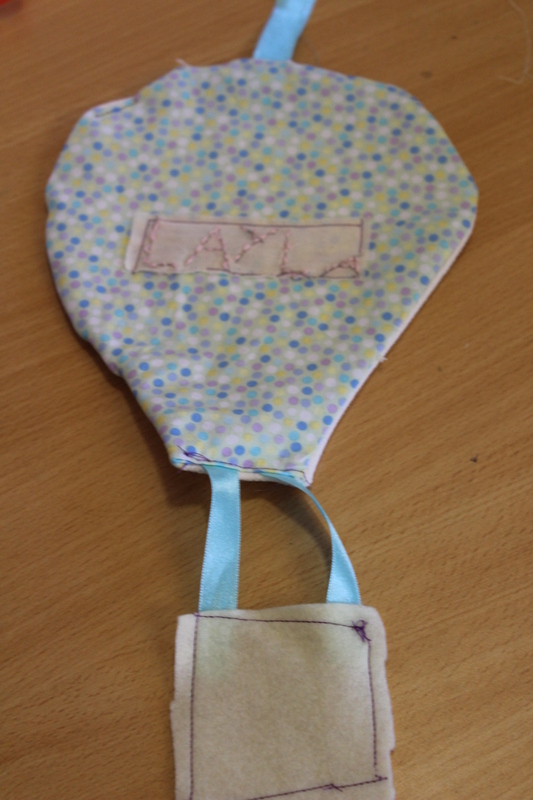 We’ve had four door hangers, hot air balloons ……. 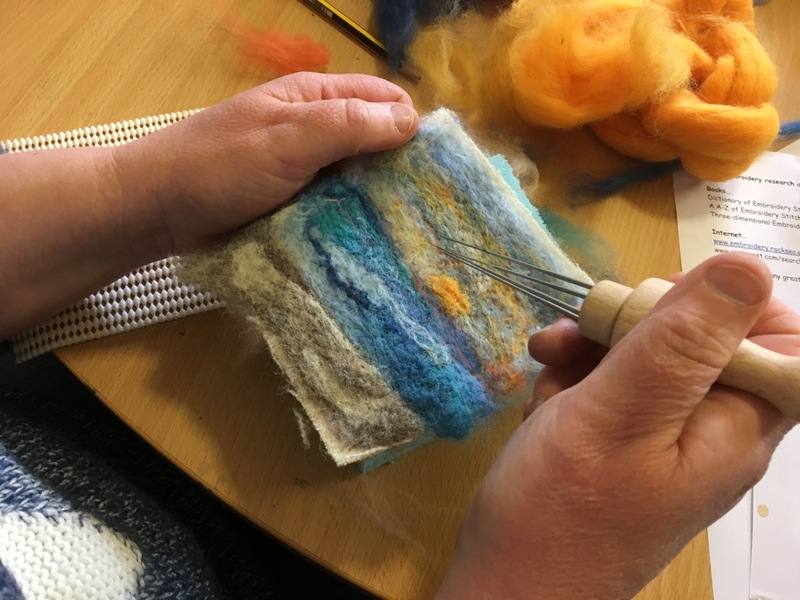 And we’ve started fabric weaving baskets that still are in working progress…. 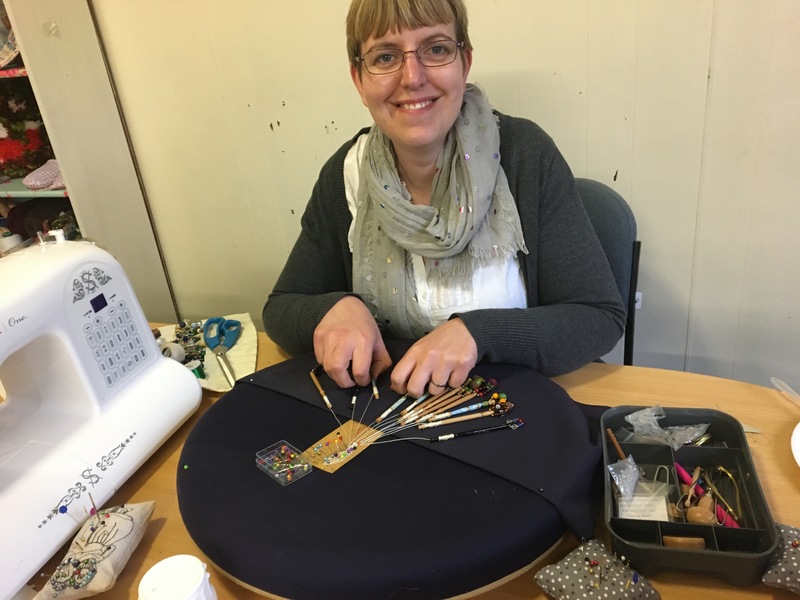 I’ve also got new dates and workshops available in thread painting miniatures…. 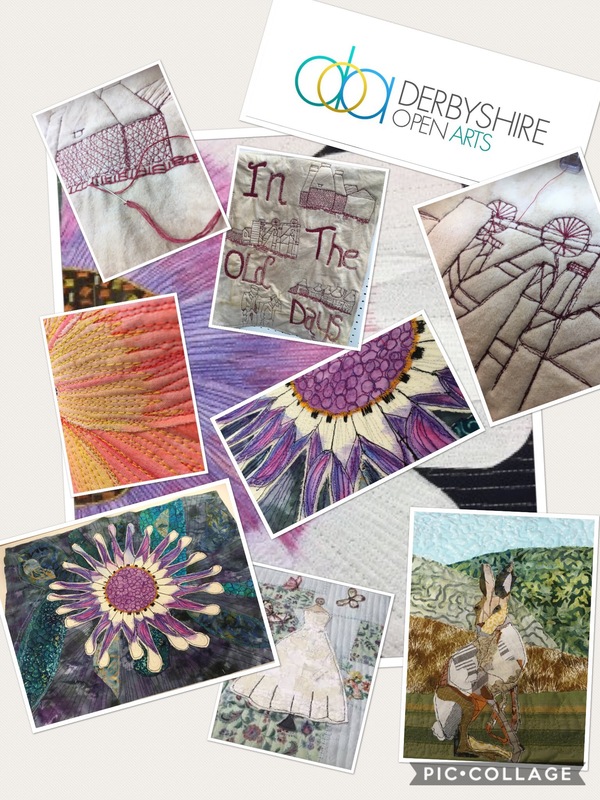 Its been a creative time for me too as the Lie of Land exhibition in Bishops Castle has now started. 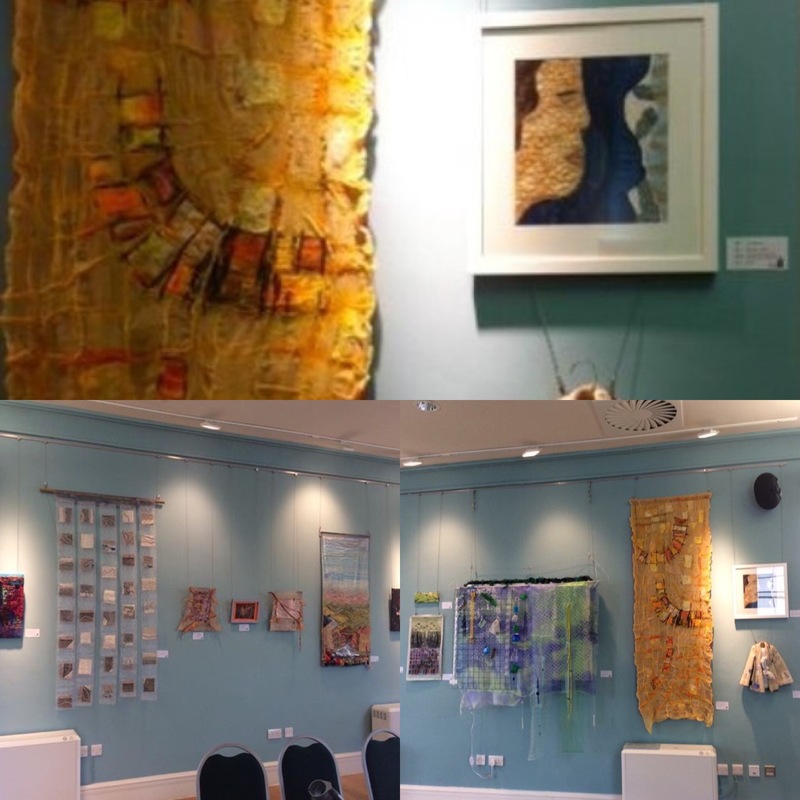 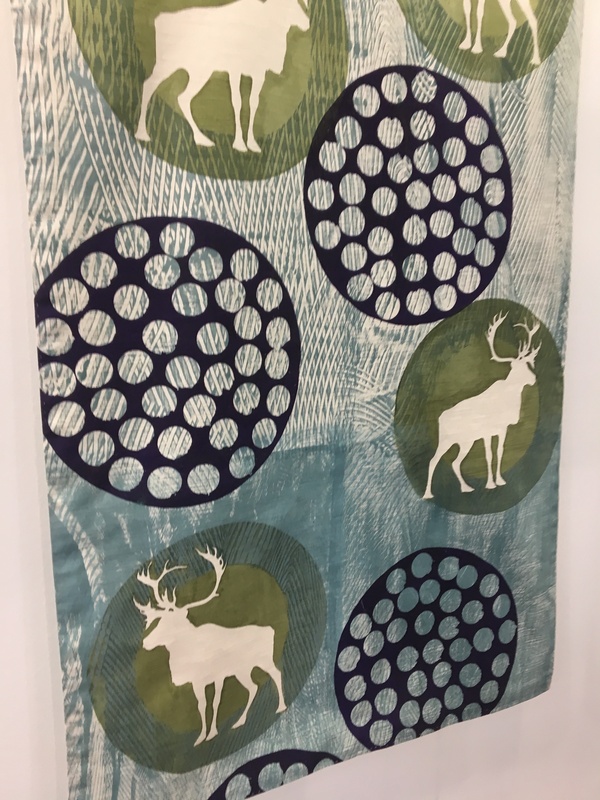 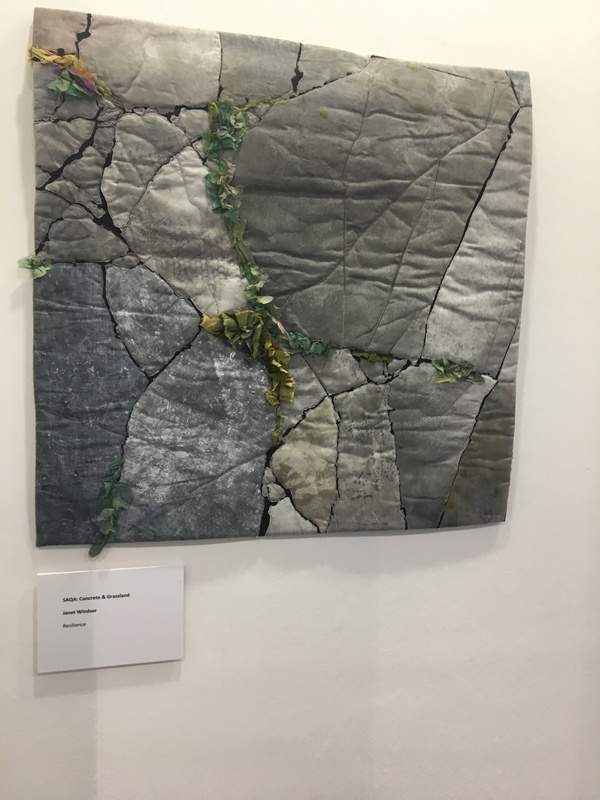 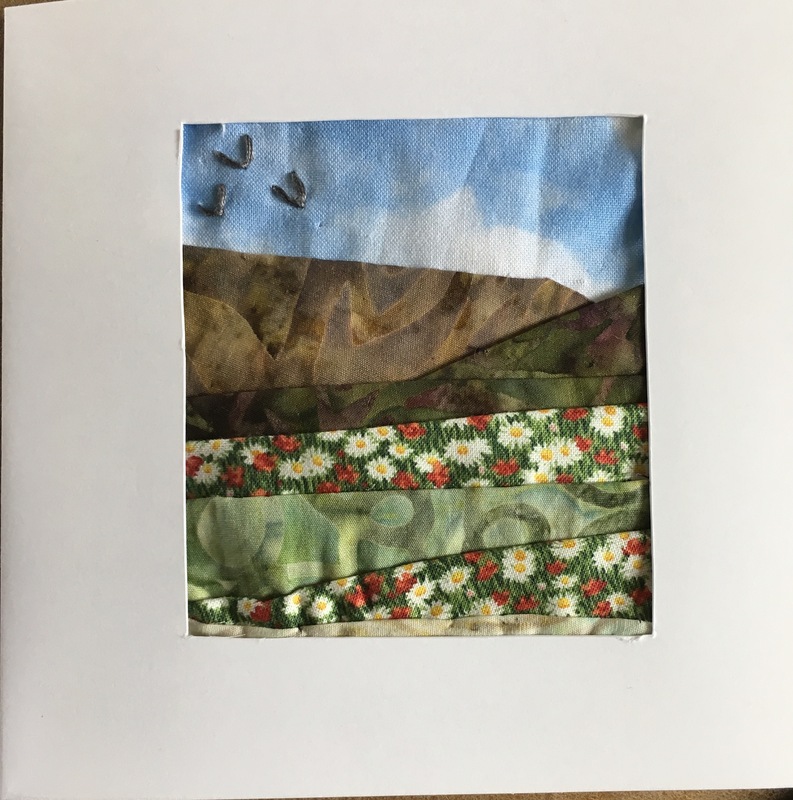 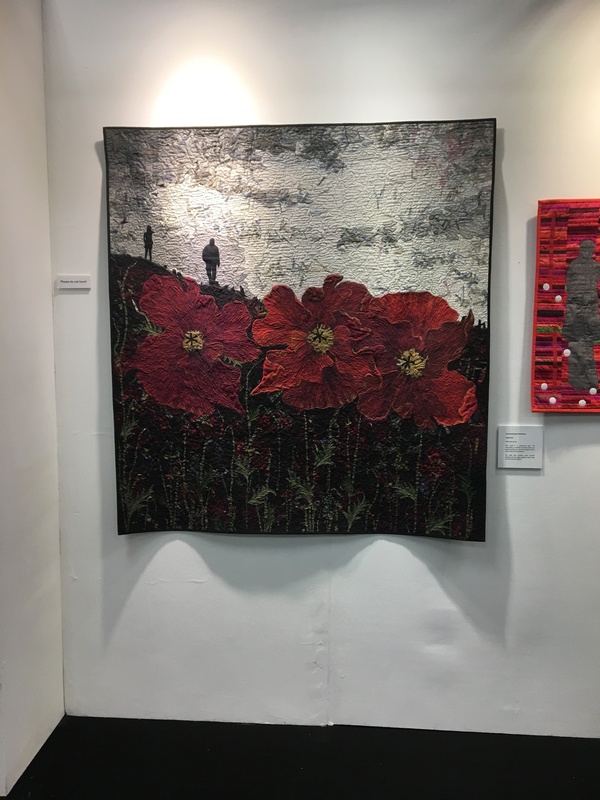 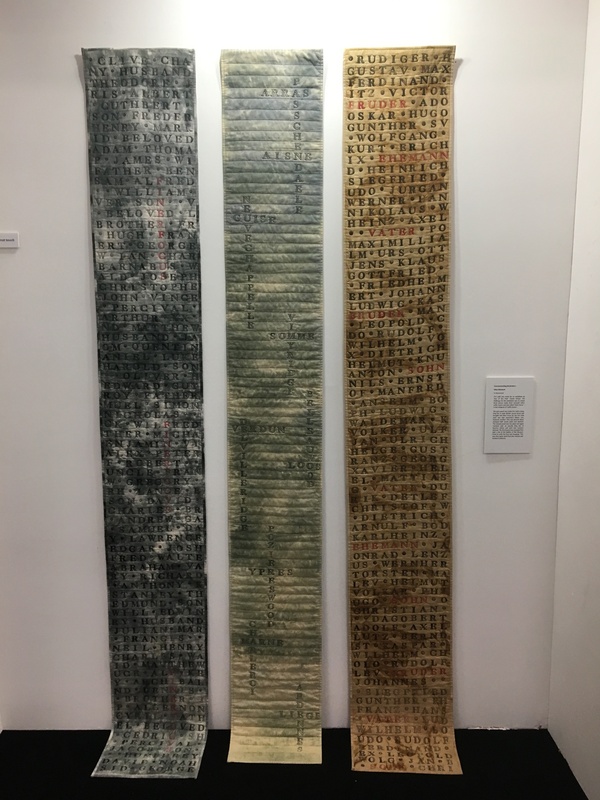 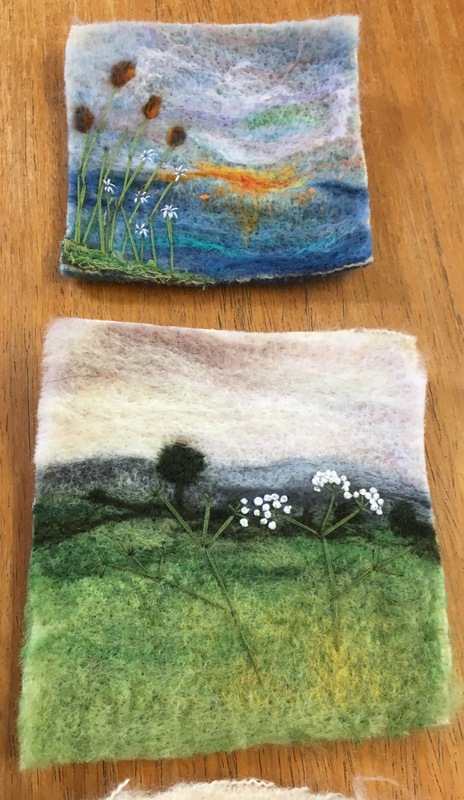 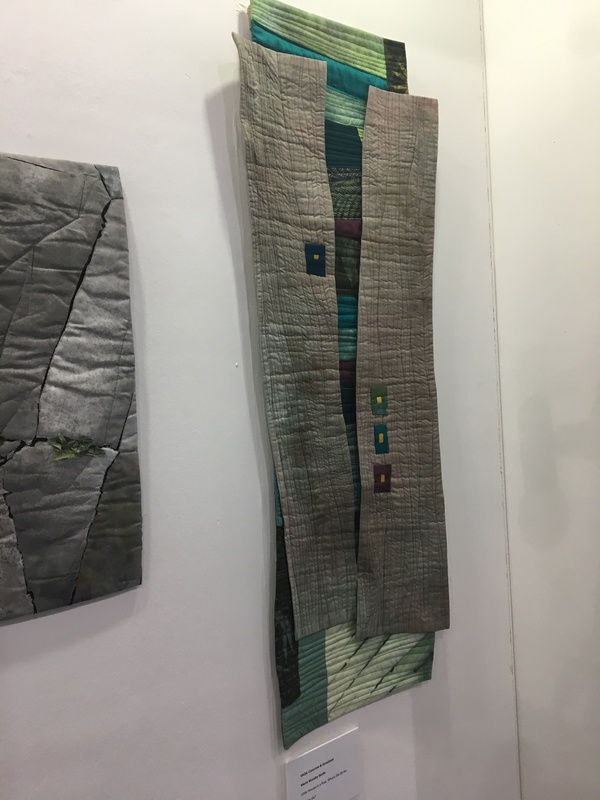 I’m exhibiting with Midlands Textile Forum and my piece is called Mother Earth…..
and after the Festival I set myself a little challenge……. 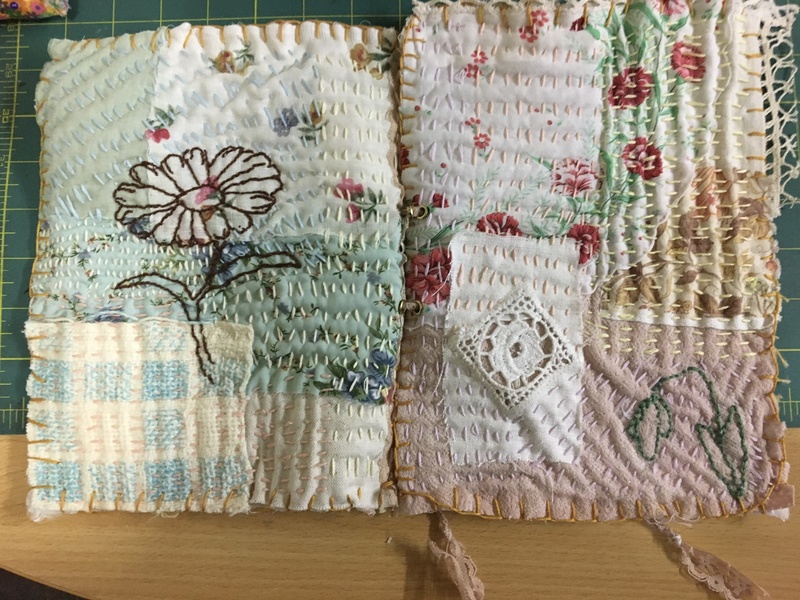 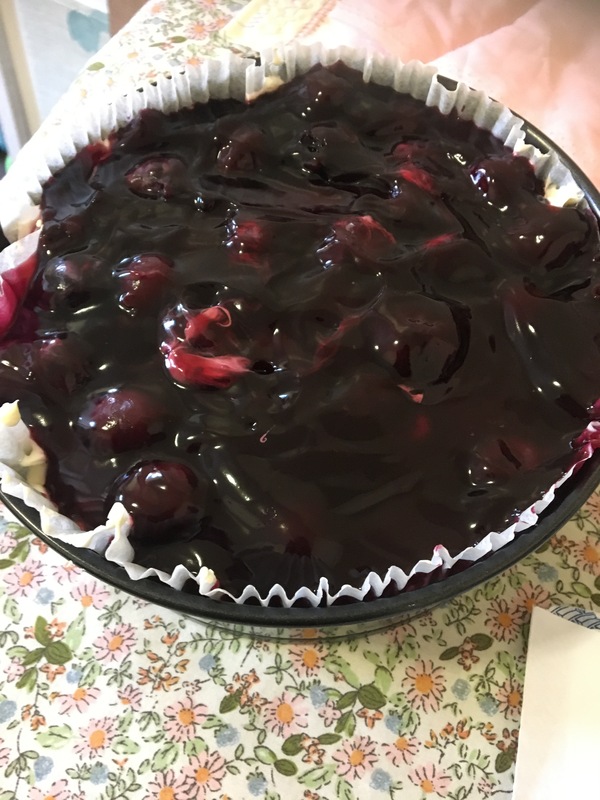 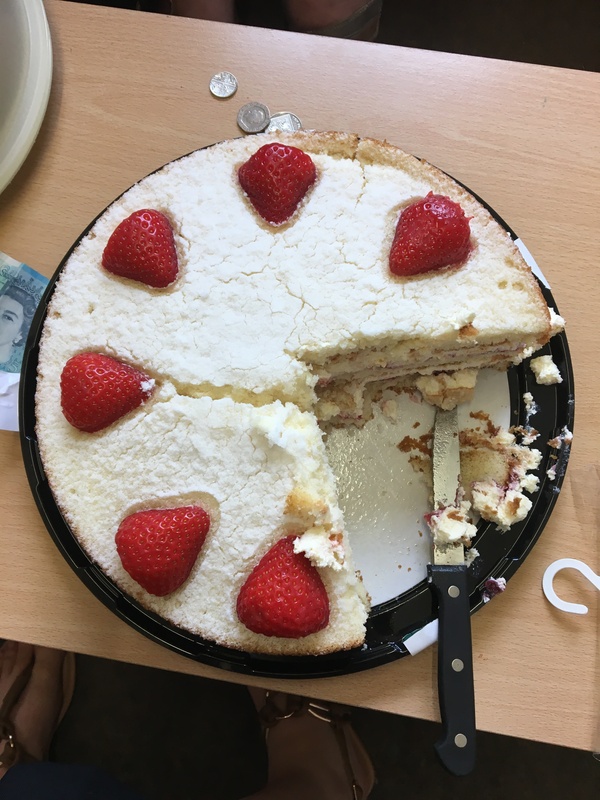 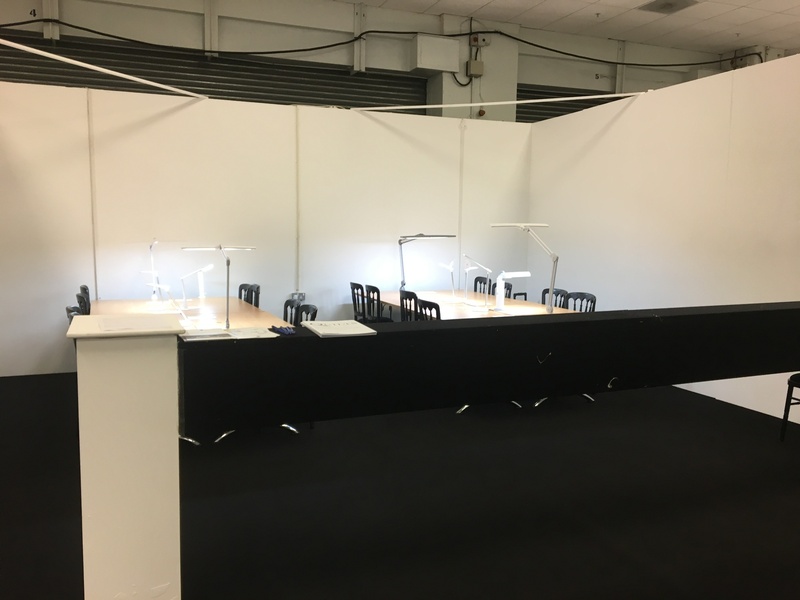 a very little challenge ……. 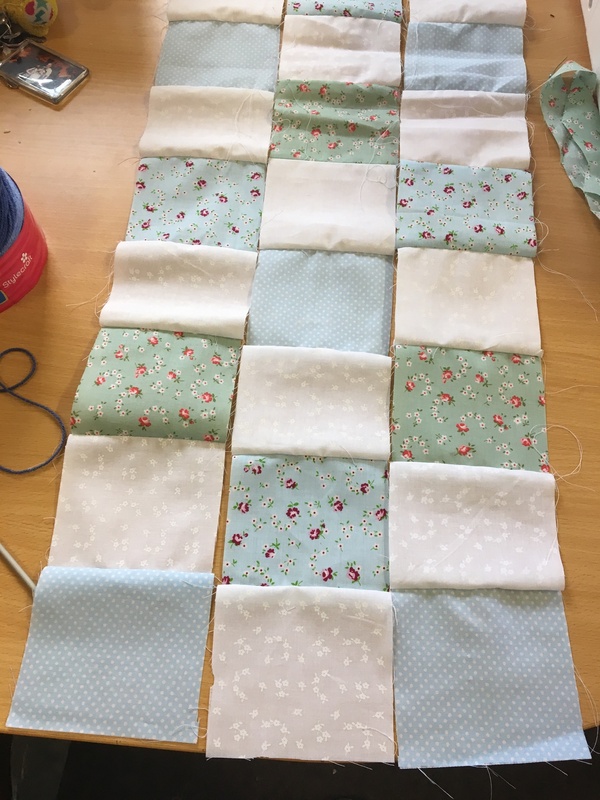 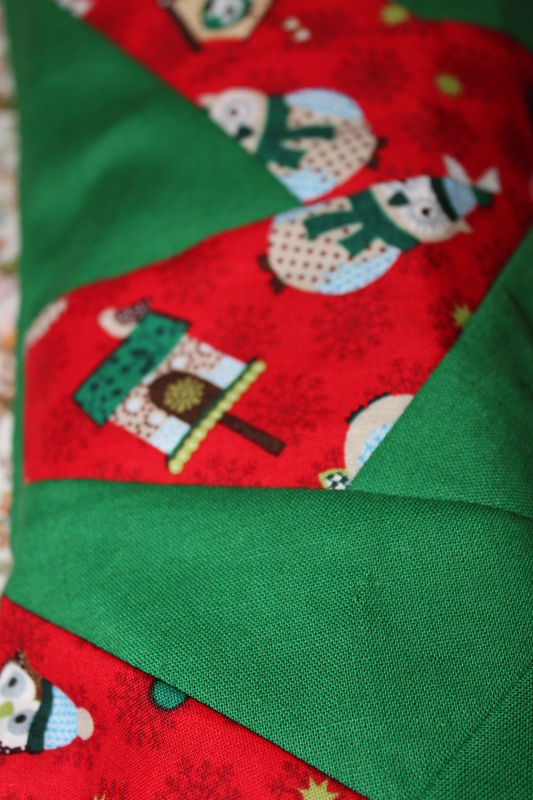 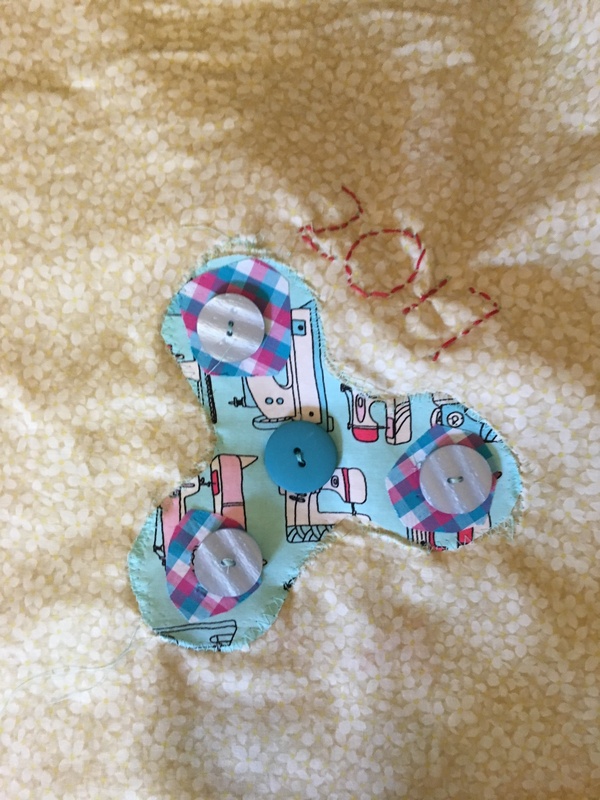 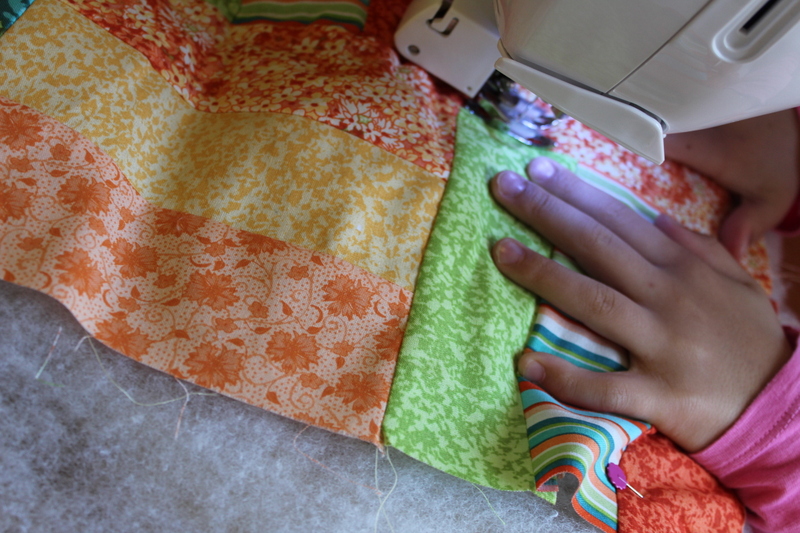 my first mini quilt …..
With all of this I hope you realise how much I love my Sewing Studio. 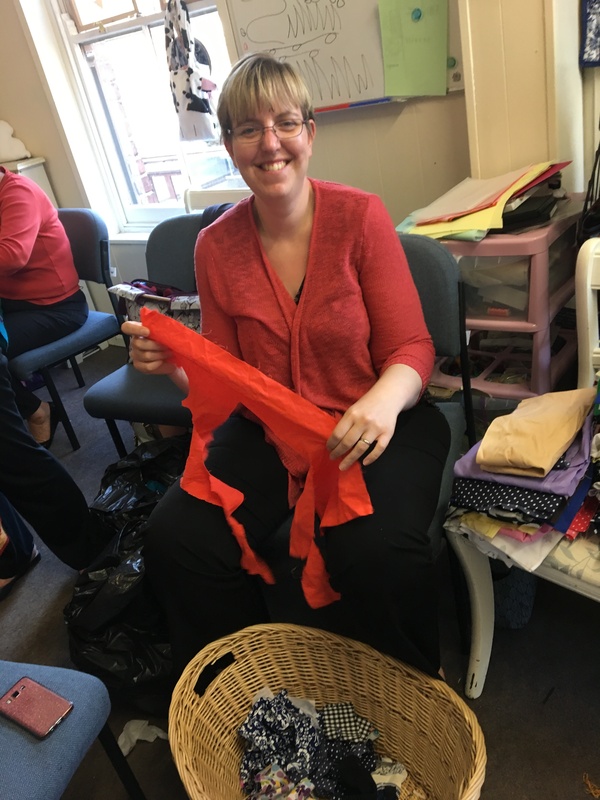 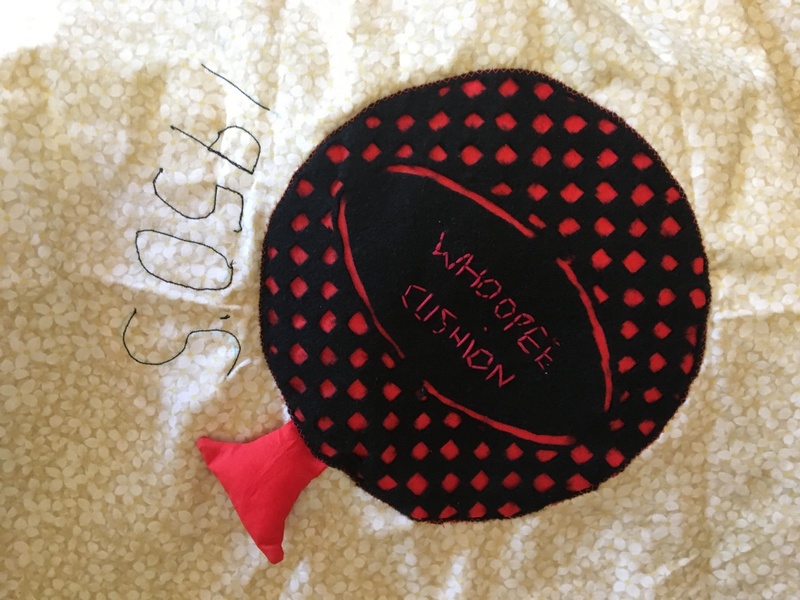 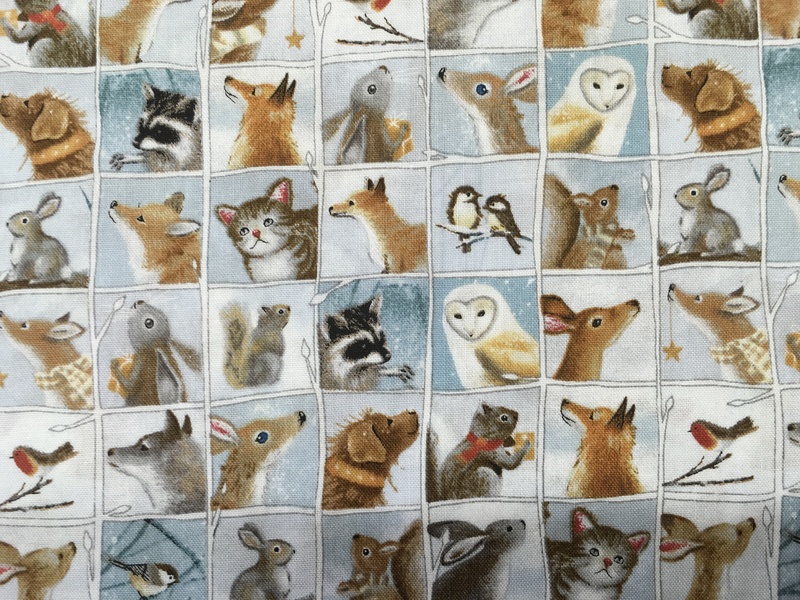 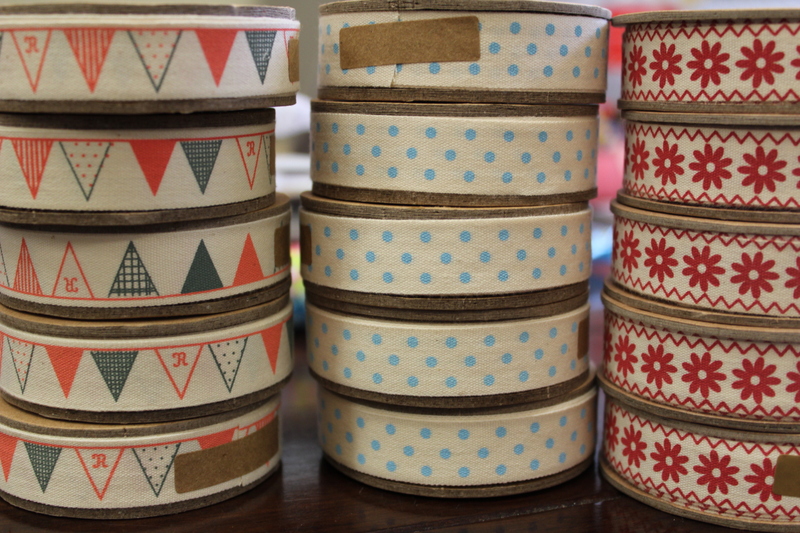 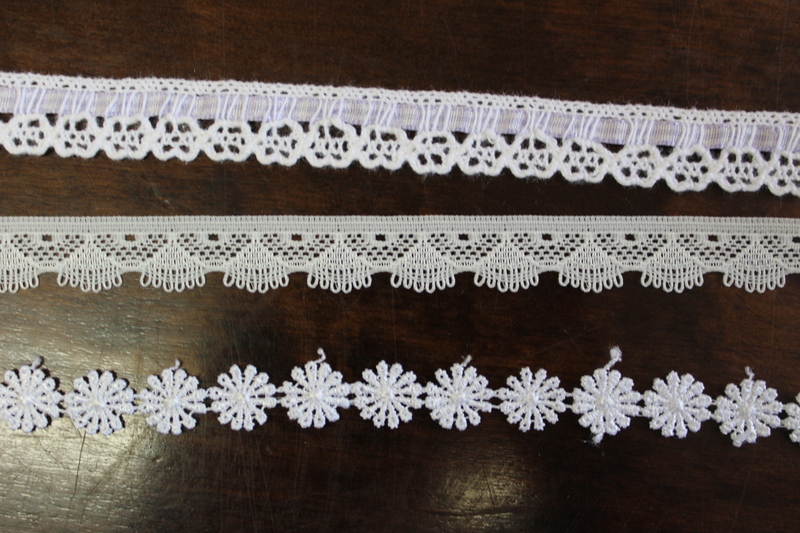 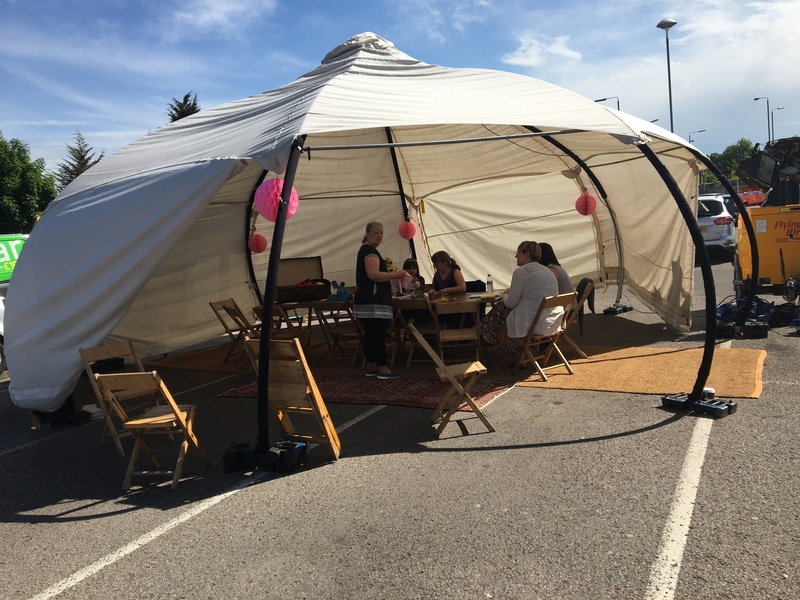 This blog post is a mixture of new stock, events and the Sewing Bee, so let’s get started. 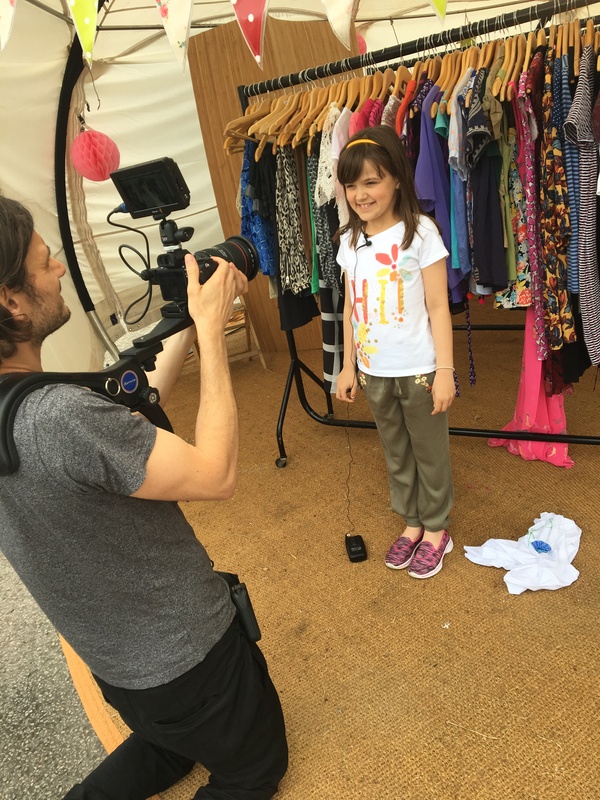 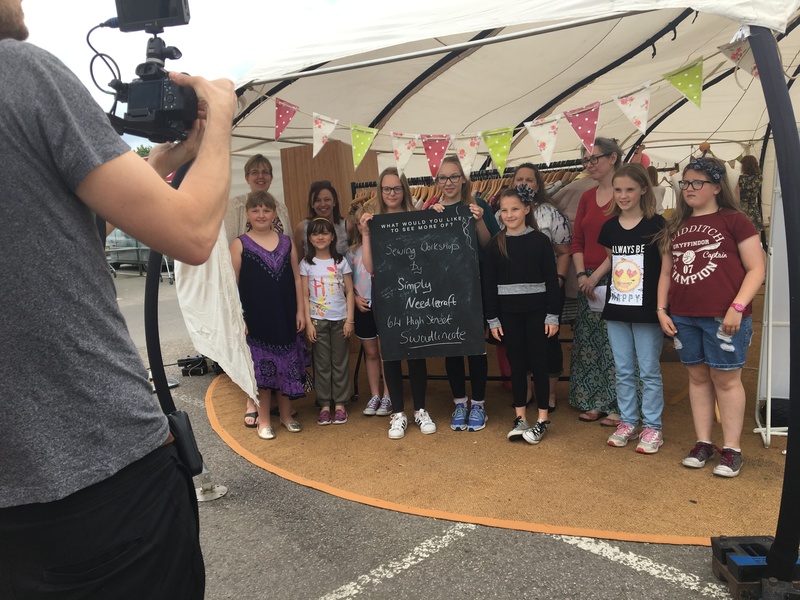 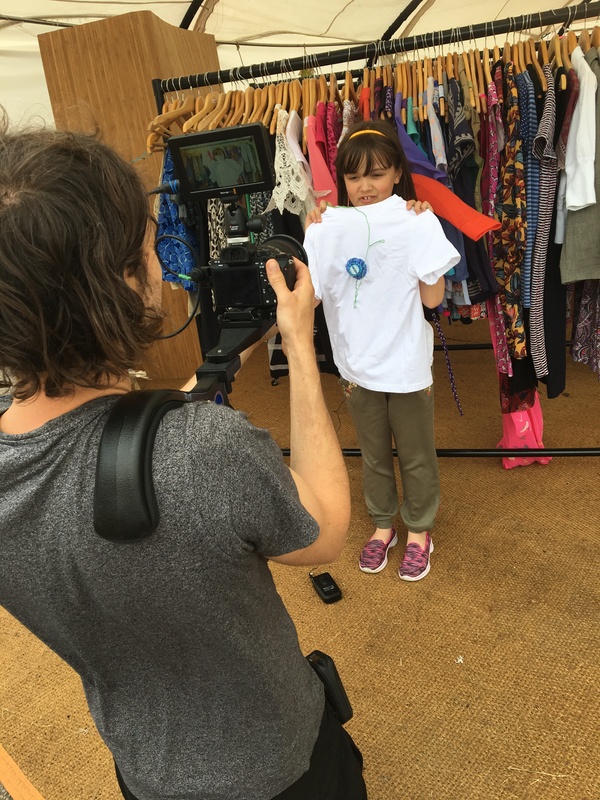 Ok so you may remember we were at Sainsbury’s recently as a part of their Street Store event. 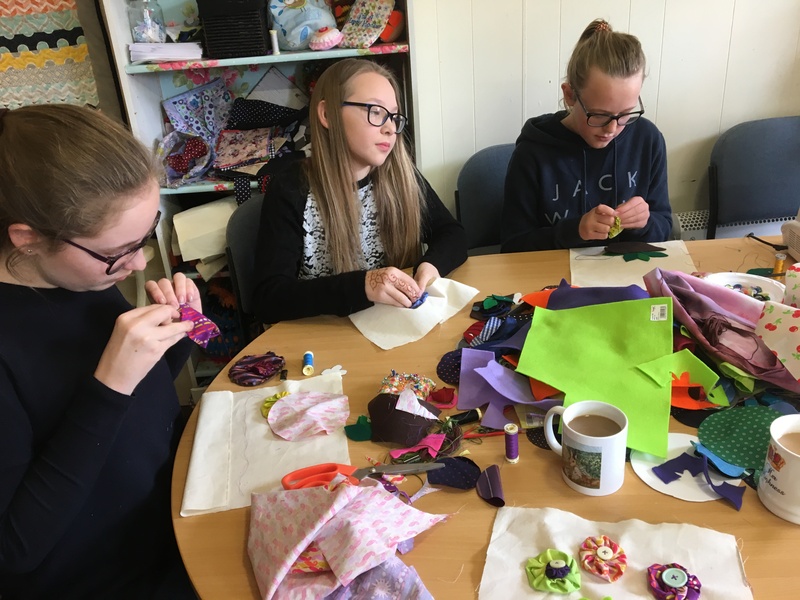 Braced with needles, threads and plenty of Suffolk puffs me and my loyal team headed to Sainsbury’s to get young people into sewing and embellishing clothes. 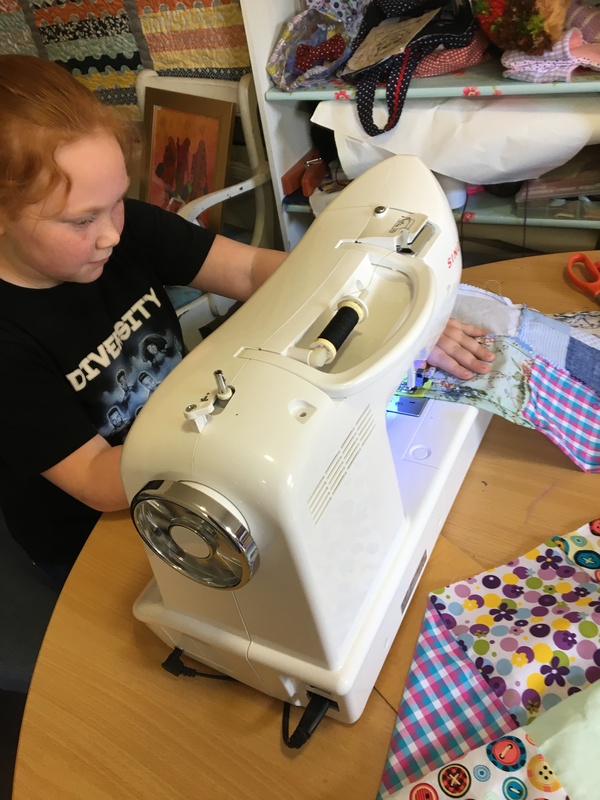 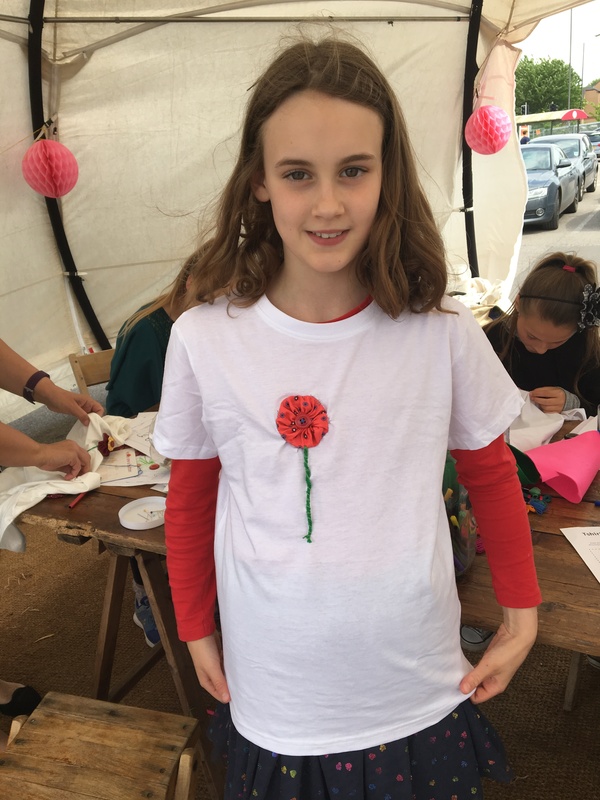 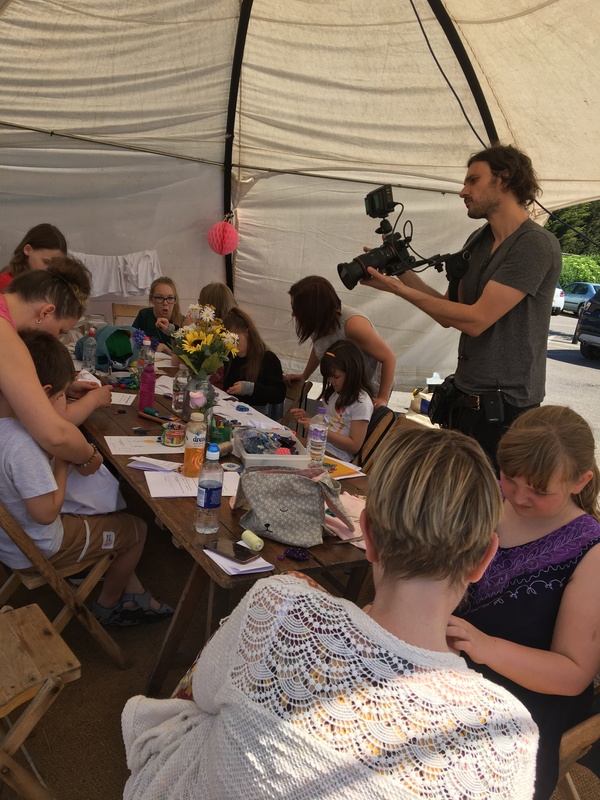 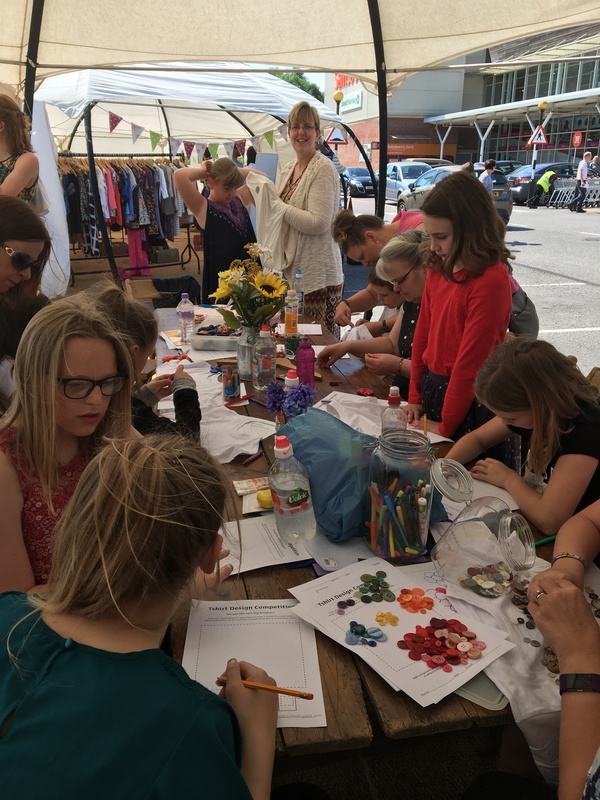 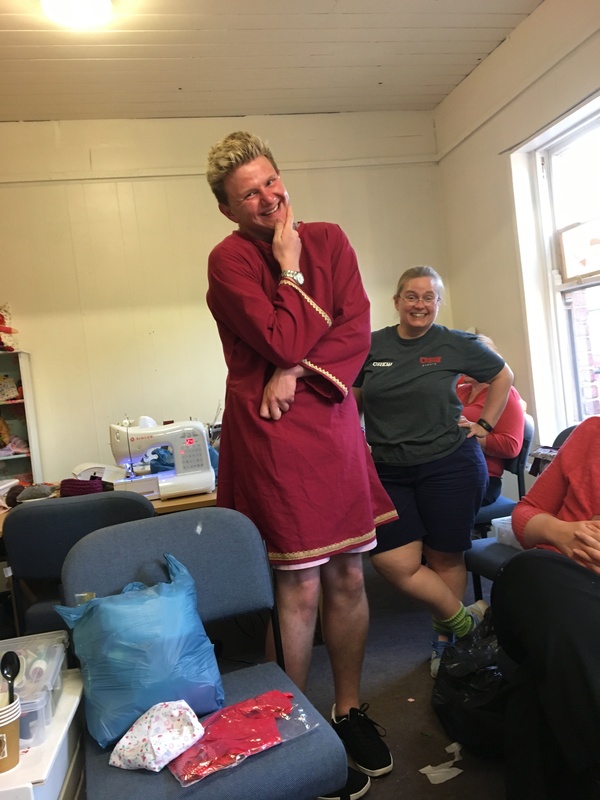 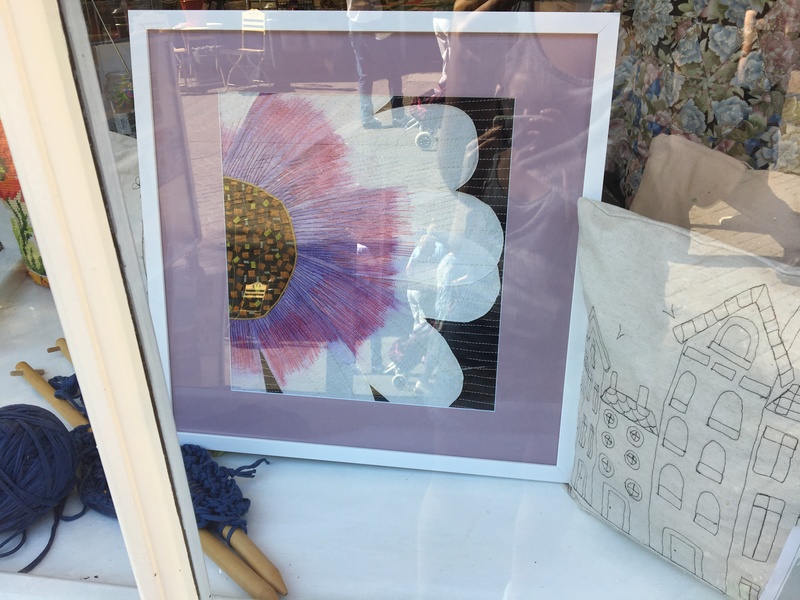 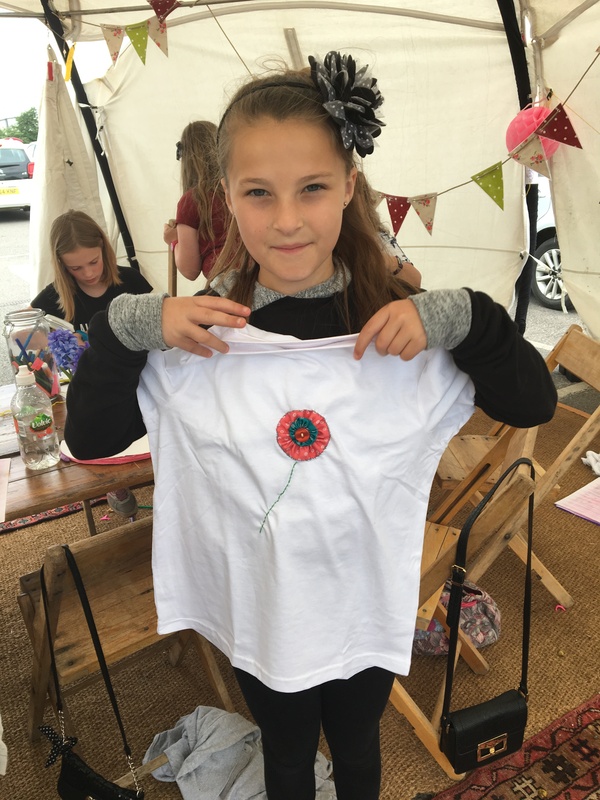 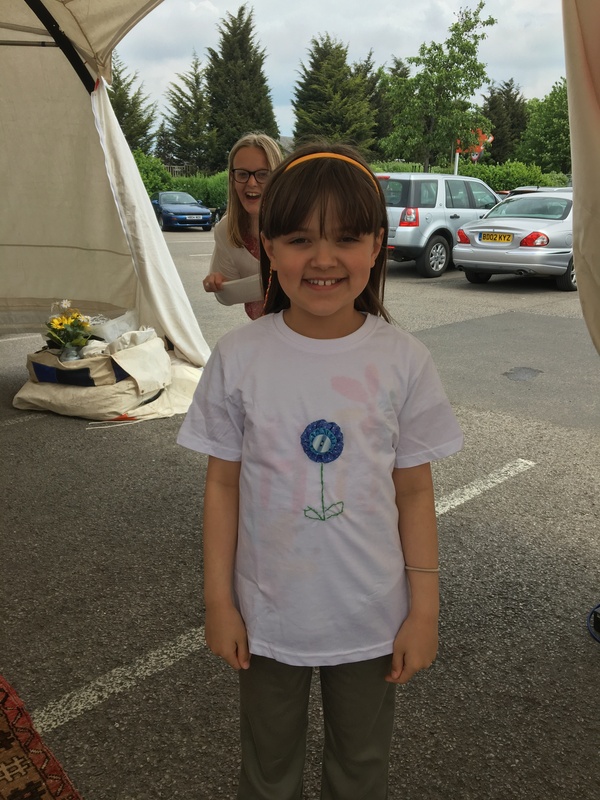 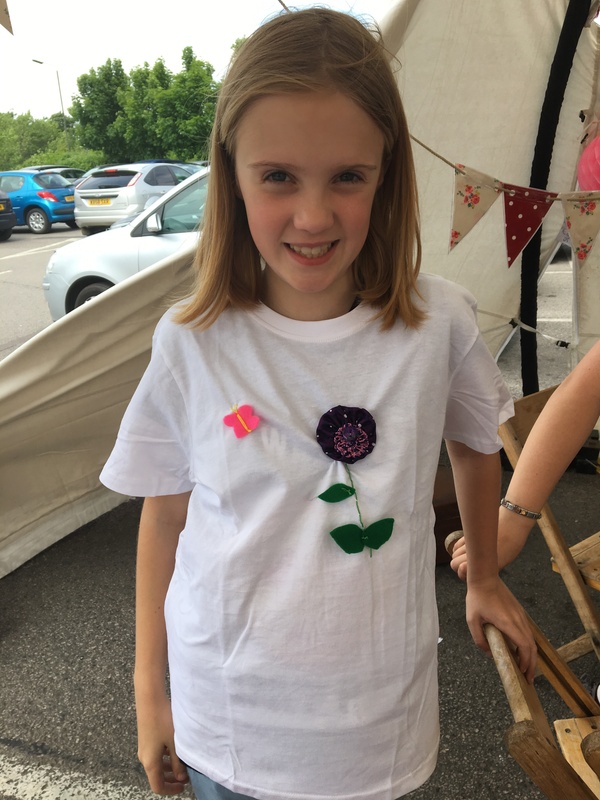 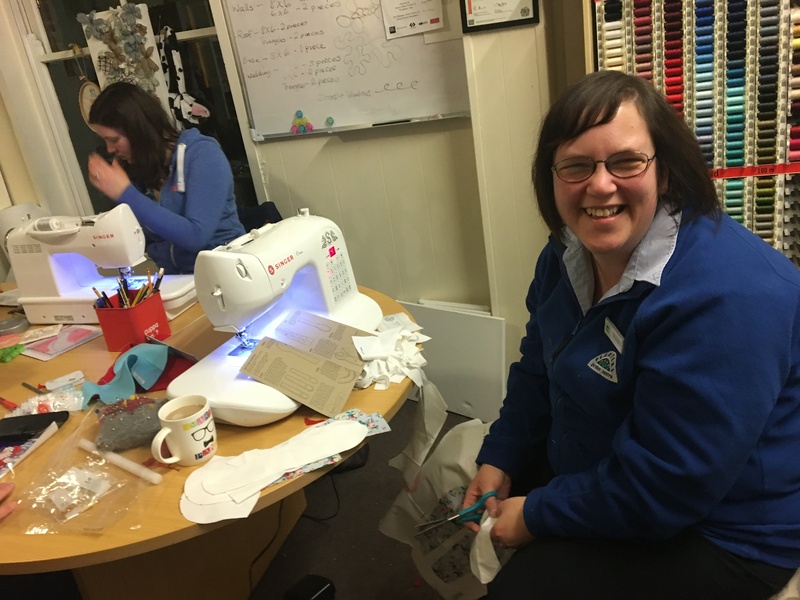 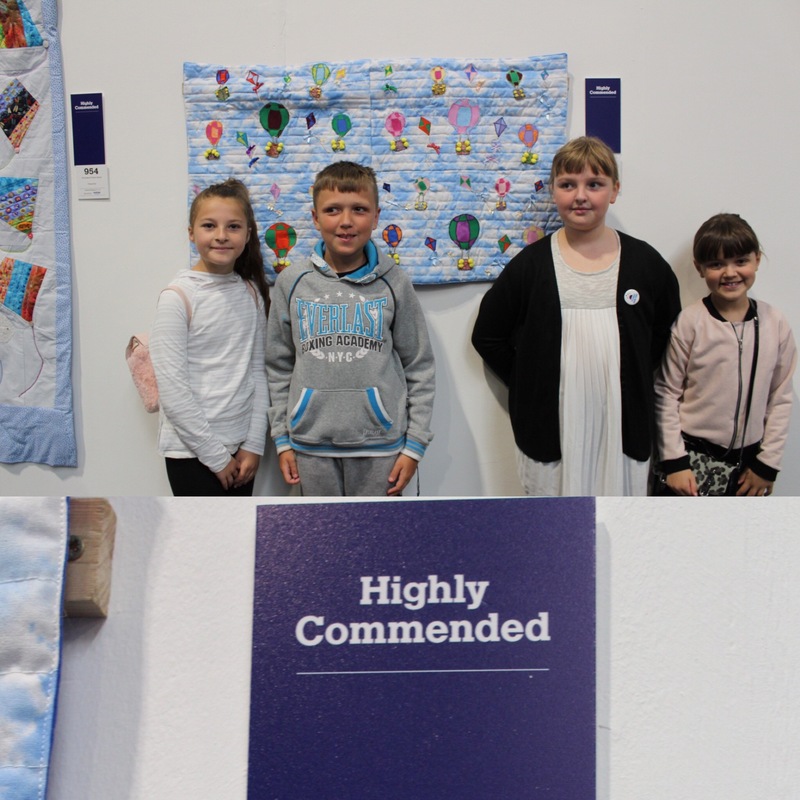 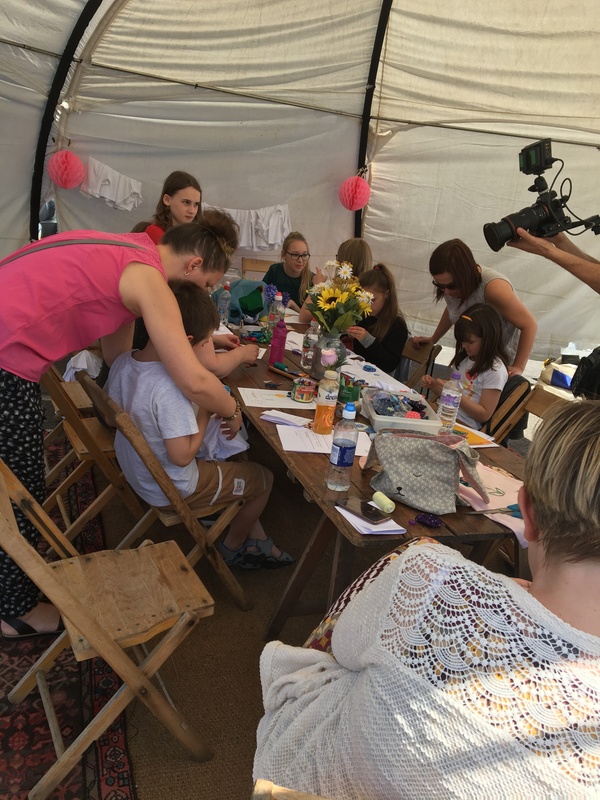 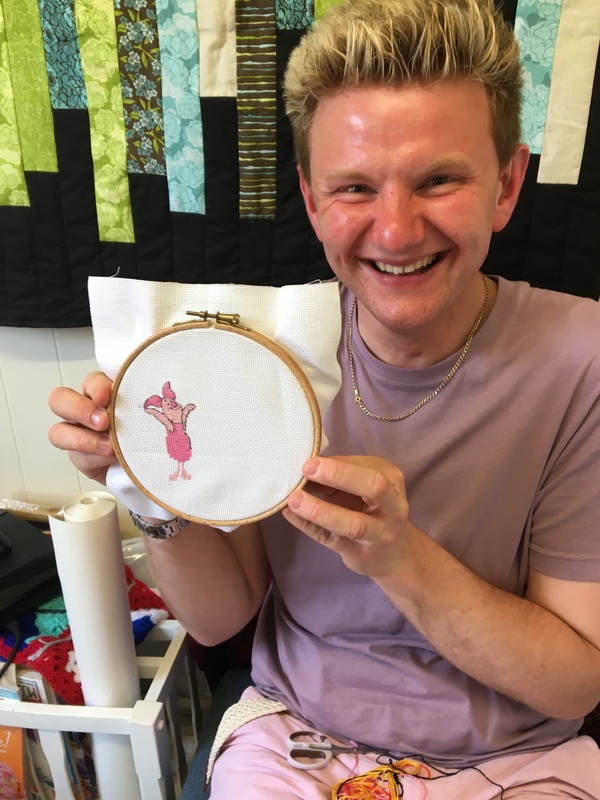 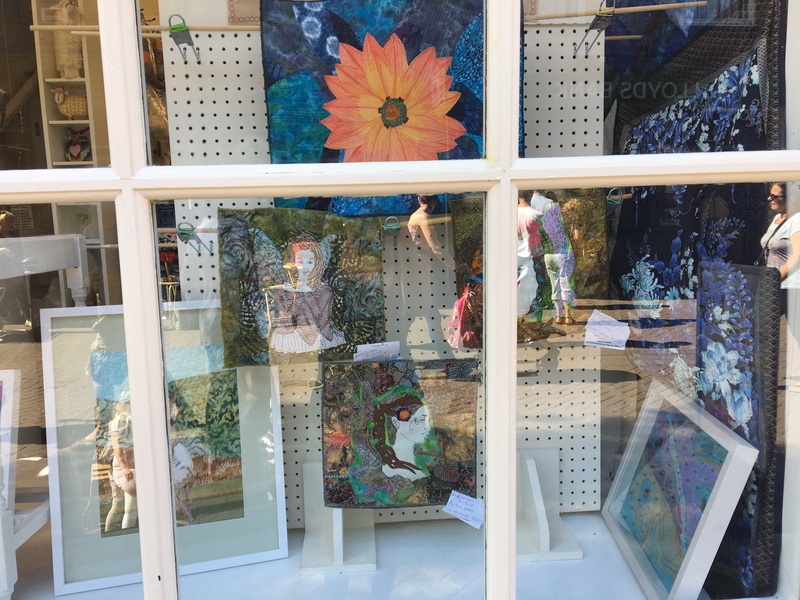 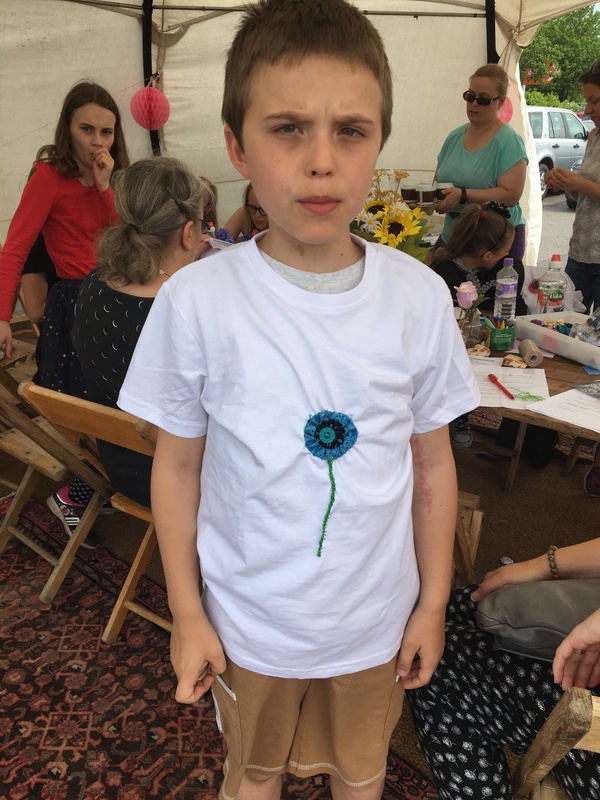 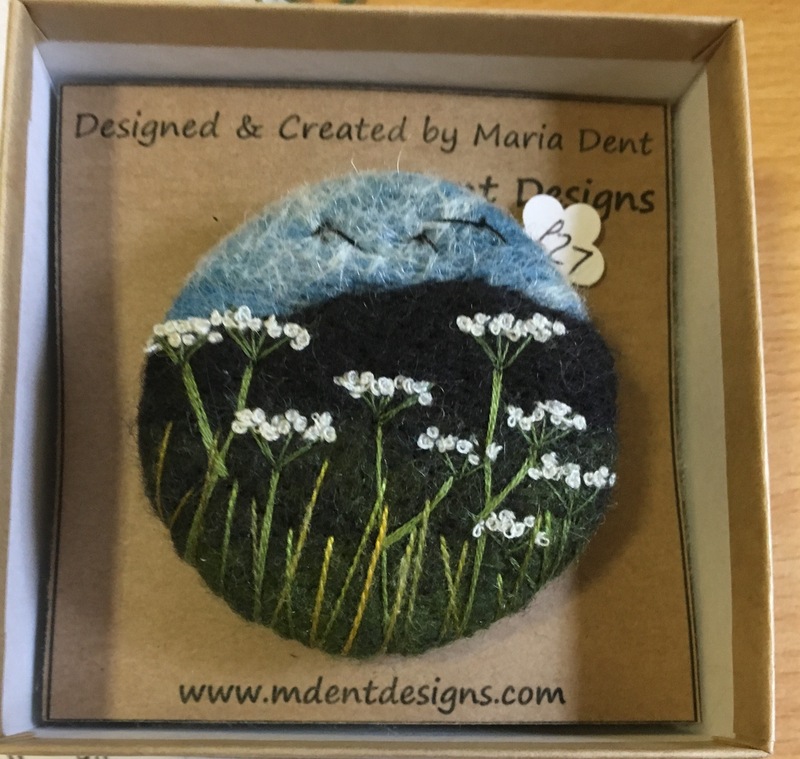 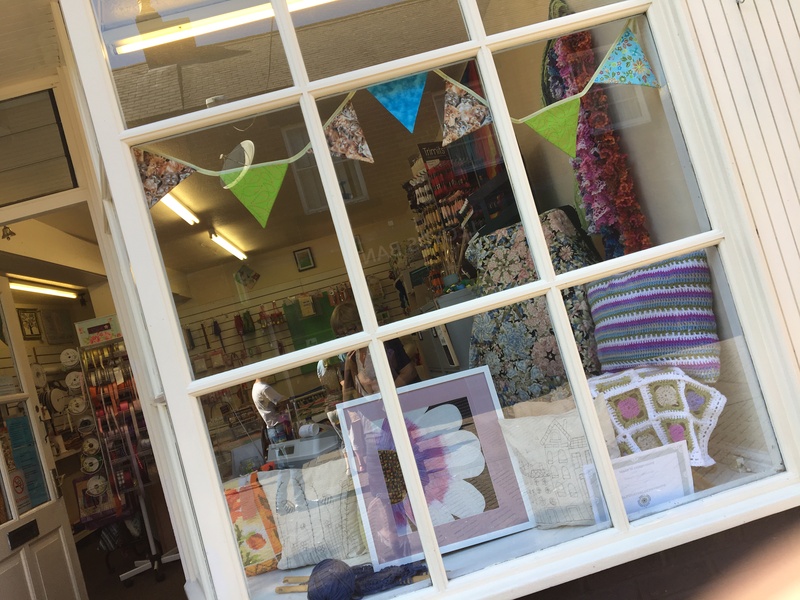 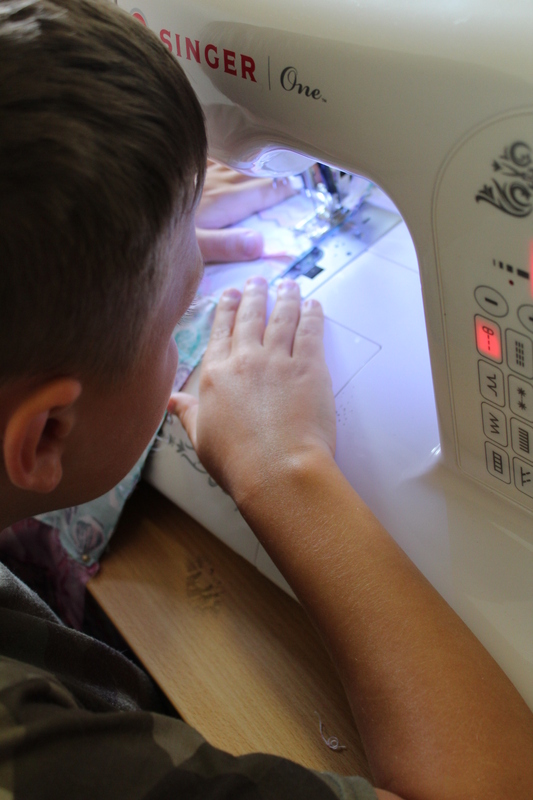 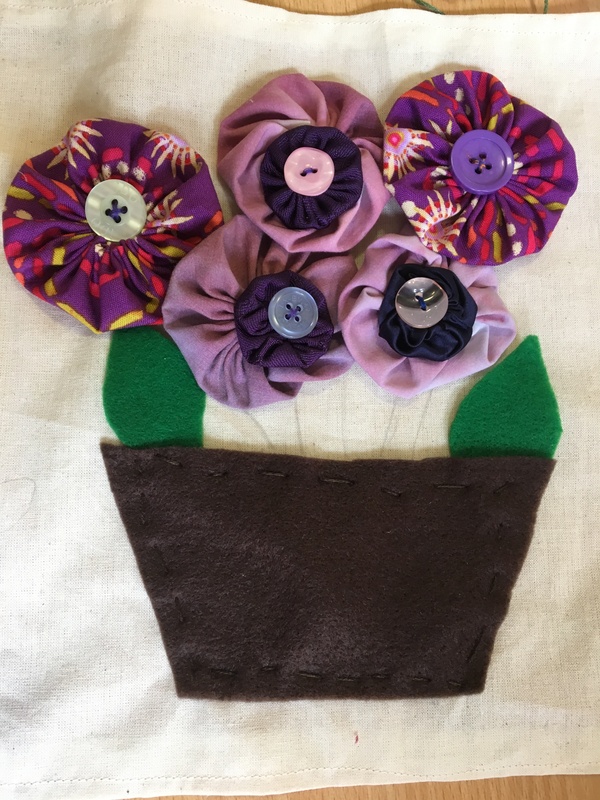 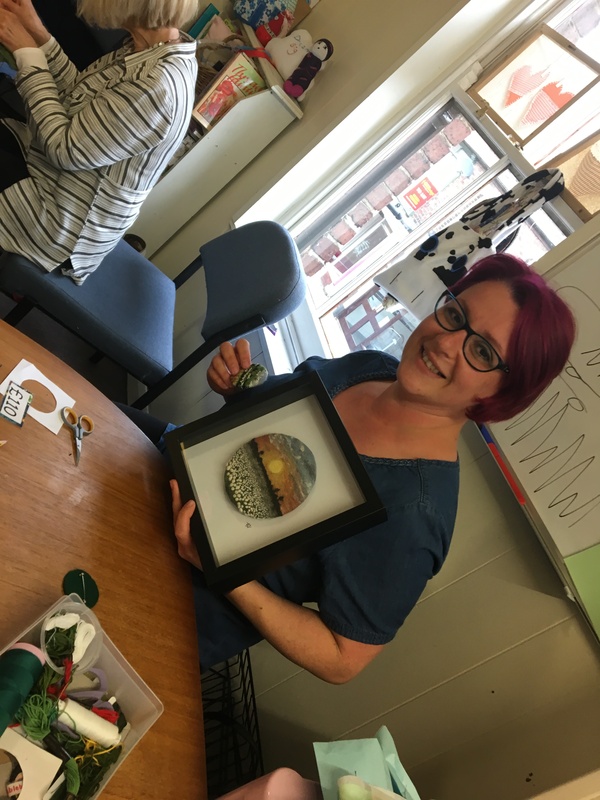 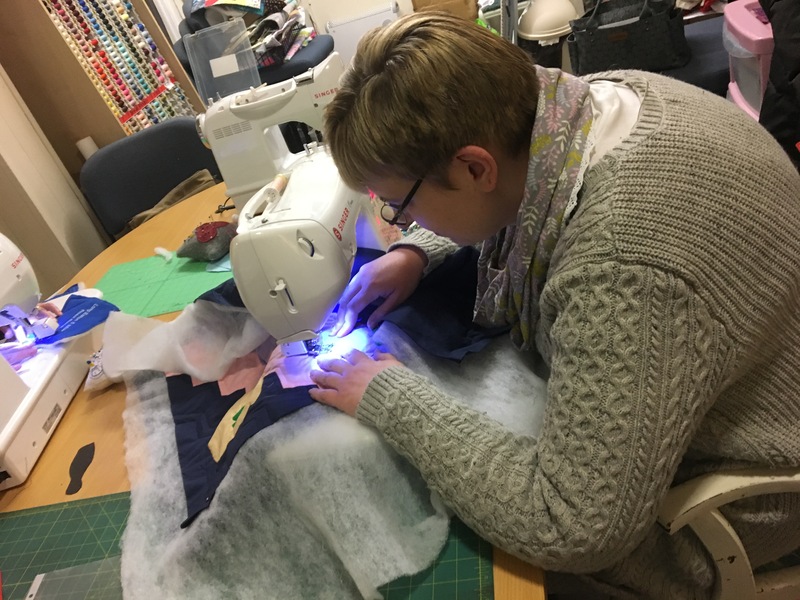 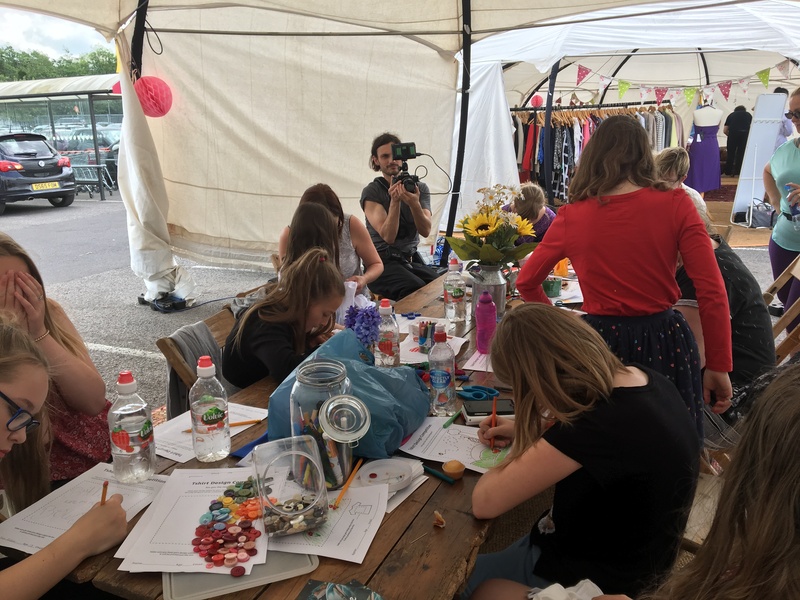 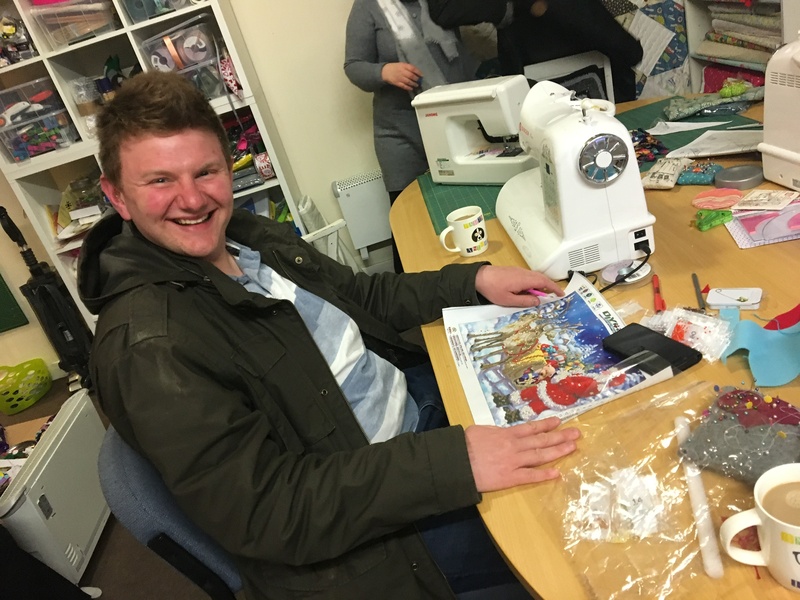 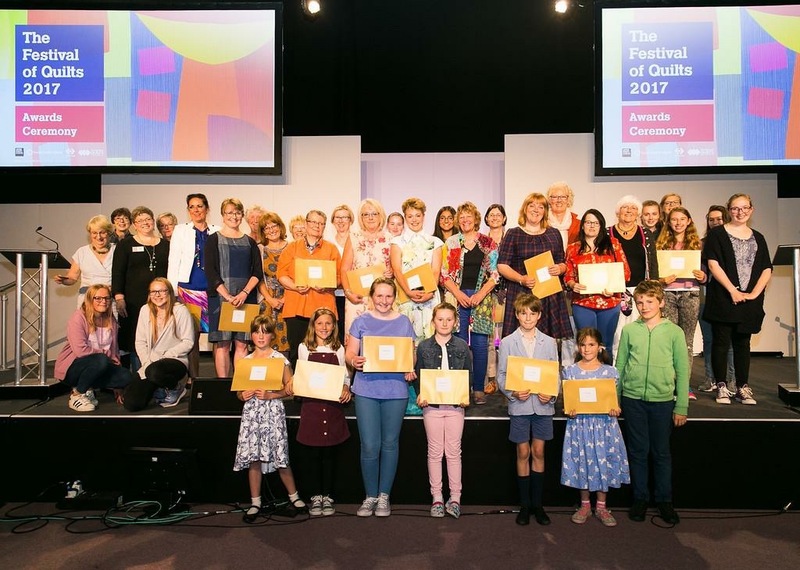 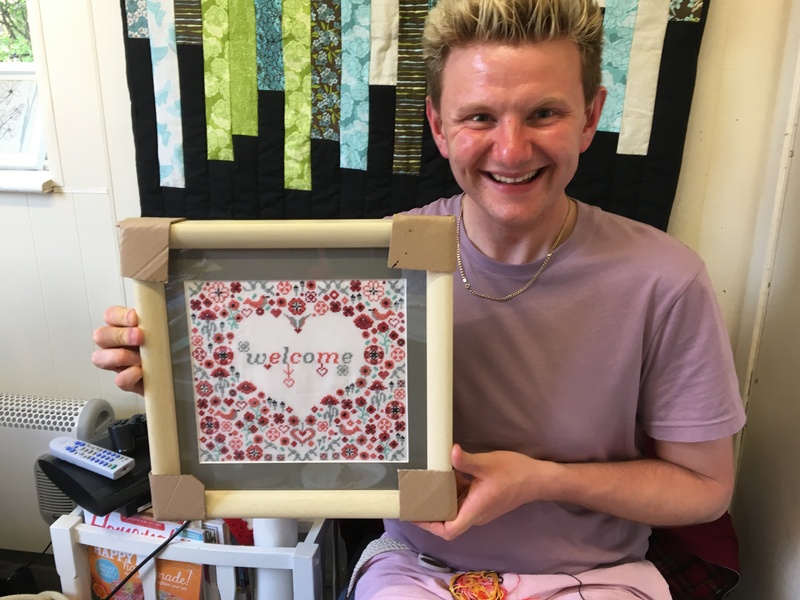 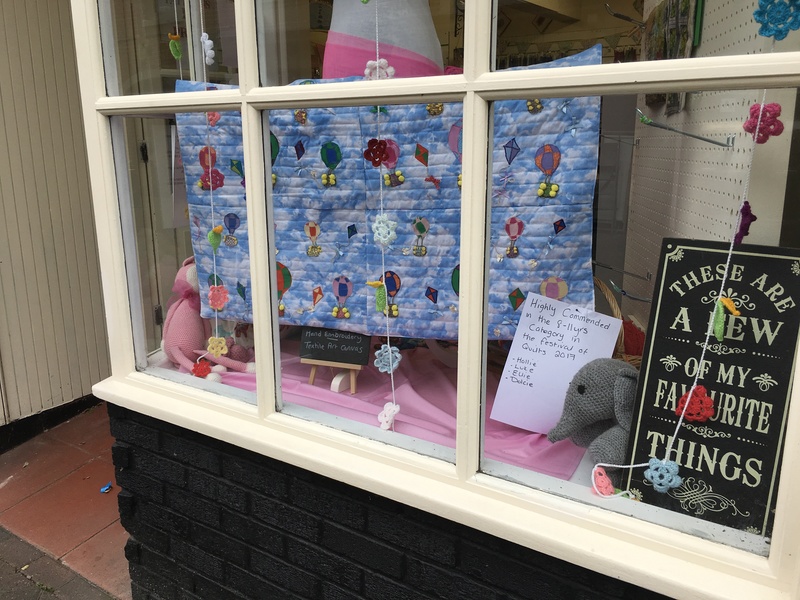 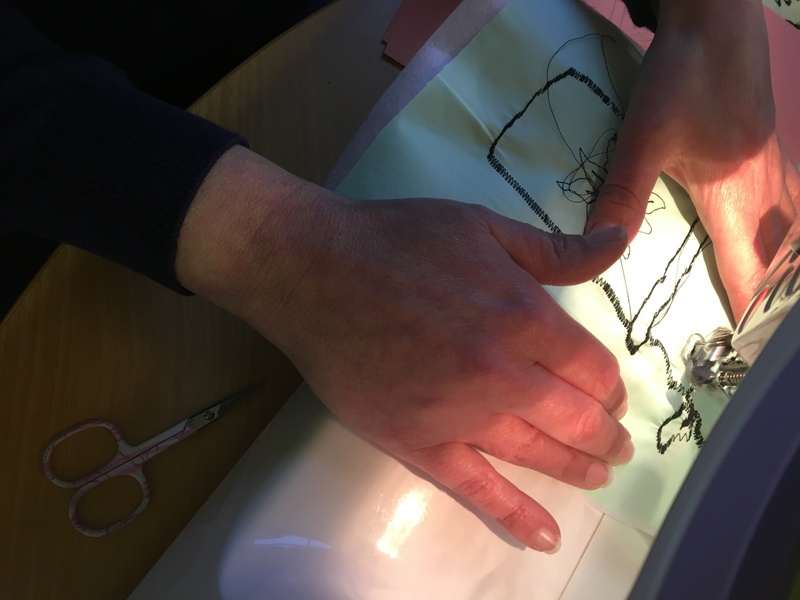 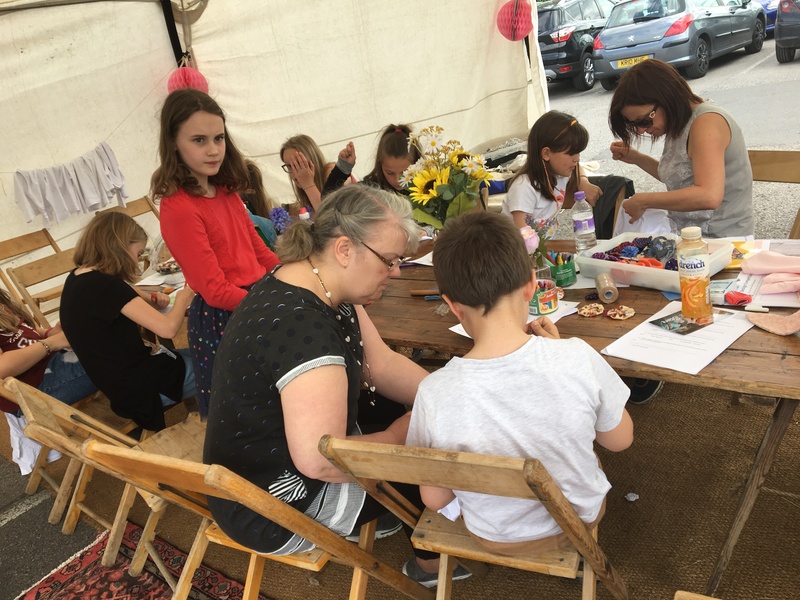 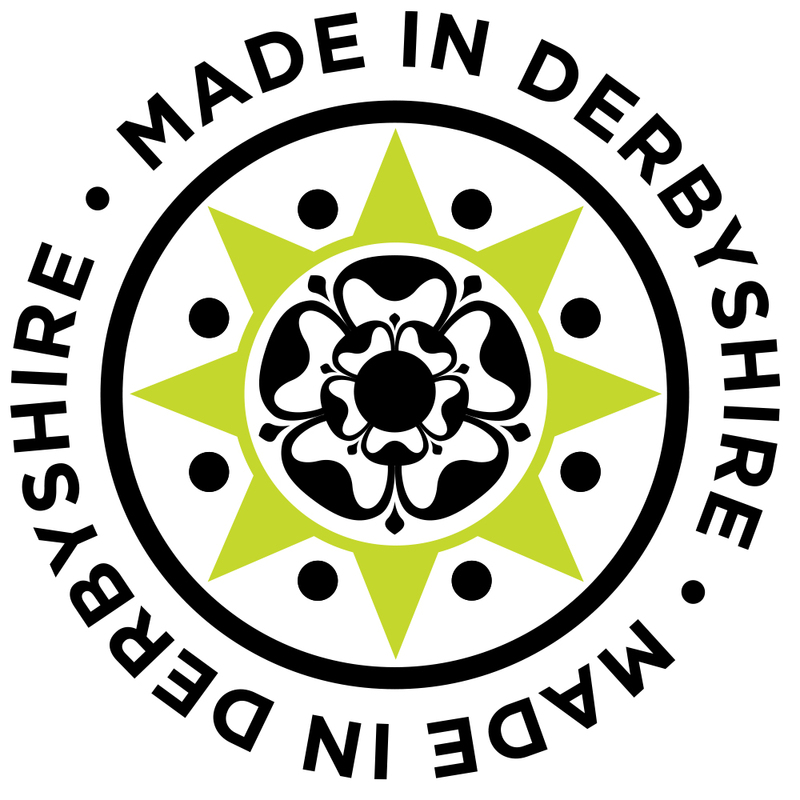 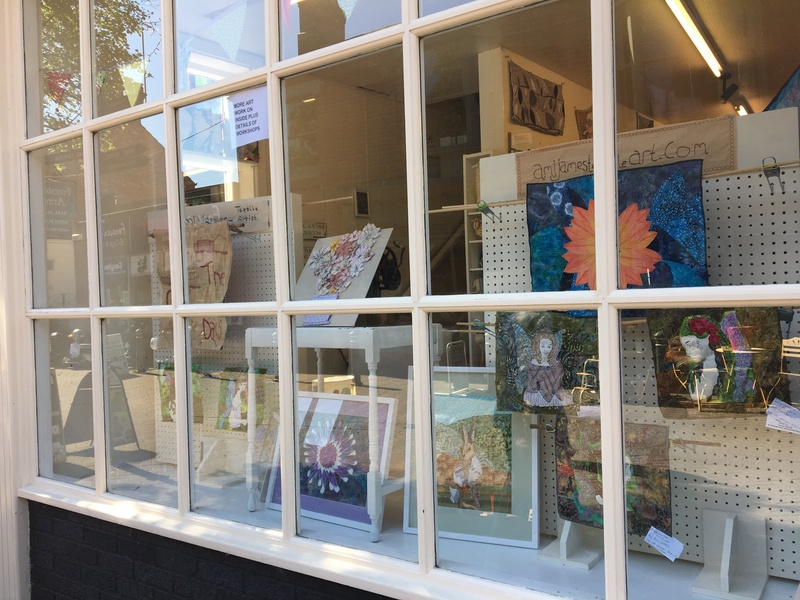 We had a wonderful time and even recruited a new young man into our Sewing Bee…..
Running on the same weekend it was Derbyshire Open Arts where the shop was turned into a gallery …. 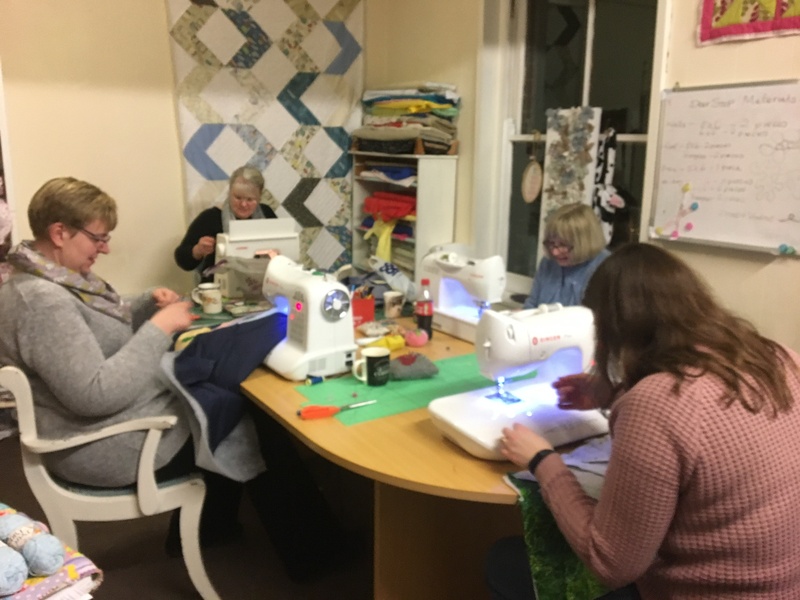 Our monthly Craft & Chat Night took place last week and again filled with a lovely bunch of crafters. 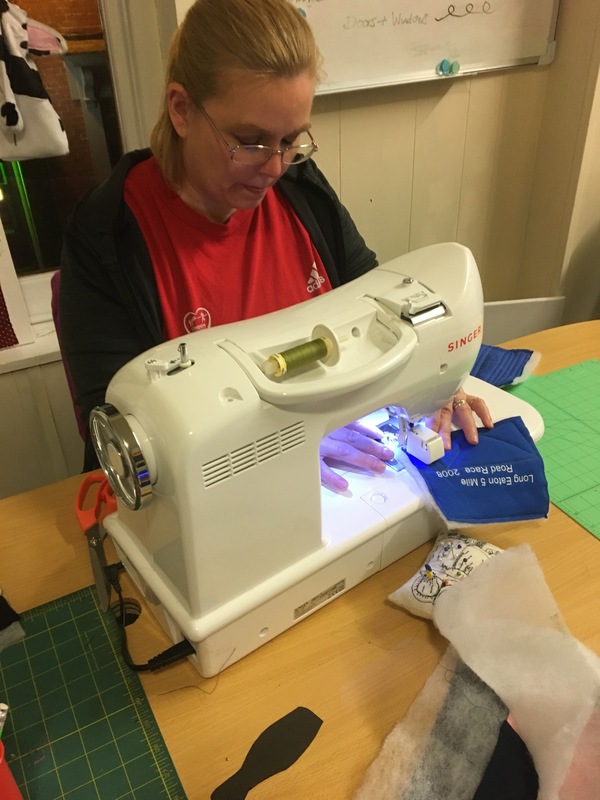 They run on the first Thursday of every month 6.00-8.30pm and costs £5 which includes cakes, tea and coffee. 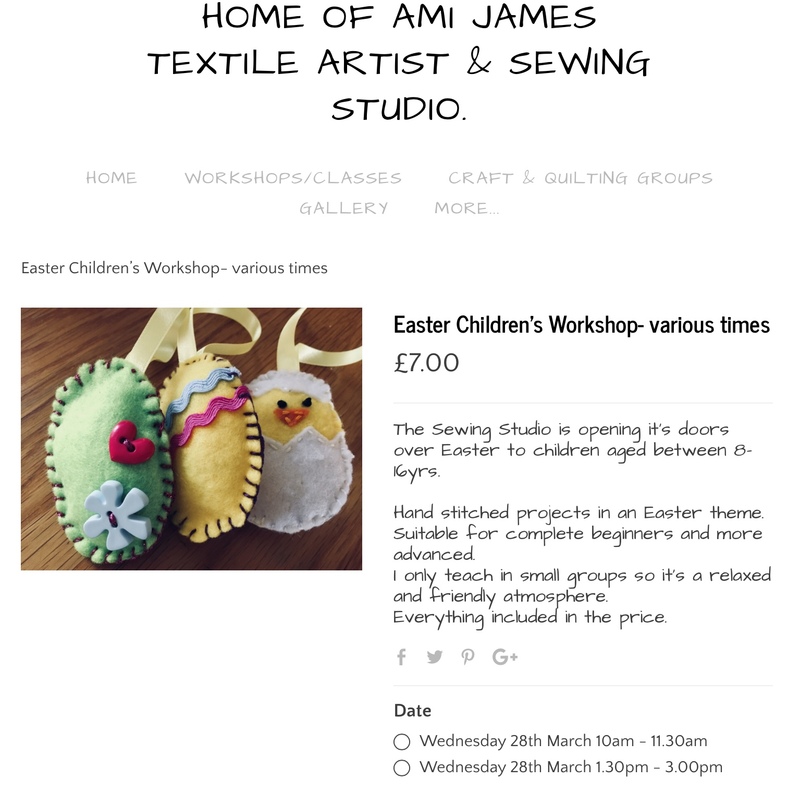 If you would like to join us just pop along. 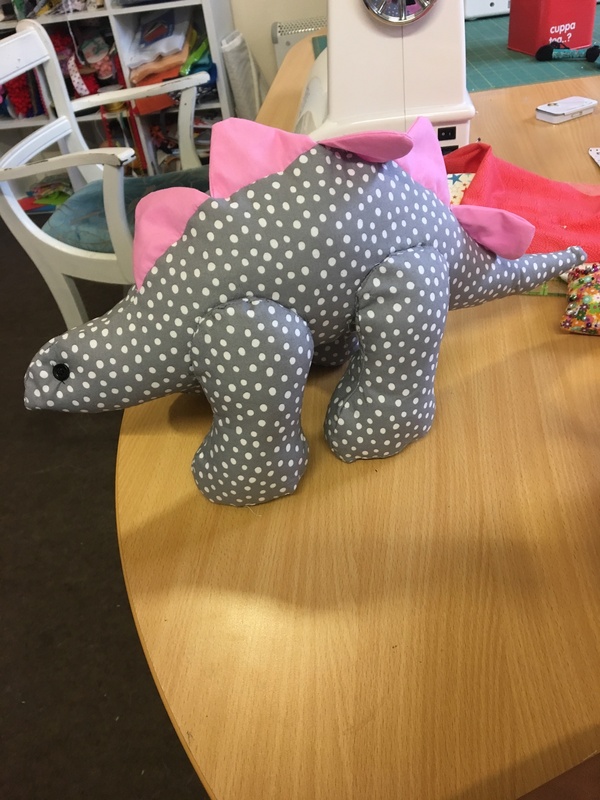 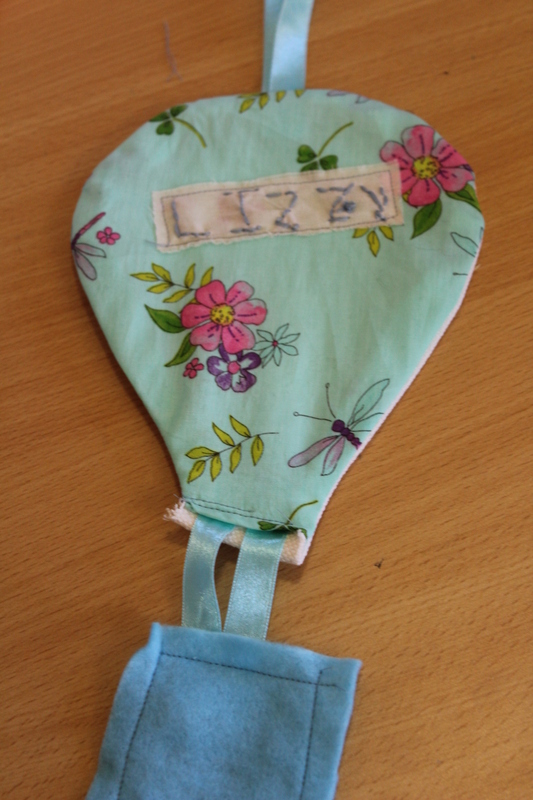 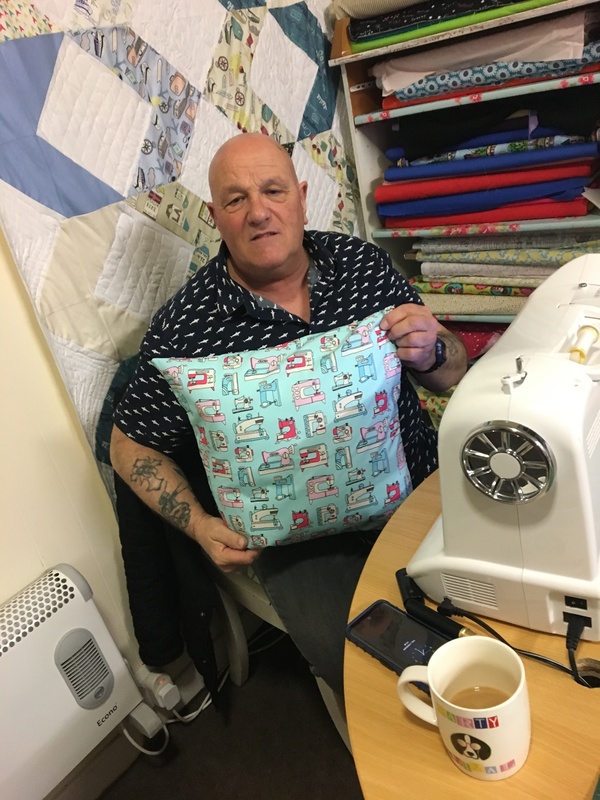 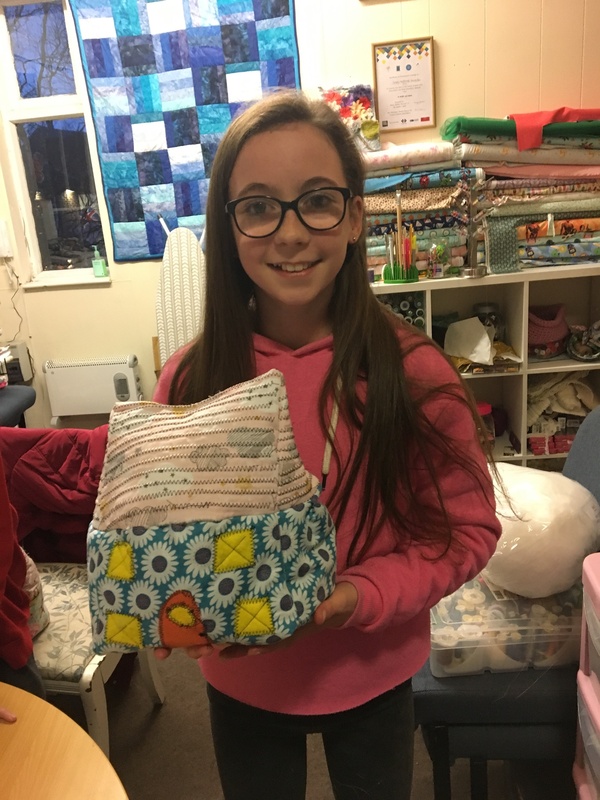 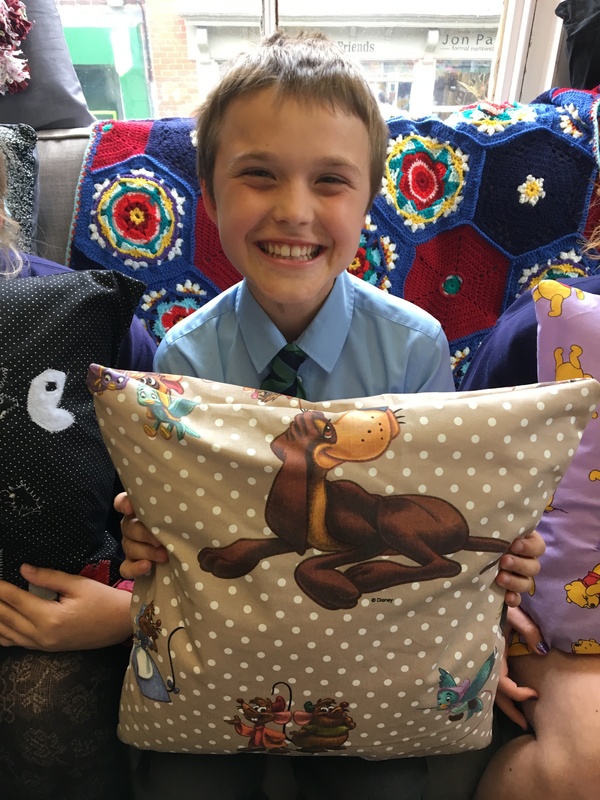 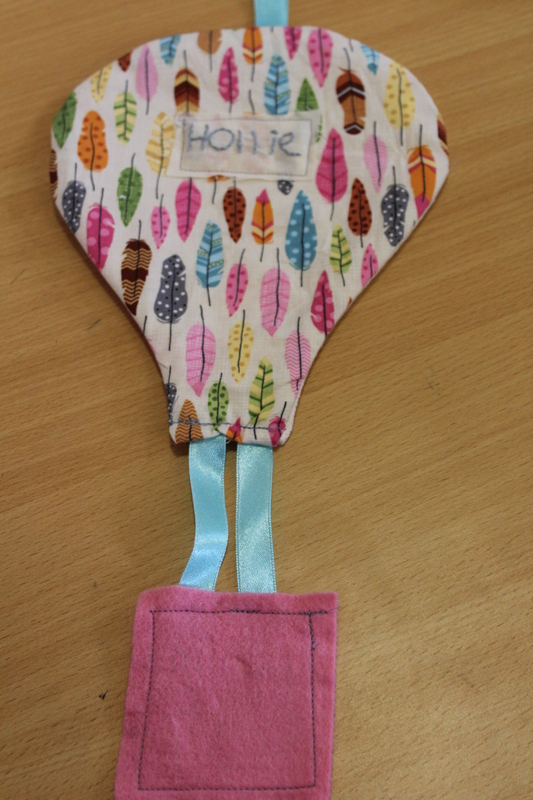 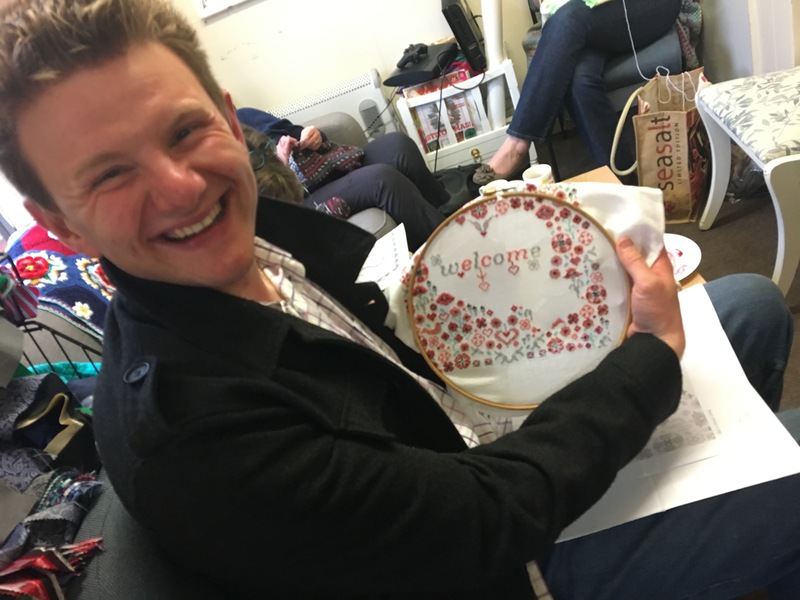 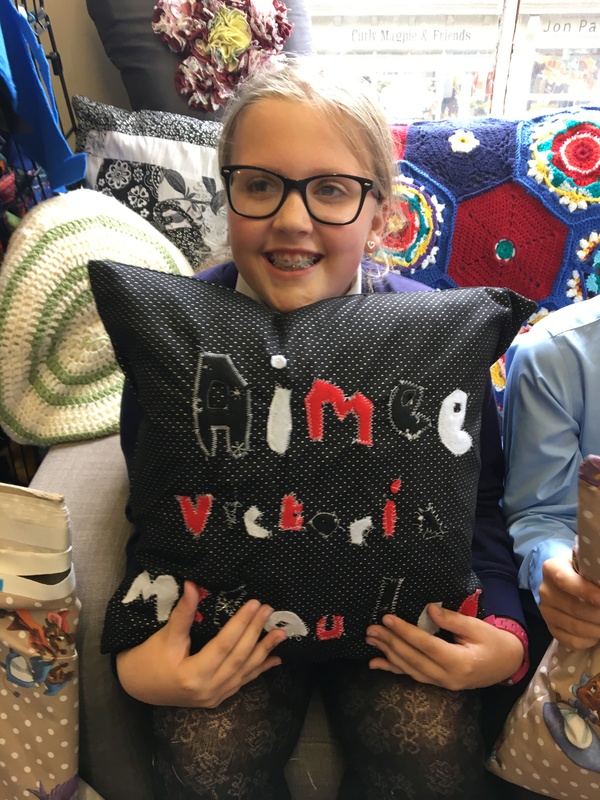 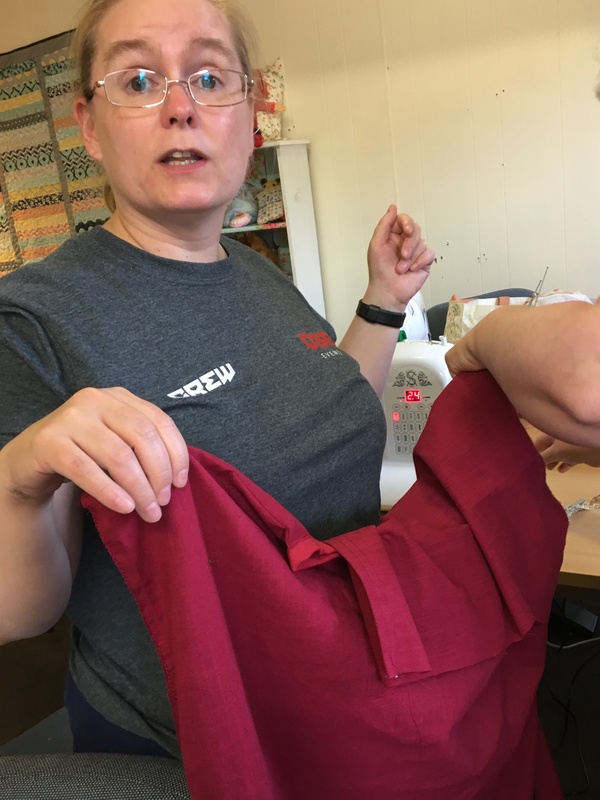 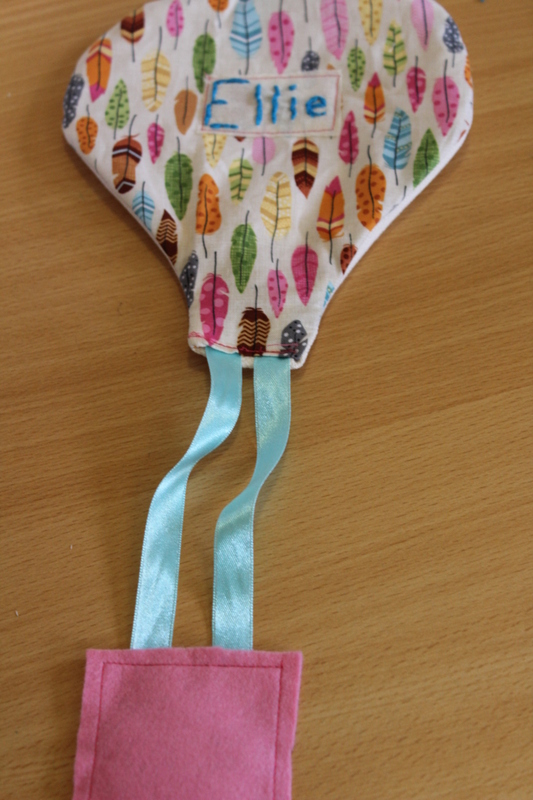 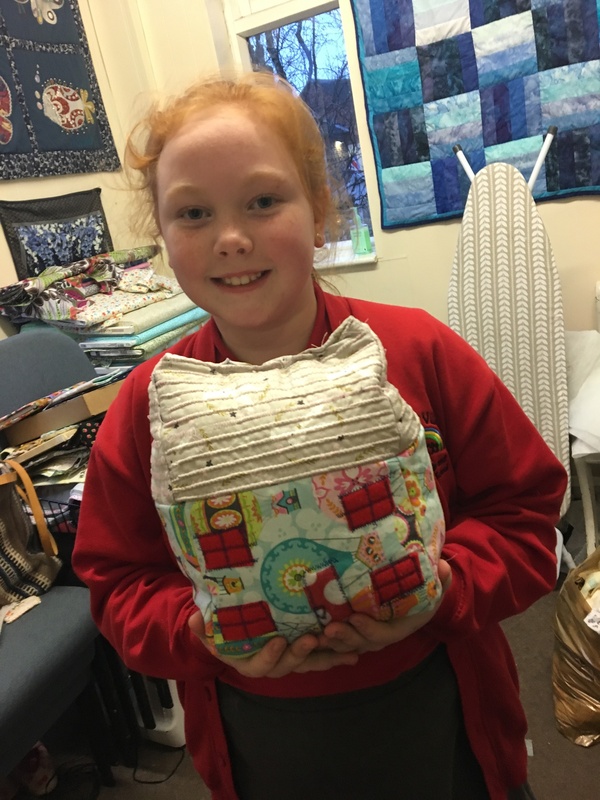 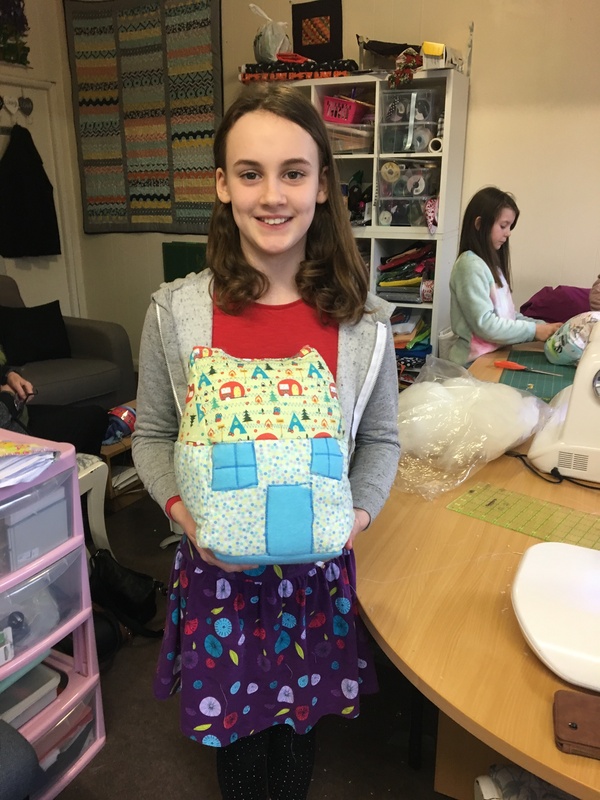 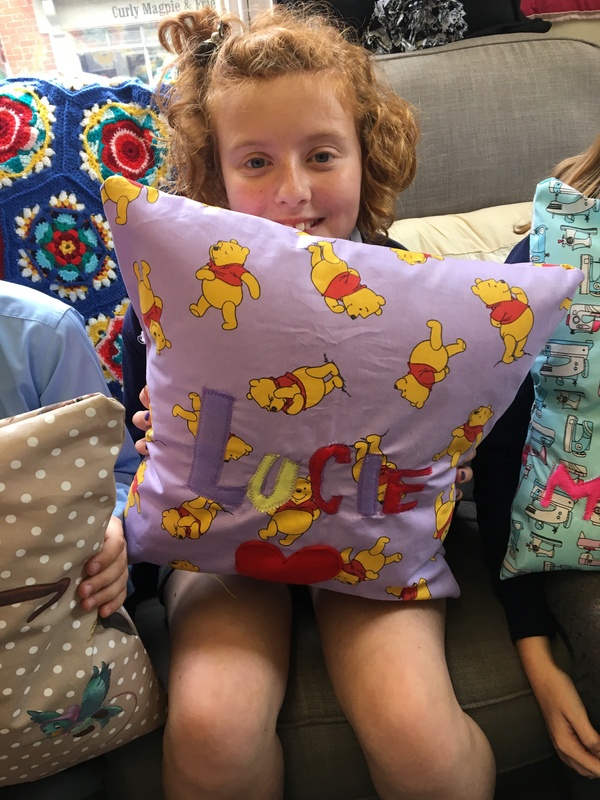 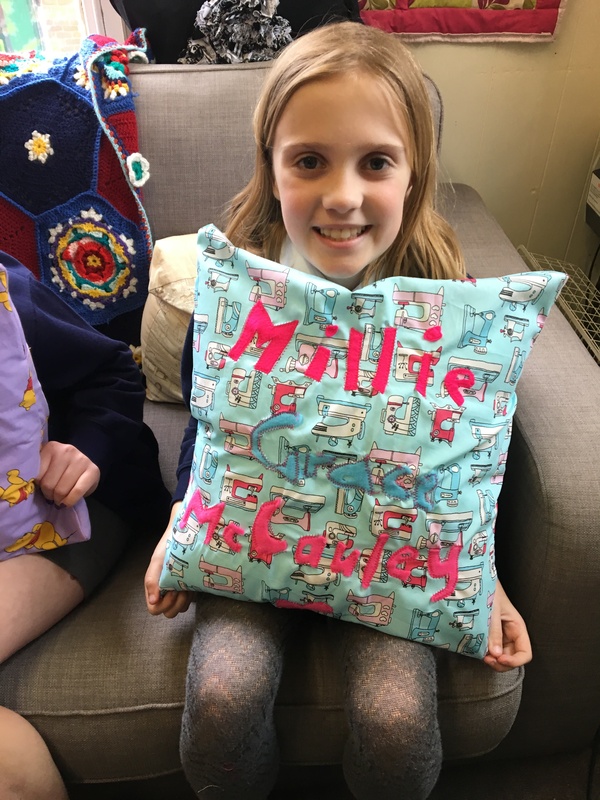 On Monday this week our Sewing Bee group finished their cushions and our newest member joined us……. 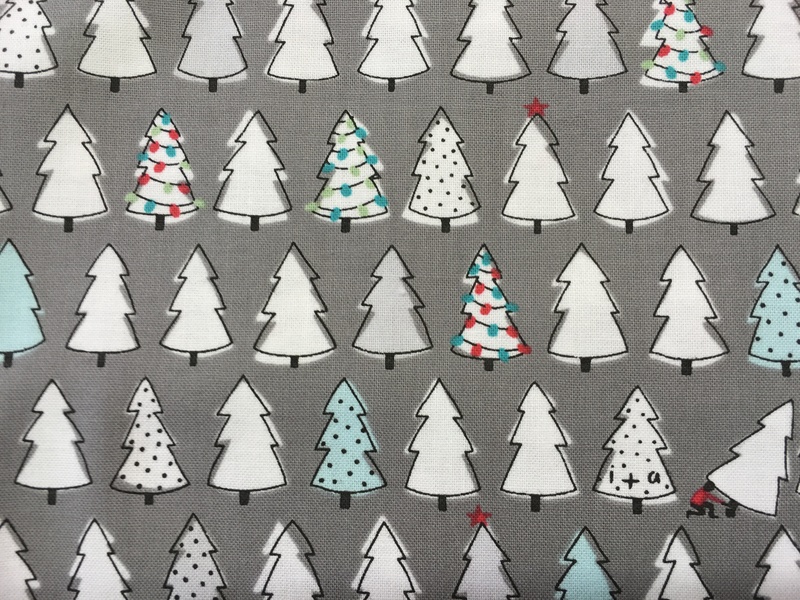 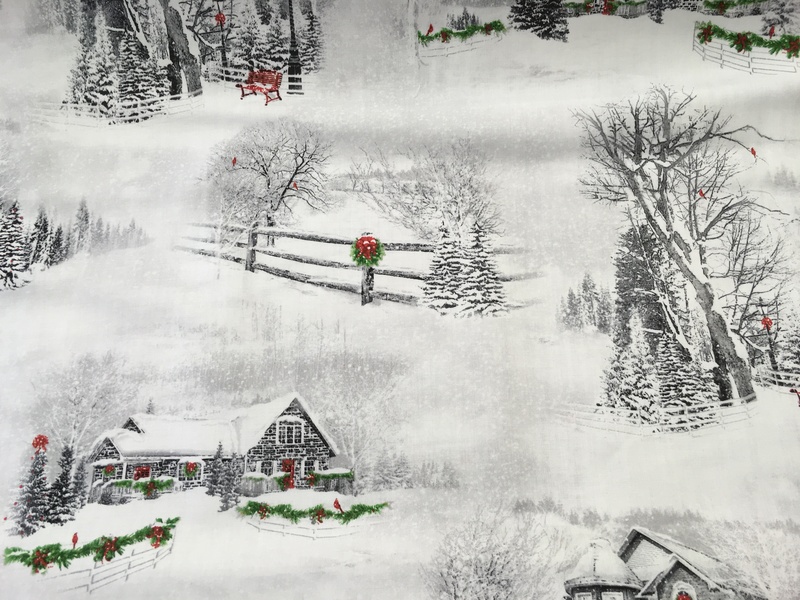 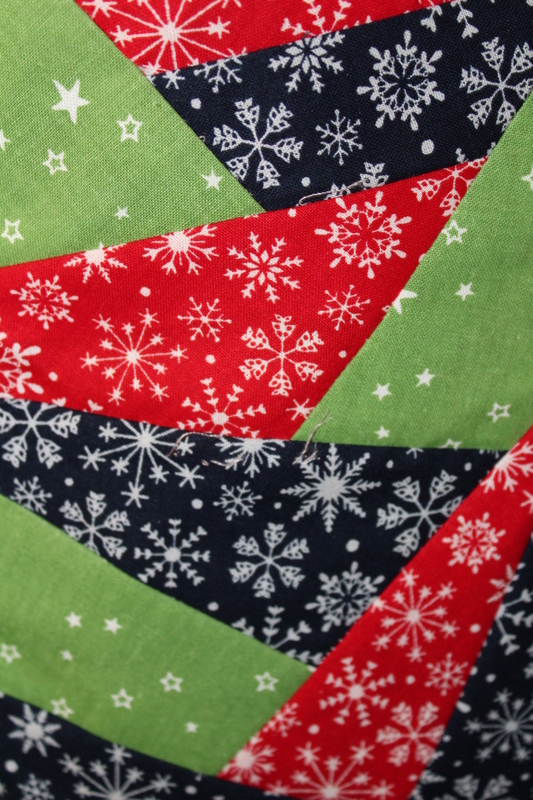 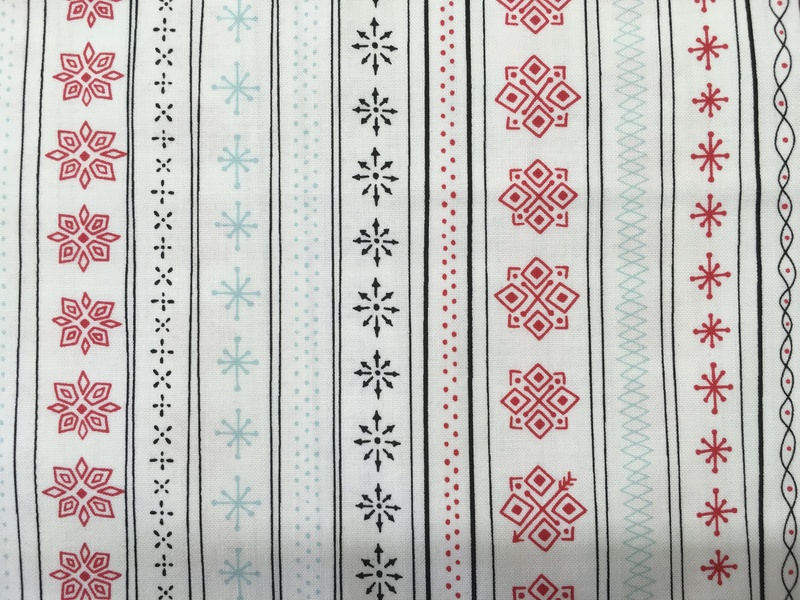 Now time for new stock and I have to confess we have started to have our Christmas fabrics in, plus new patterns and trimmings…..
Don’t forget I also run workshops in various different techniques and you can find them all on the website. 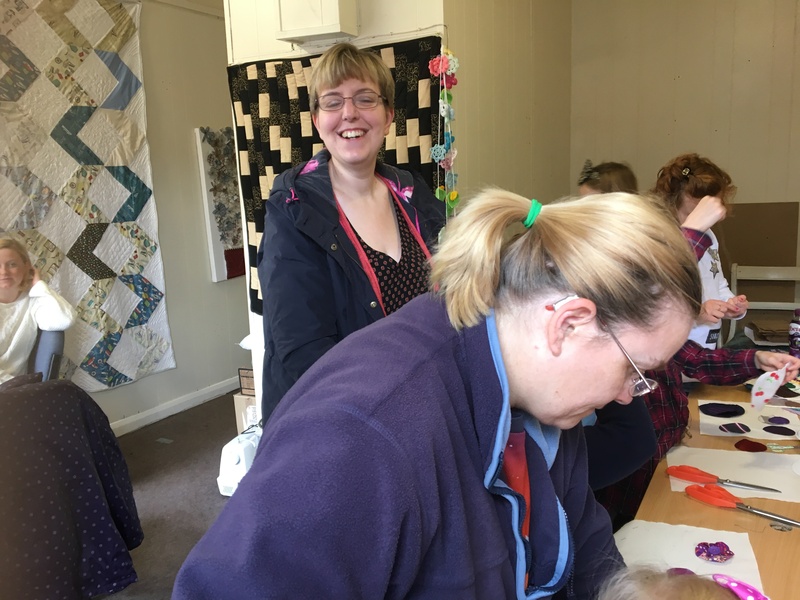 Please note there is only one more beginners quilting pencilled in at the moment until Autumn as I’m snowed under with other commitments…. 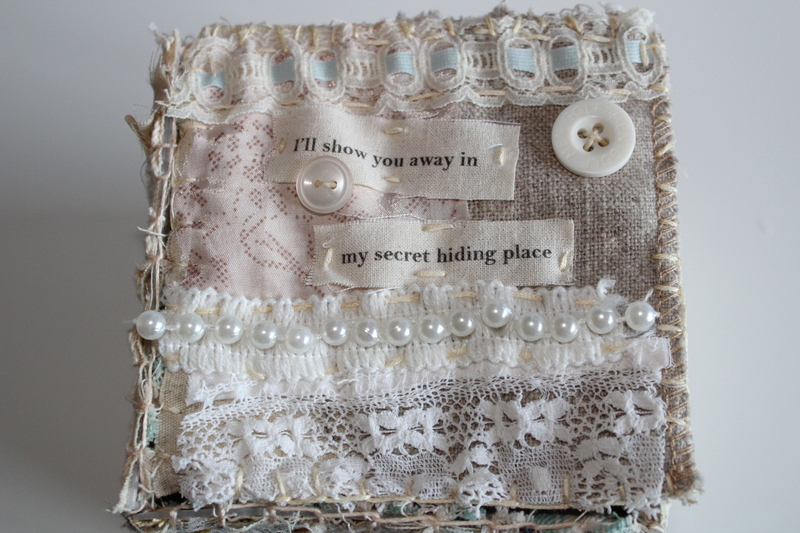 where you can view my blog, exhibitions and work. 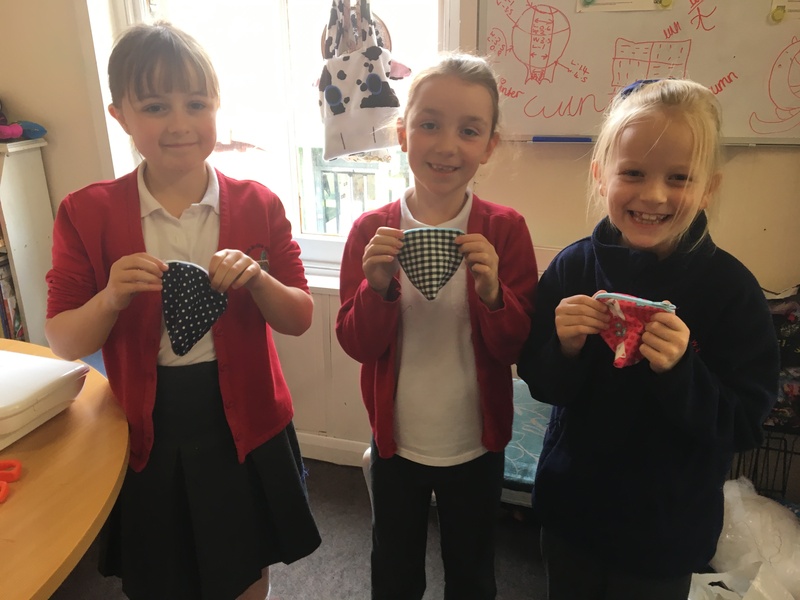 Thank you reading and keeping up to date with all of our news.